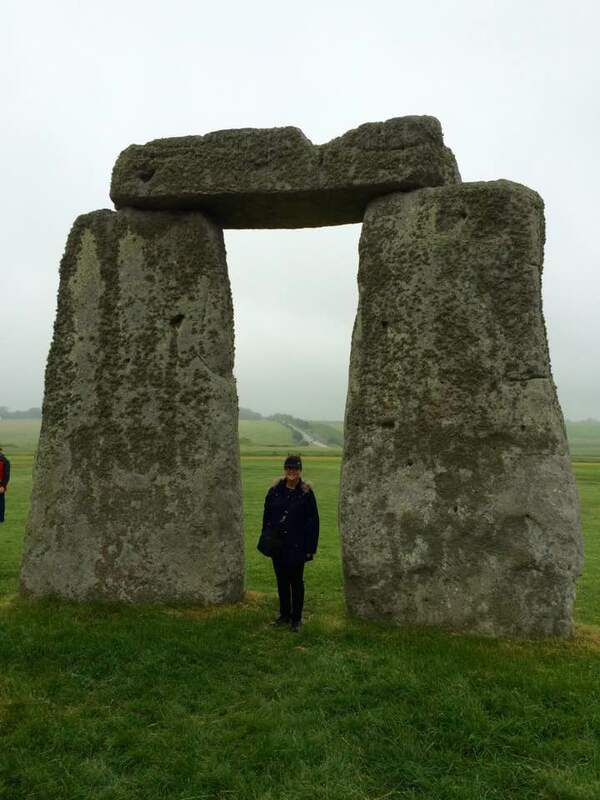 During the last two years I’ve been lucky enough to be able to visit the UK twice. 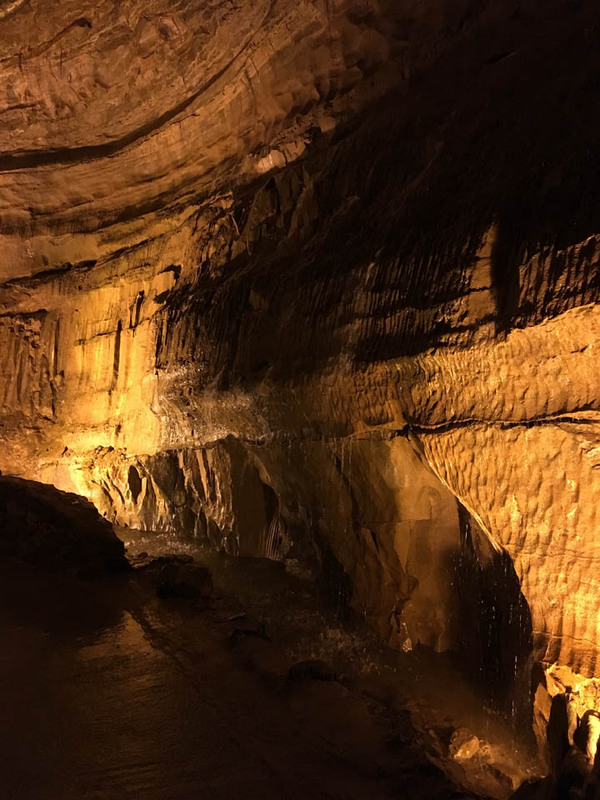 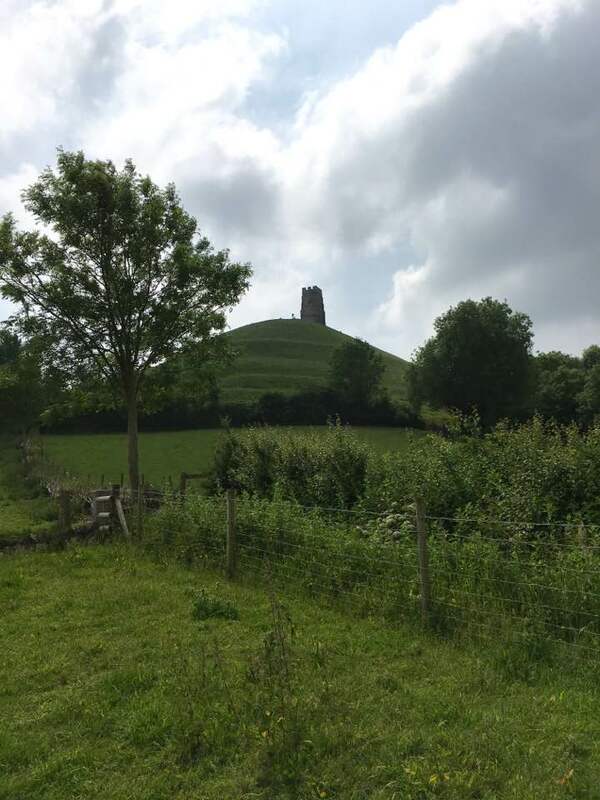 On our first trip, in 2016, we (husband and I) concentrated our travels around the south of England during our 3 week holiday. 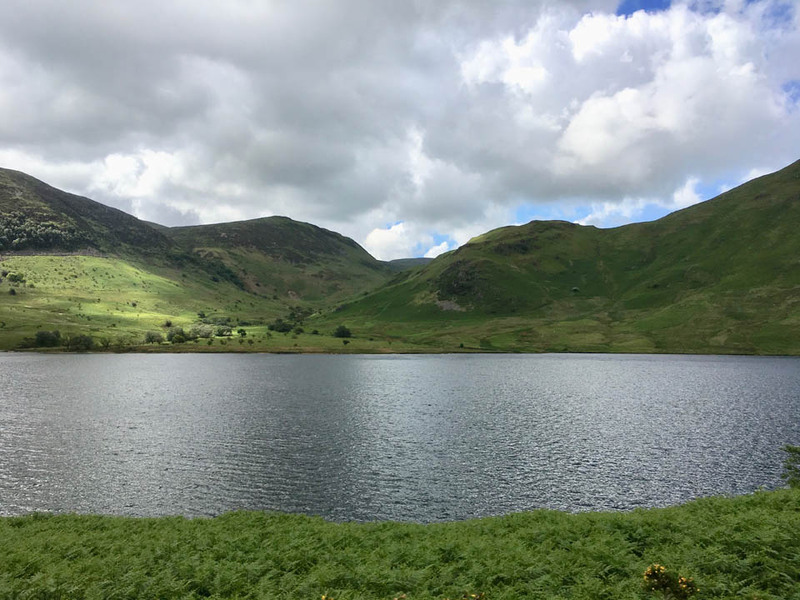 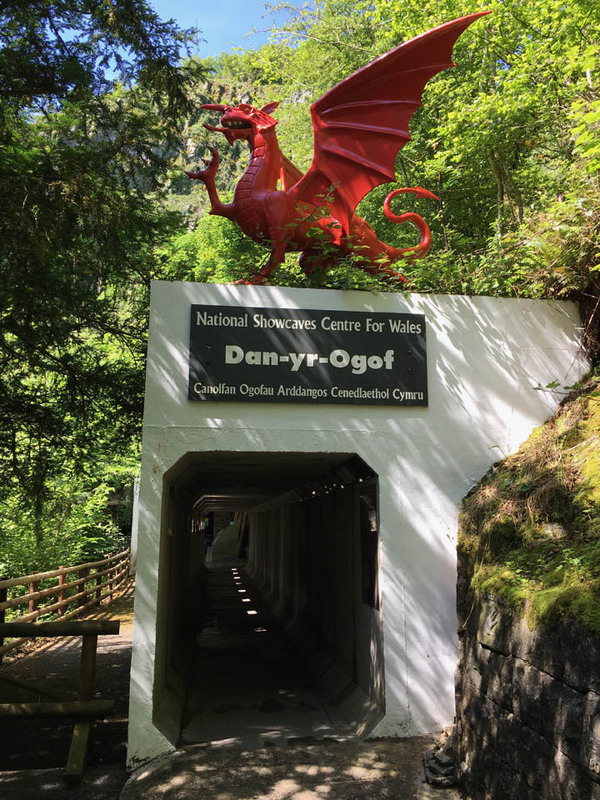 On our 2nd 3 week trip to the UK in 2017 we travelled further north in England and also around Wales. 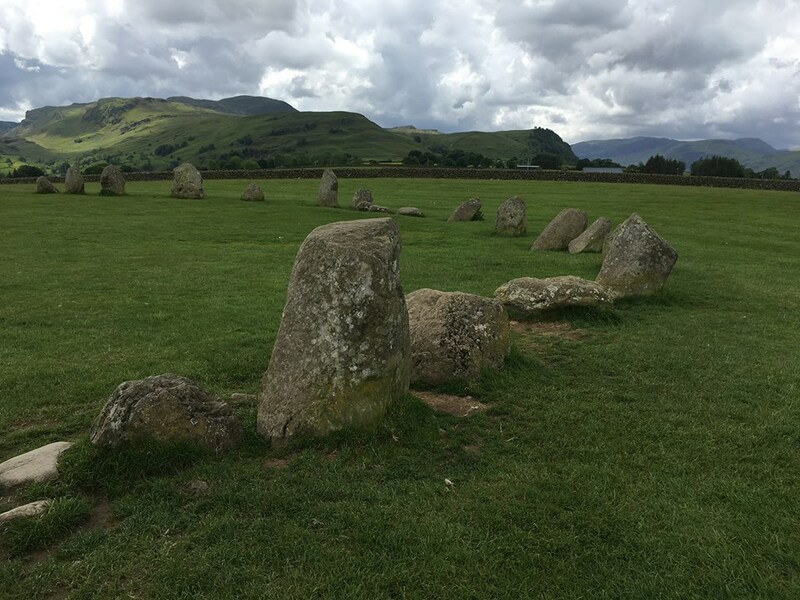 The few stone circles and other ‘dragony’ places I was able to visit were only some of the many locations we managed to see during our travels. 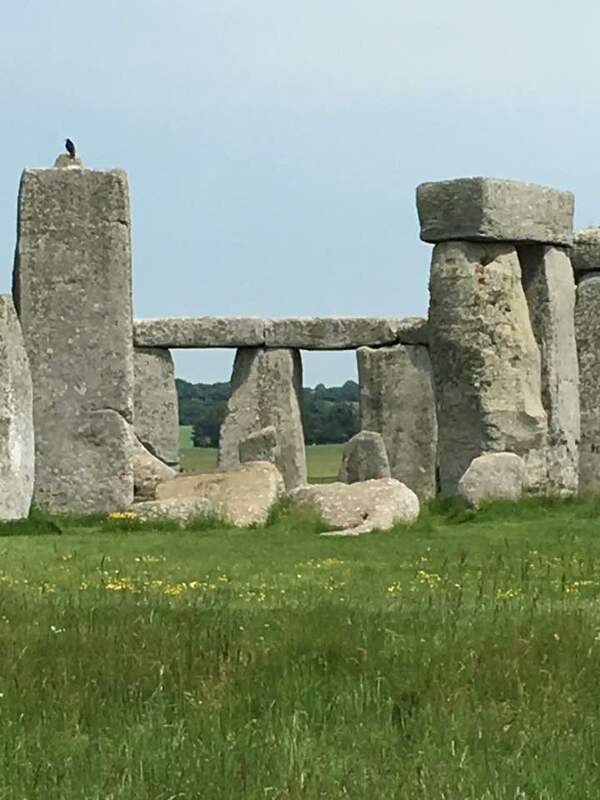 While browsing the displays in the visitors centre I happened to notice a rather interesting person standing in one corner of the room. 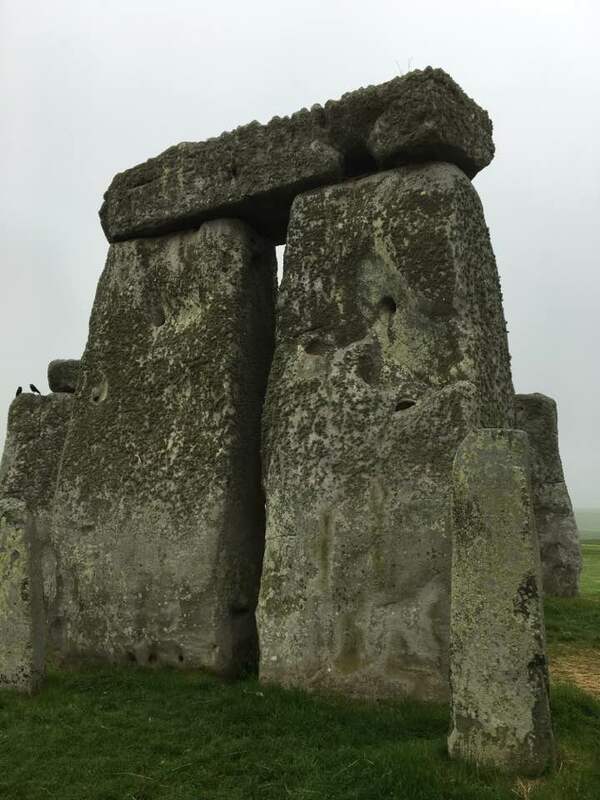 She looked very ‘pagan’ in her style of dress and was holding a most impressive staff with a carved goat’s head on the top. 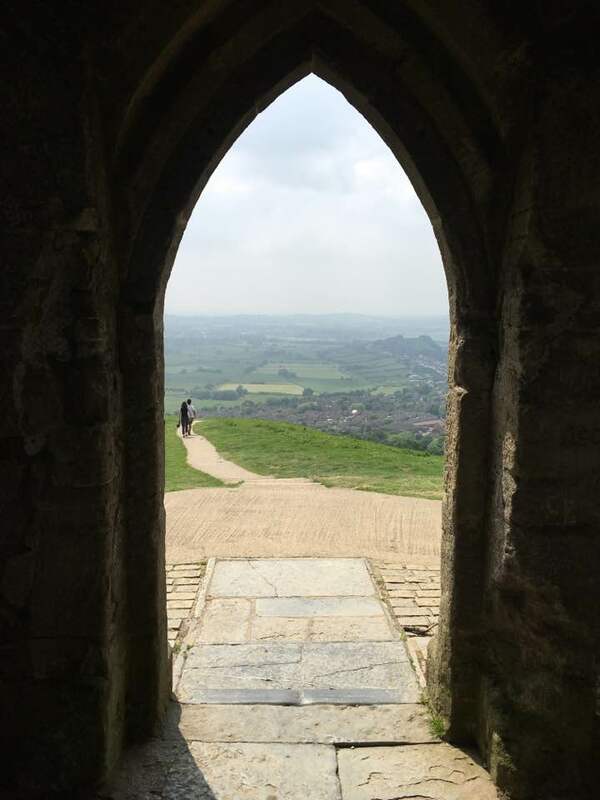 She looked like she was waiting for people to come over and speak with her — I was curious but far too shy, so I didn’t. 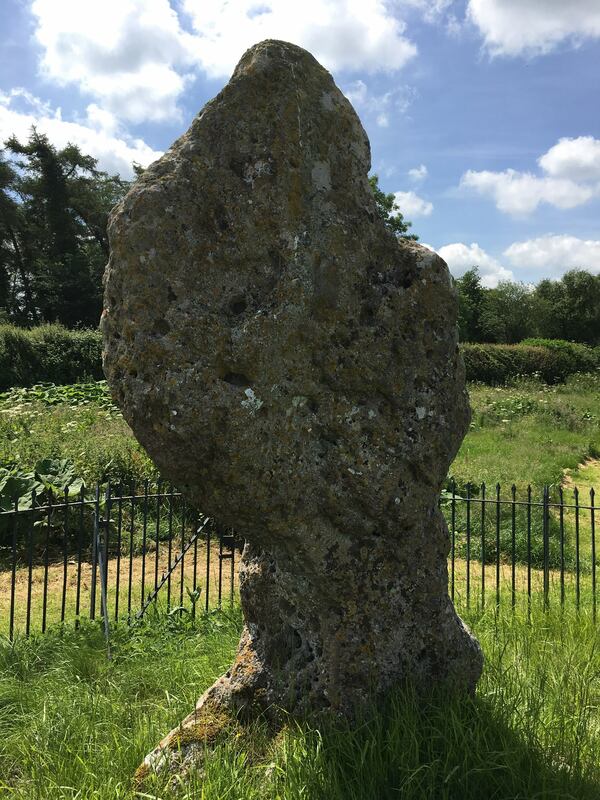 However, I did overhear part of the conversation between her and a woman who asked about her distinctive staff, which was about sensing energy, time, vortexes, intuition etc. 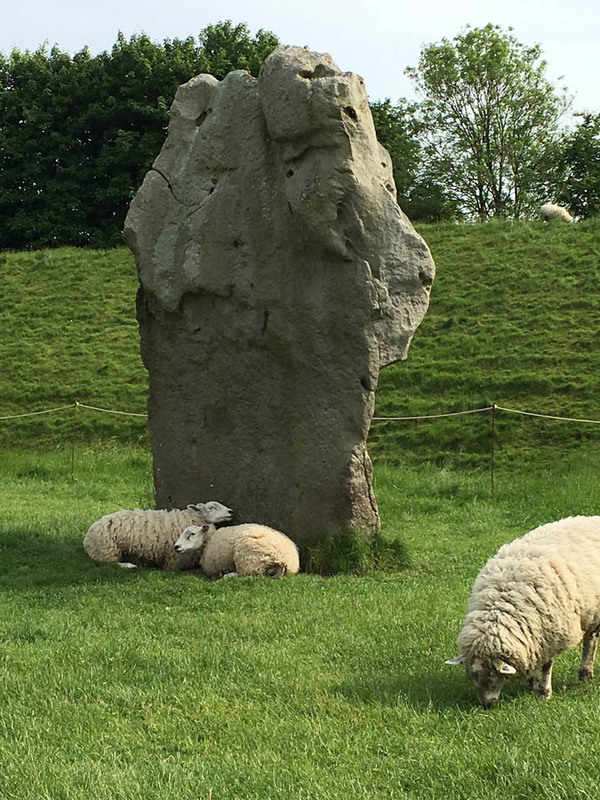 I Googled later to find out who the holder of the goat-headed staff was and found out she is Siobhan Peal, known as Stonehenge’s “Honorary Shaman”. 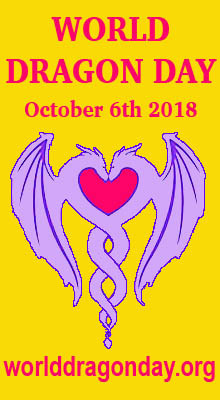 Her website is Talking with Capricorn. 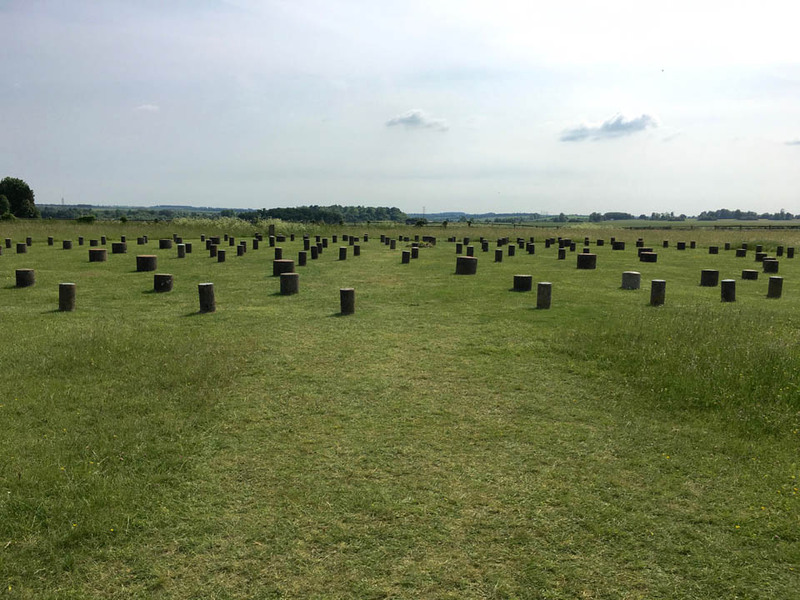 7th June 2016 — After Stonehenge we travelled to Woodhenge. 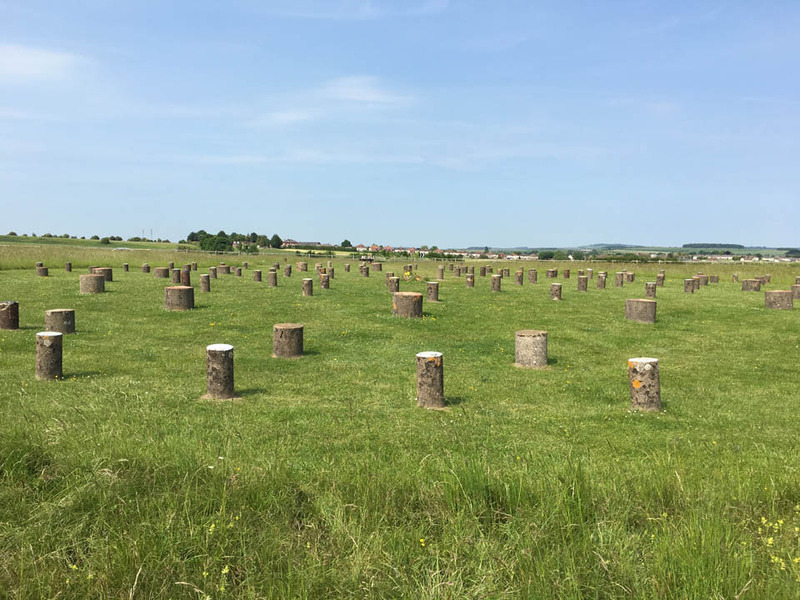 Although it had a certain ‘atmosphere’ about it Woodhenge didn’t conjure up the same feelings of mystery and excitement as I’d felt at Stonehenge. 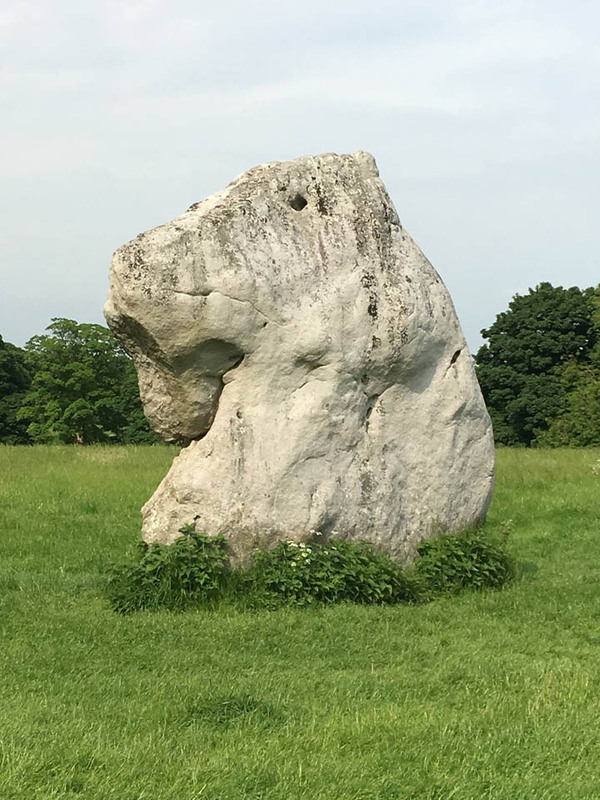 Of course, visually it’s not as interesting, but also ‘energetically’ I just wasn’t feeing anything much. 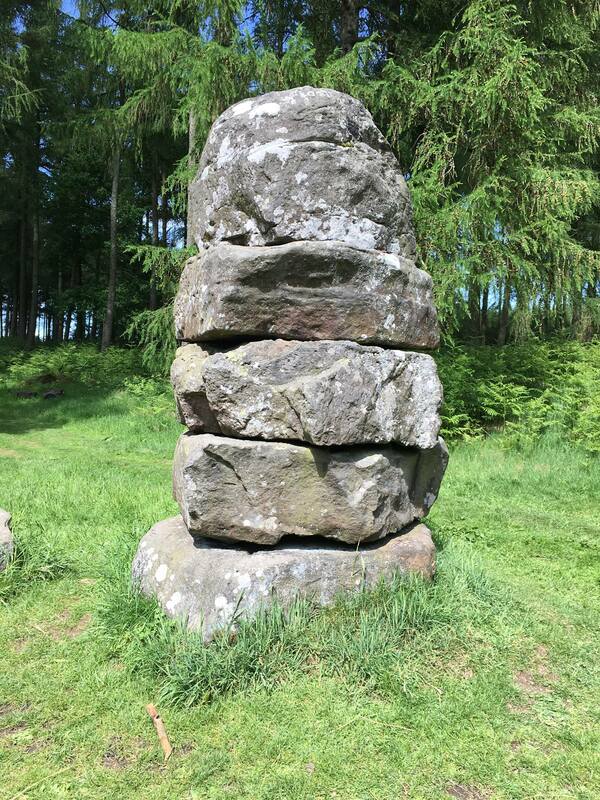 The positions of the original wooden posts are marked with stumpy concrete pillars which just don’t have the same aura about them as natural stones. 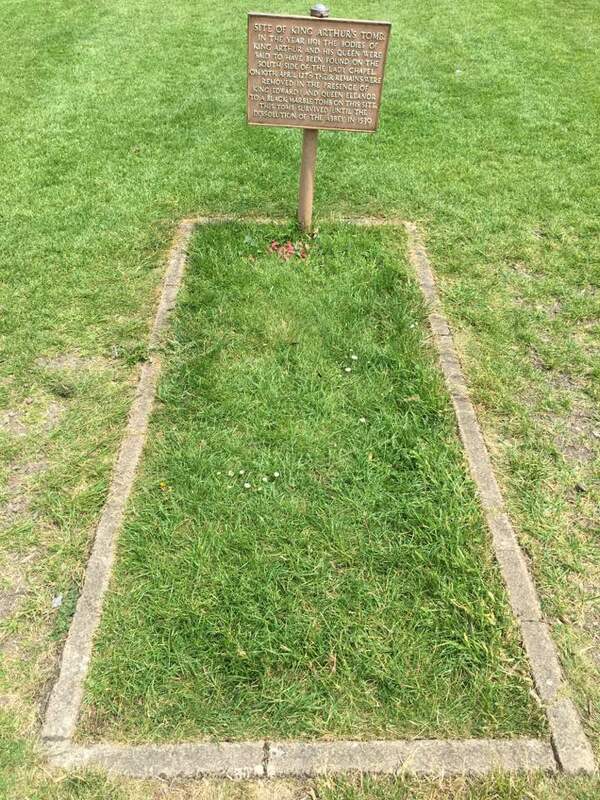 Read more at Wikipedia. 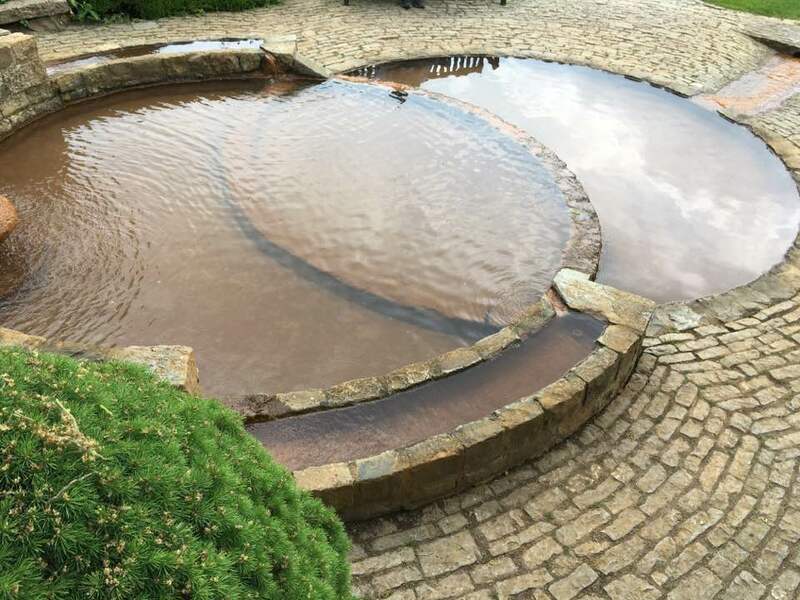 I could definitely sense ‘something’ but couldn’t relax enough to make a real connection. 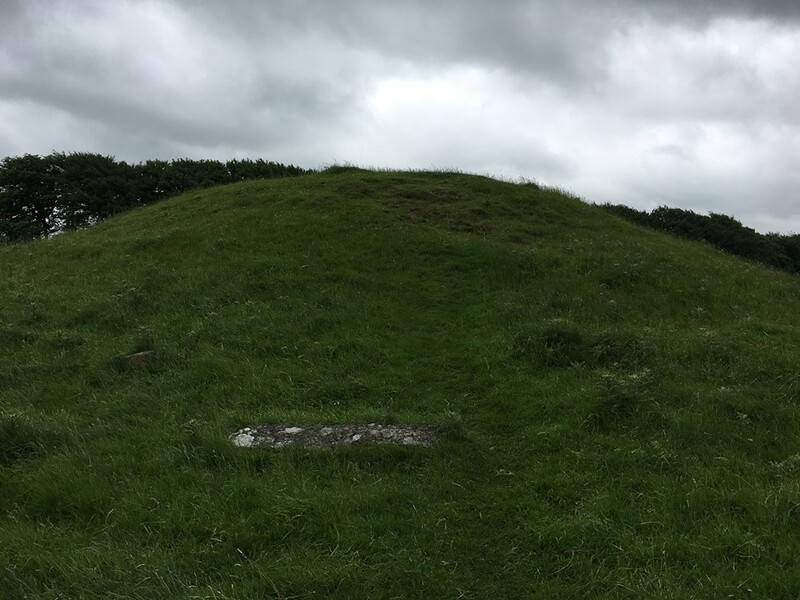 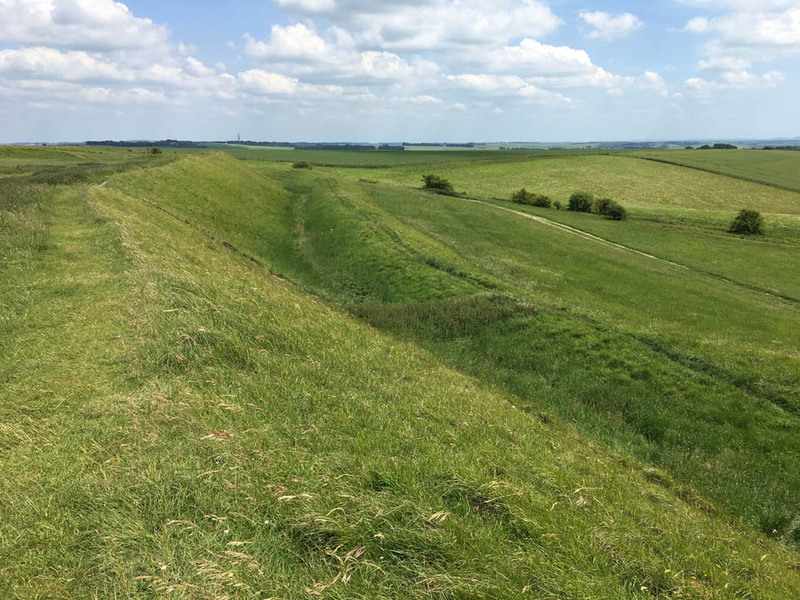 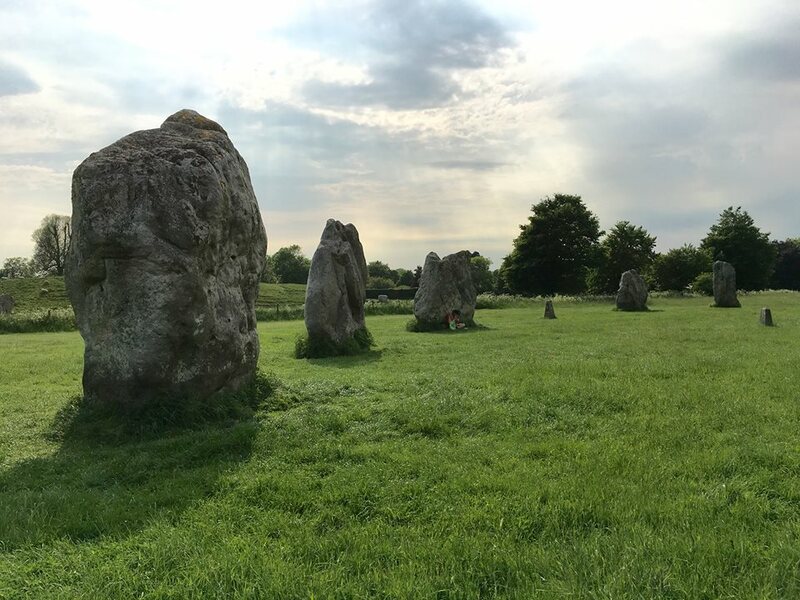 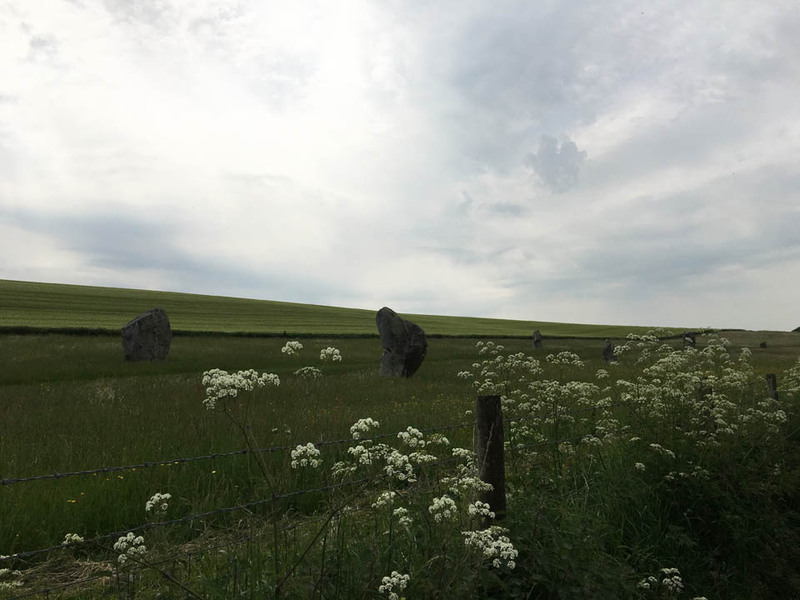 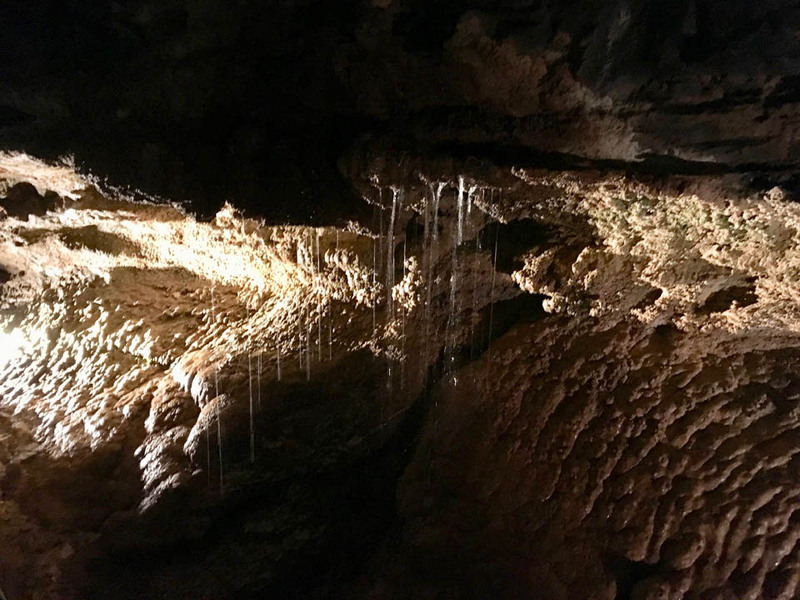 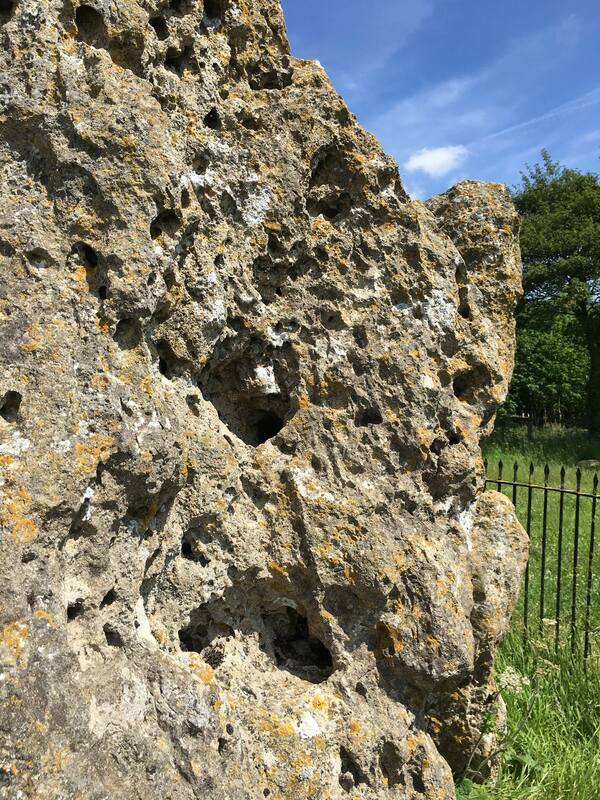 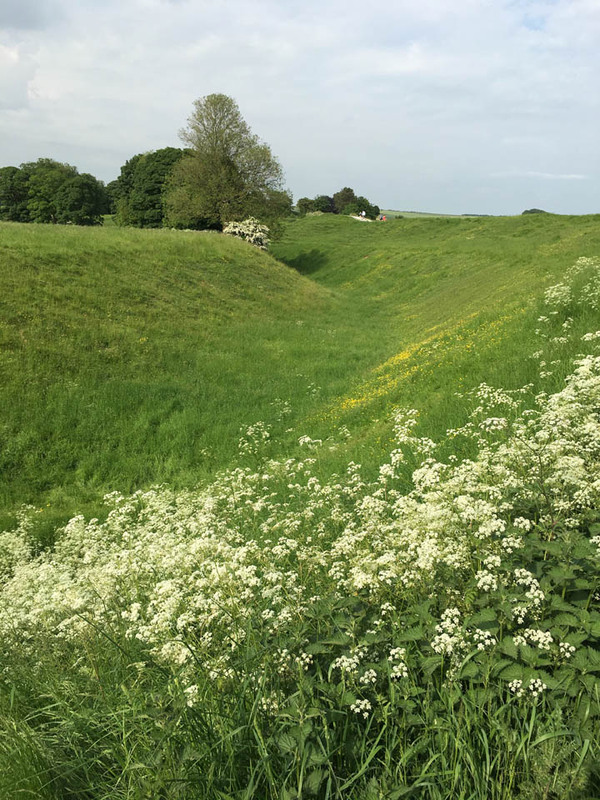 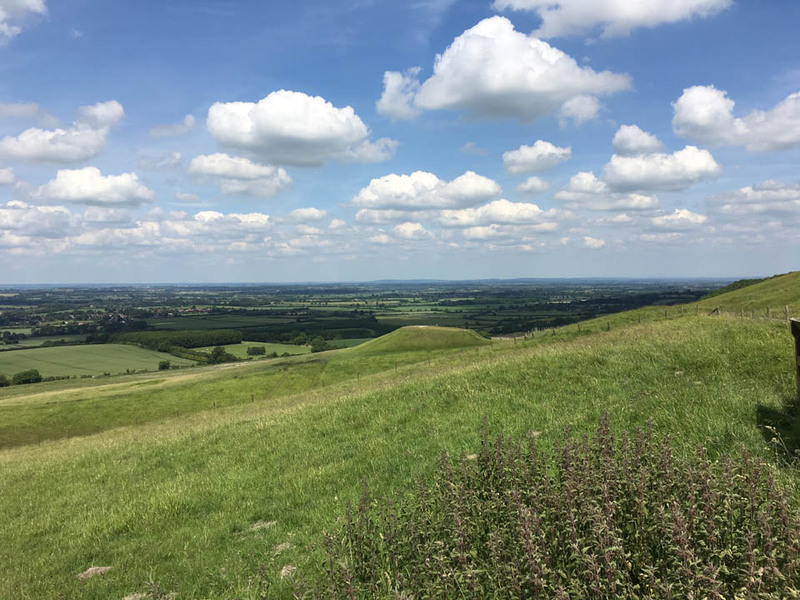 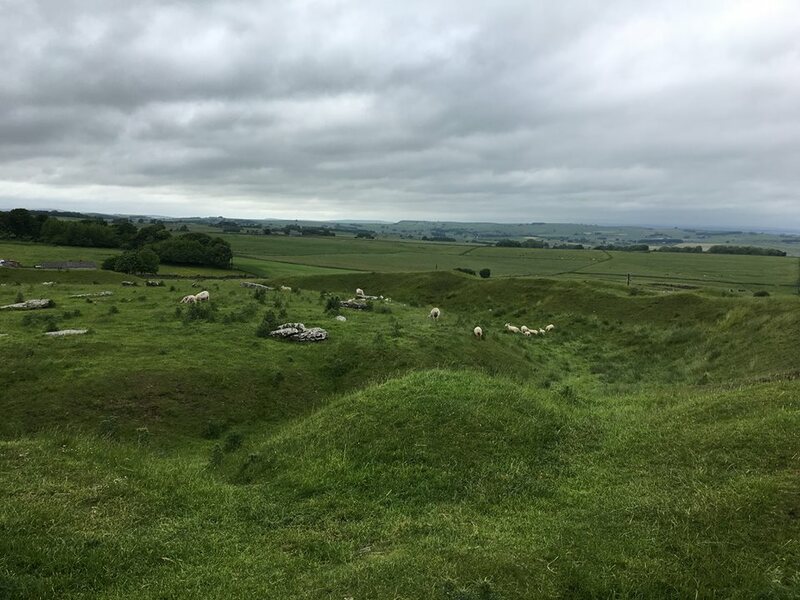 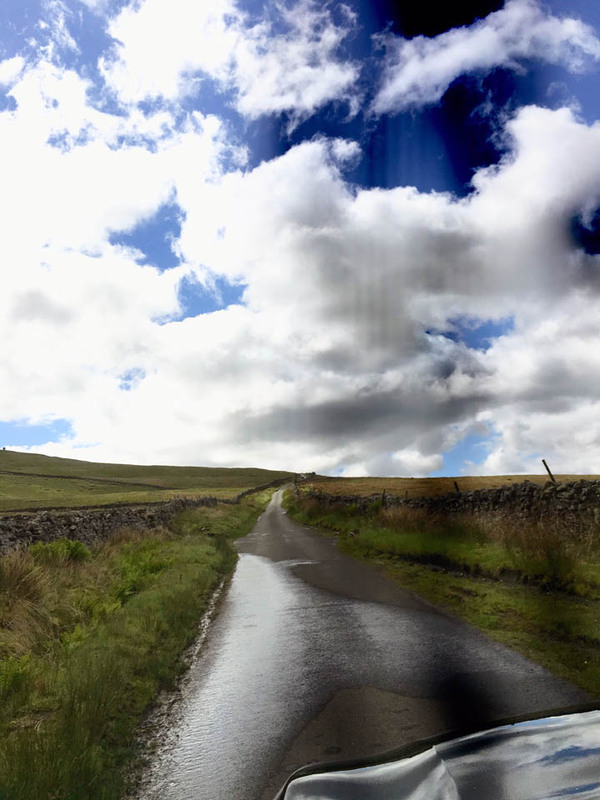 Sometimes now (many months later) when I look at these photos and remember, it’s almost like being there again so maybe I can connect to the Dragon of Avebury remotely through meditation. 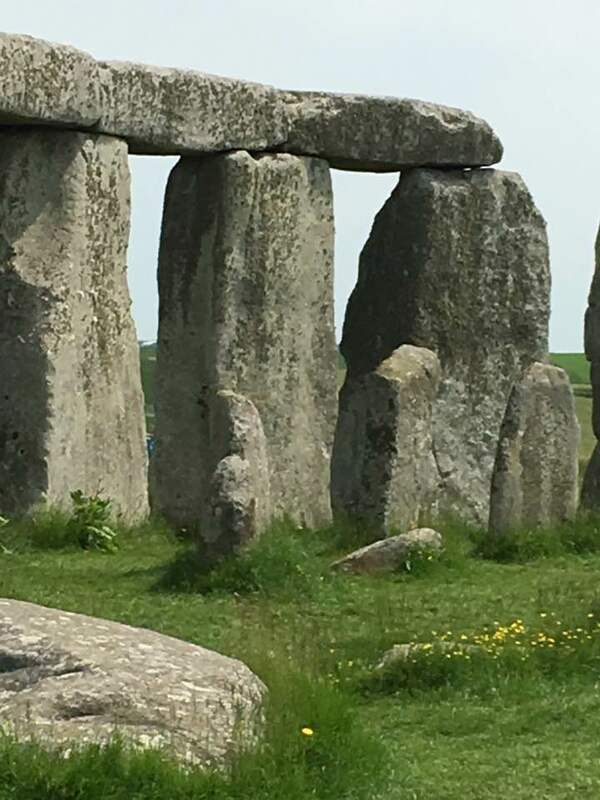 🙂 I would love to go back there again some day. 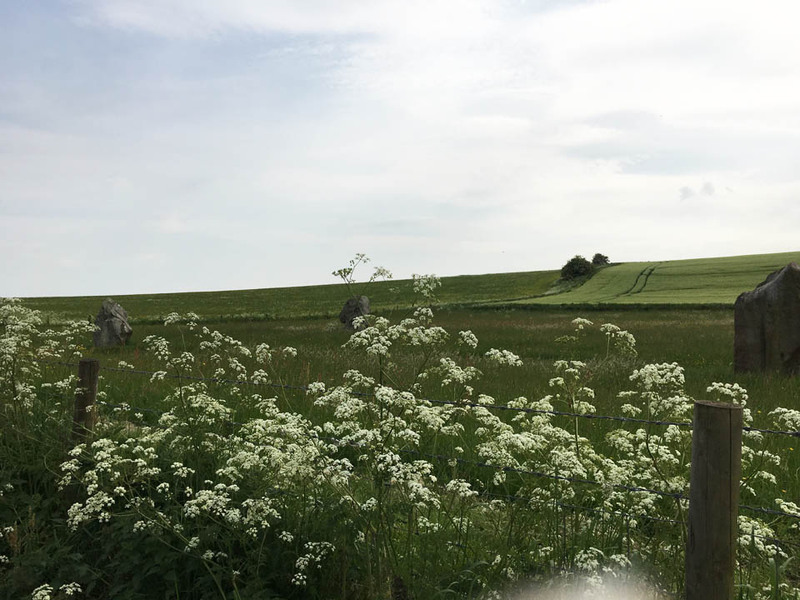 I found these wonderful articles called The Avebury Dragon Awakes ~ Summer Solstice 2013 and I spotted the Avebury Dragon during the Solstice. 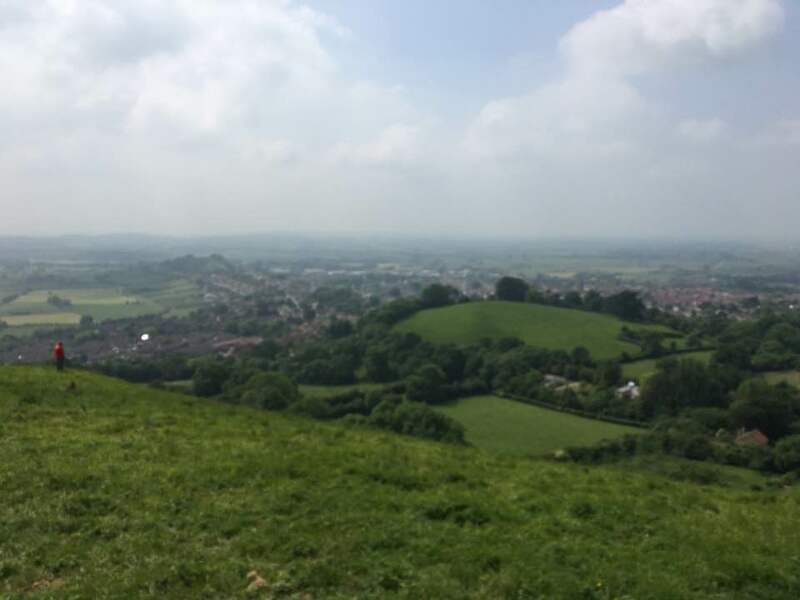 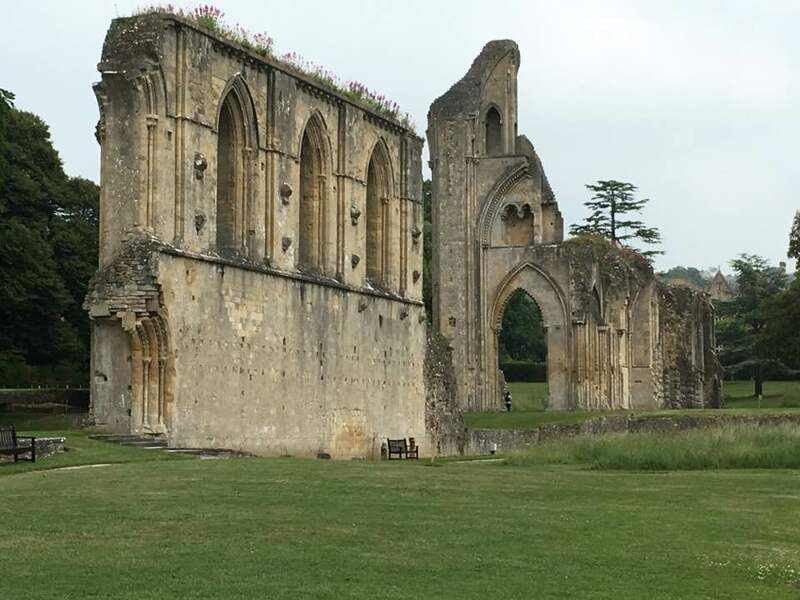 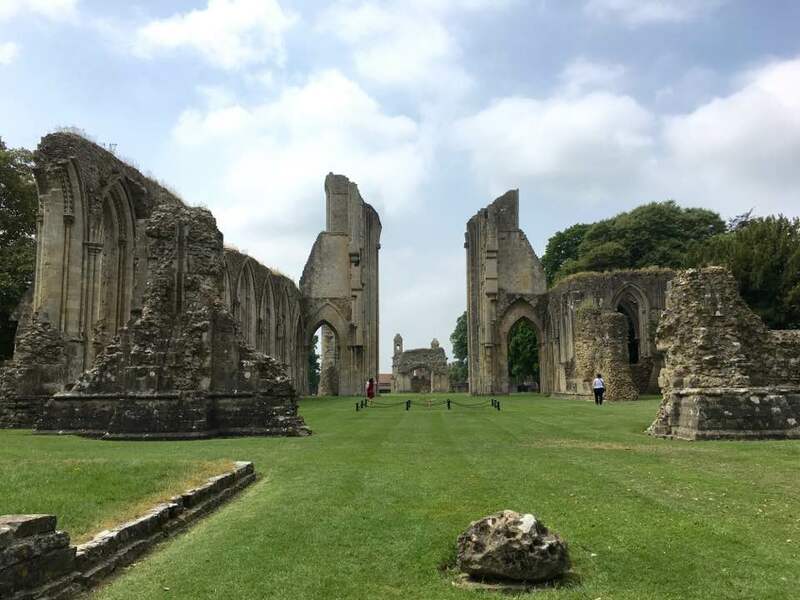 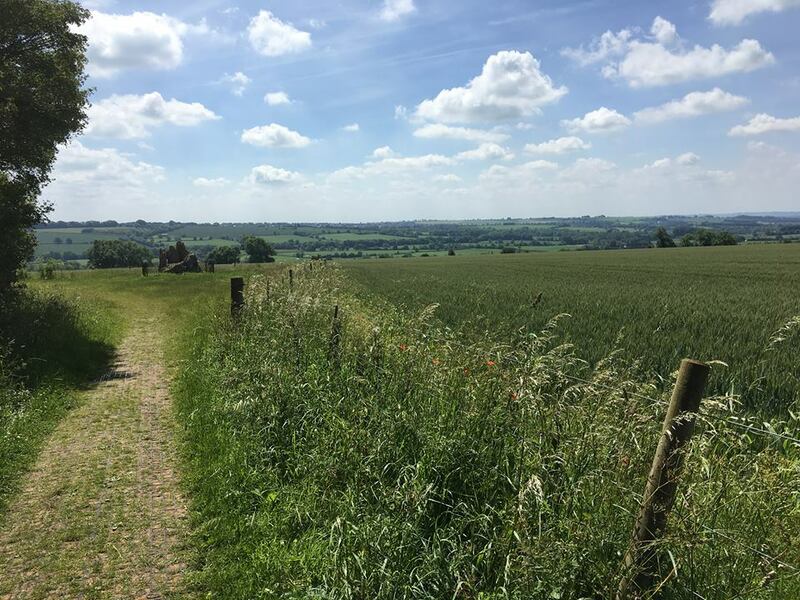 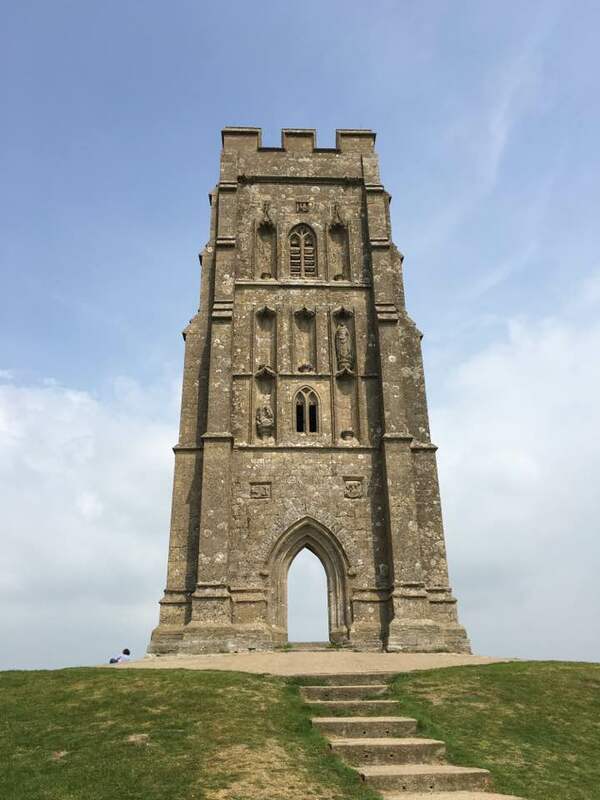 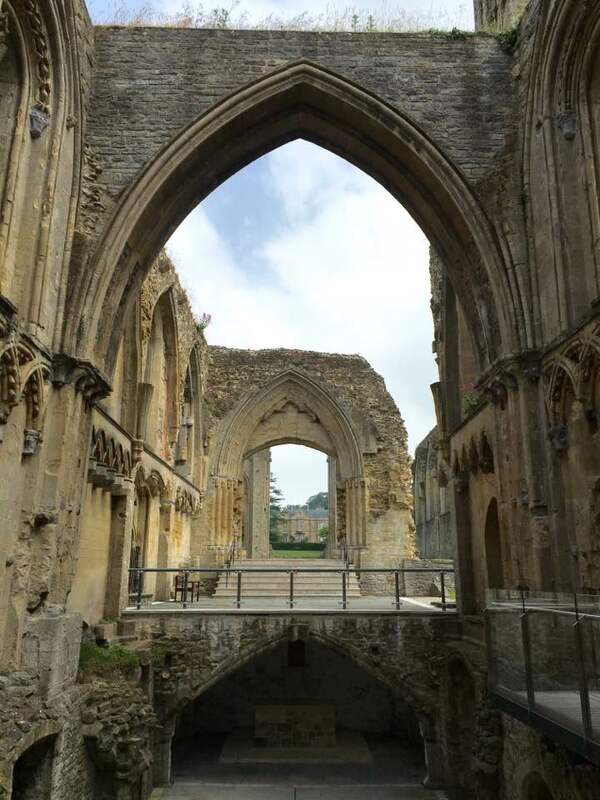 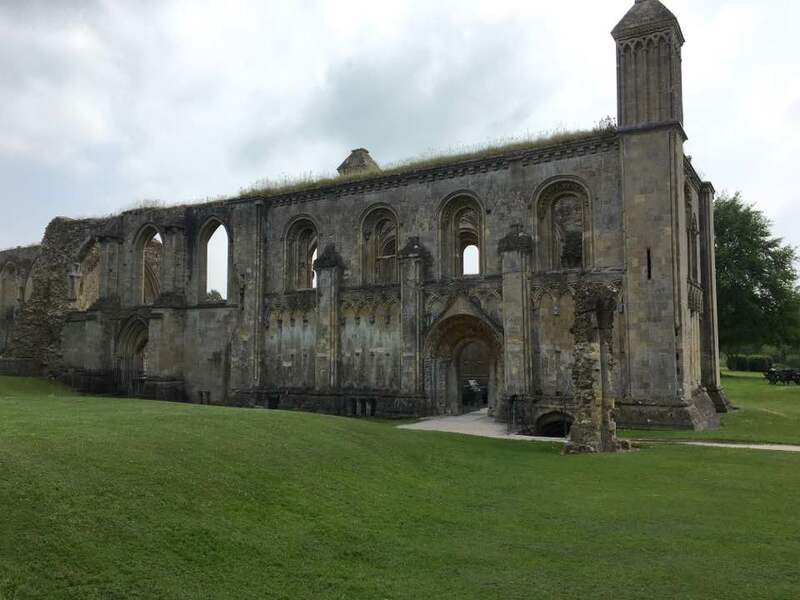 8th June 2016 — We visited Glastonbury and went to see the Abbey, where King Arthur is supposedly buried, then we went on a short bus ride which took us up a winding lane to reach the path to walk up the Tor, approaching the back entrance of St Michael’s Tower. 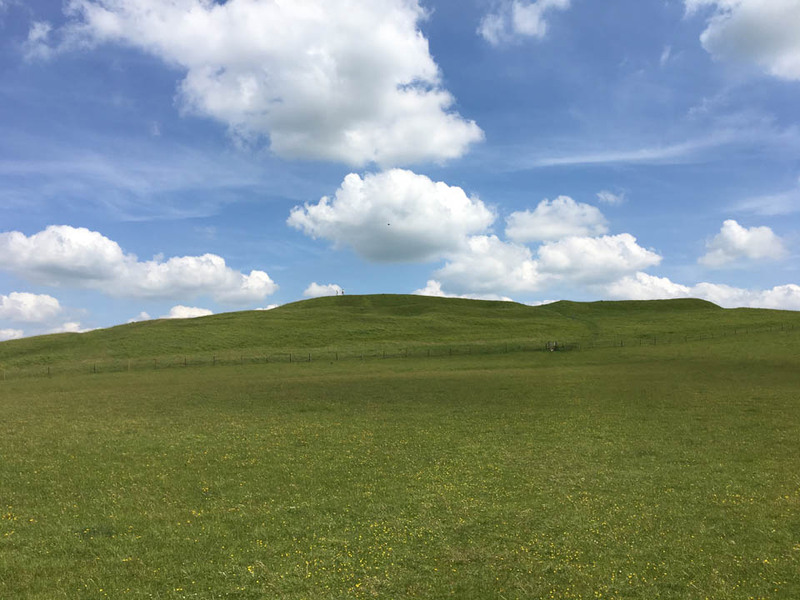 It was a very hot day and a long walk, but we survived, lol. 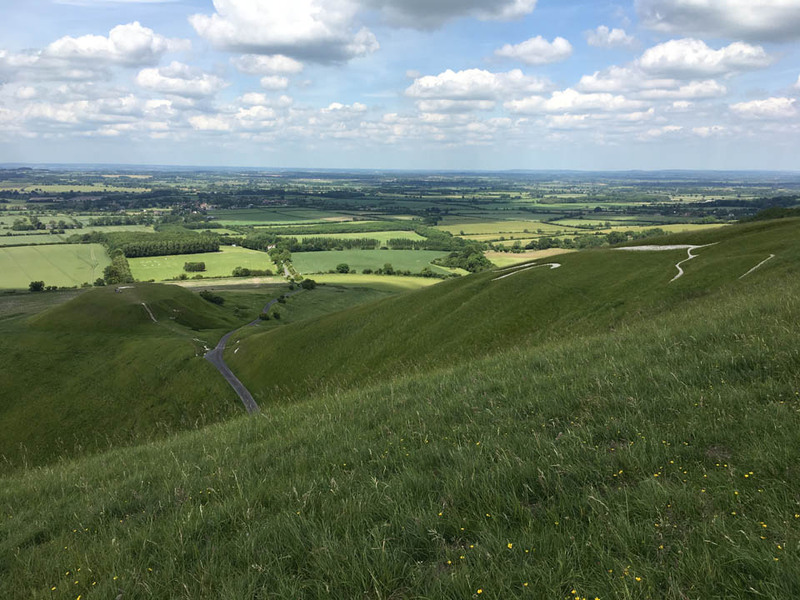 Once at the top and having had a little while to recover from the exertion of the hike up I was able to relax enough to sense ‘something’ vaguely Draconic, though it was difficult with so many people around. 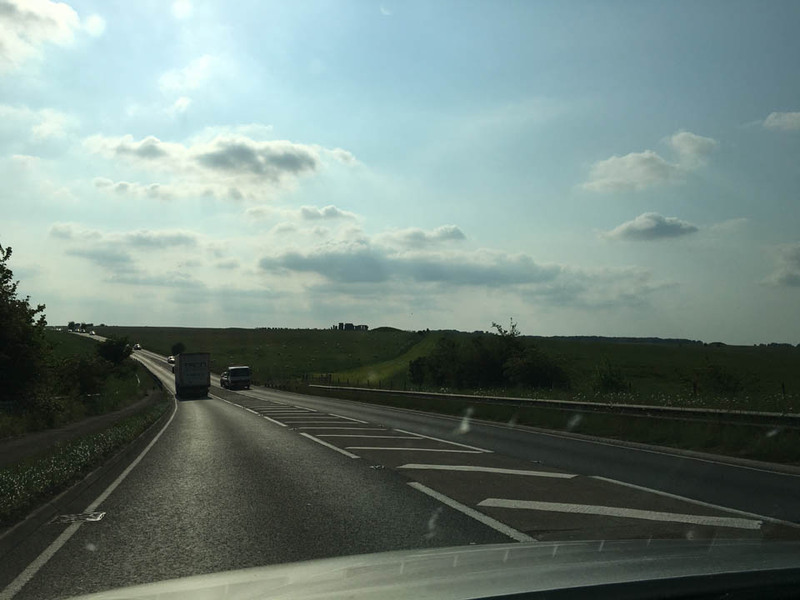 It felt calm and reassuring, like I was ‘home’. 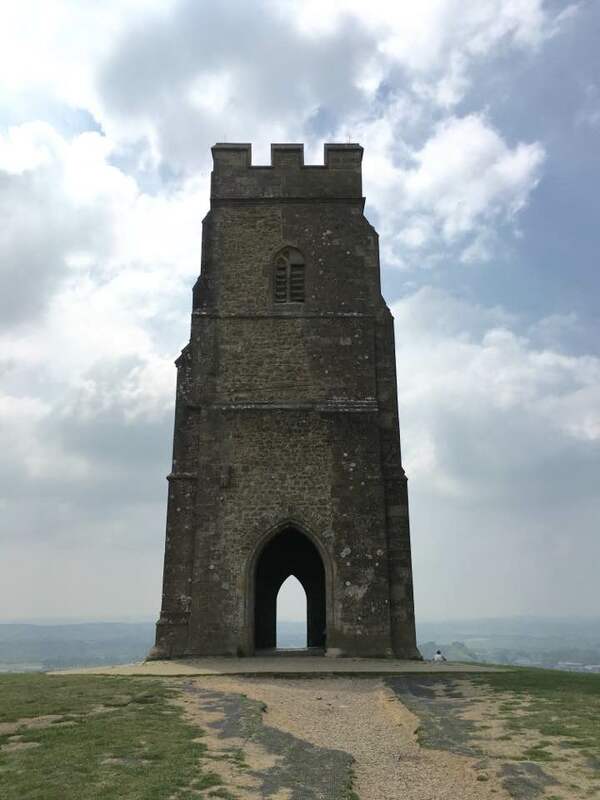 The top of the Tor provided a view of the surrounding landscape which was spectacular! 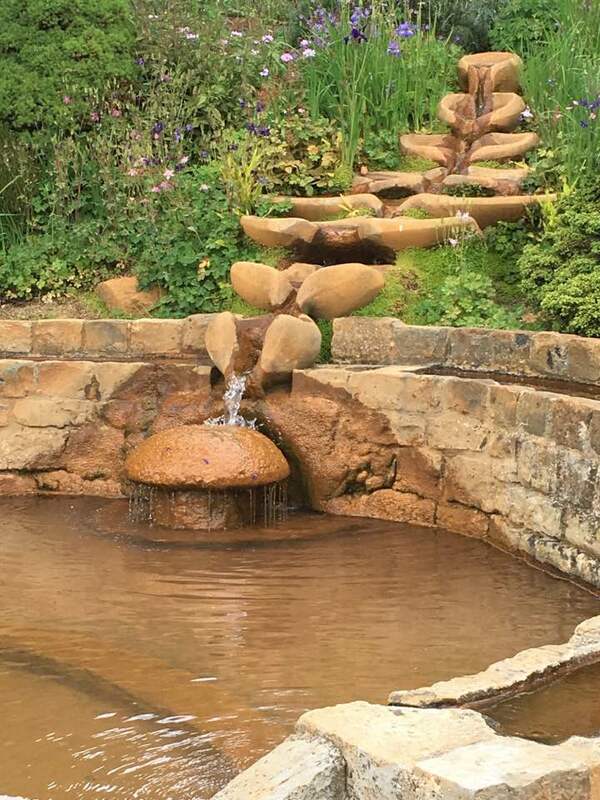 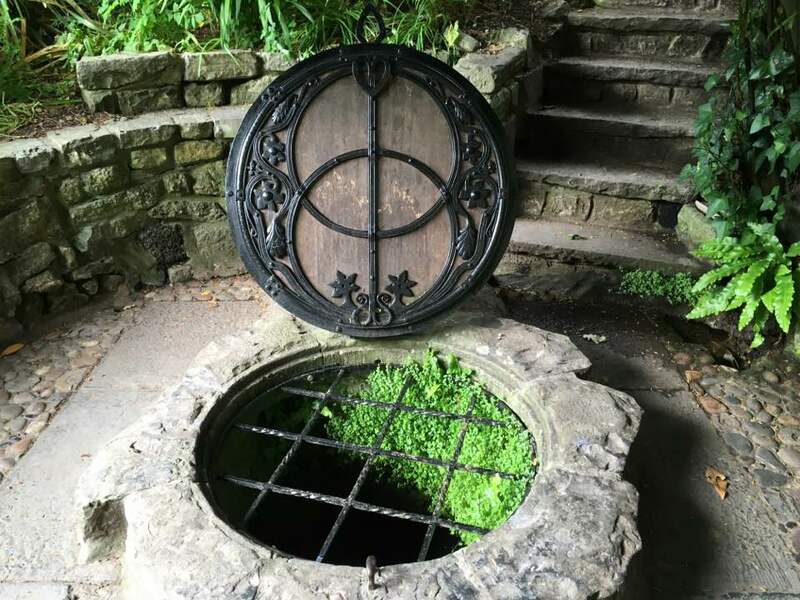 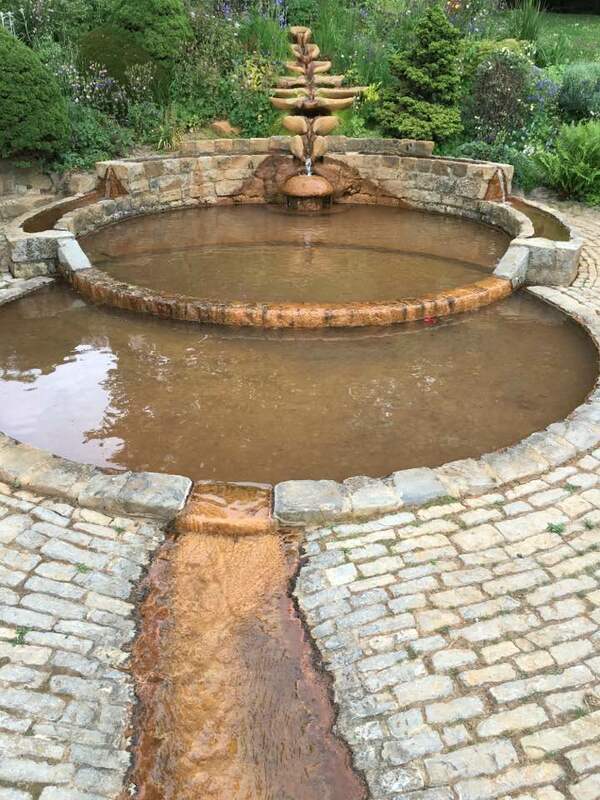 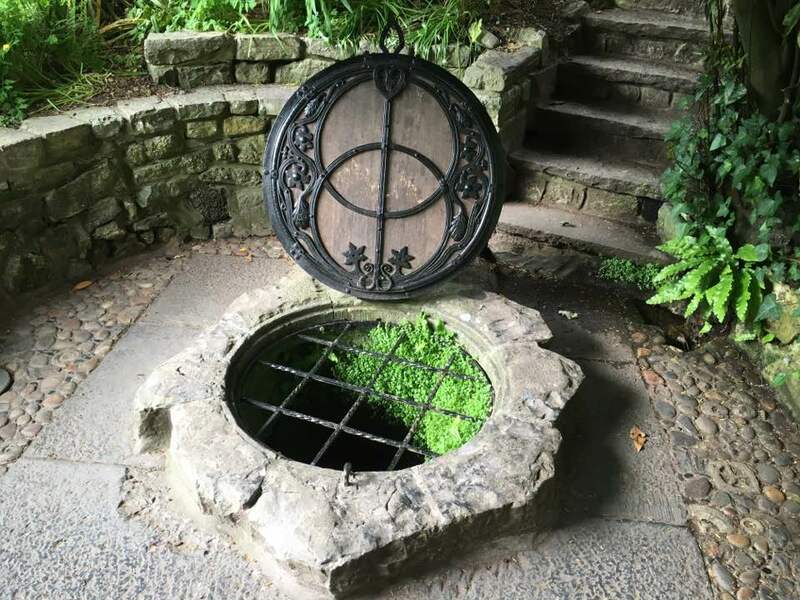 After spending a while enjoying the view and soaking up the atmosphere of the place we left via the front path which eventually came out onto the street very close to the Chalice Well Gardens. 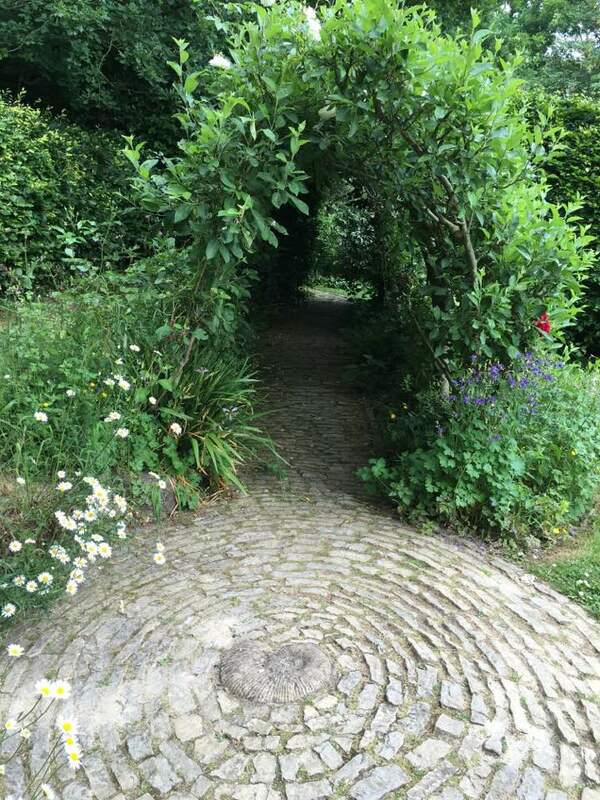 The gardens felt very peaceful and relaxing — could have stayed there a lot longer but we had to eventually move on. 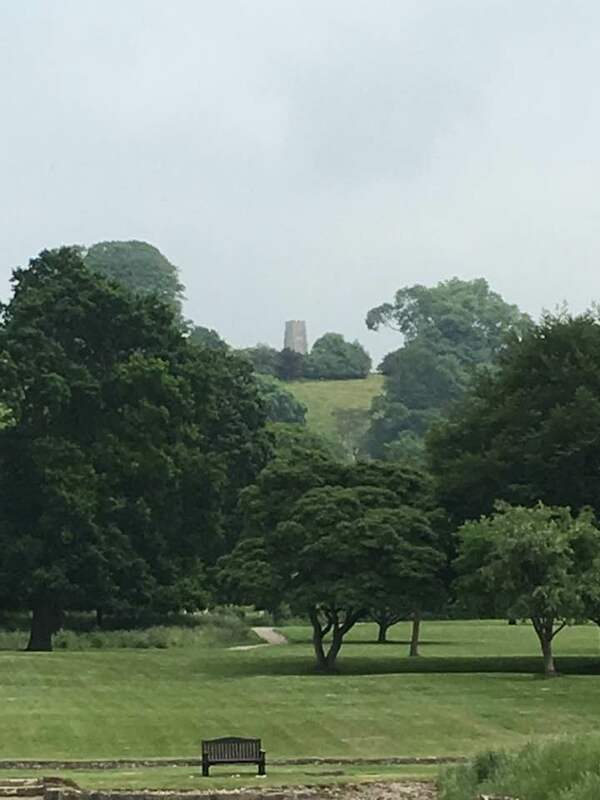 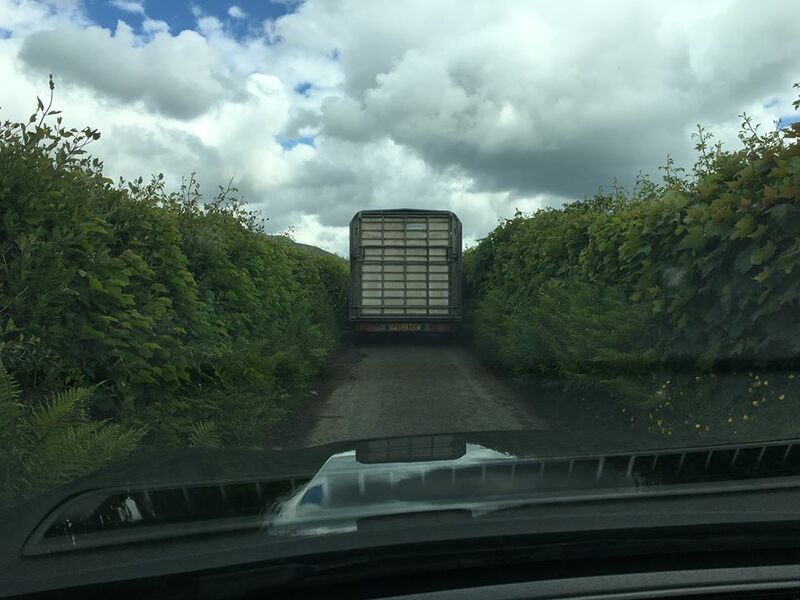 Approaching the Tor from the back lane. 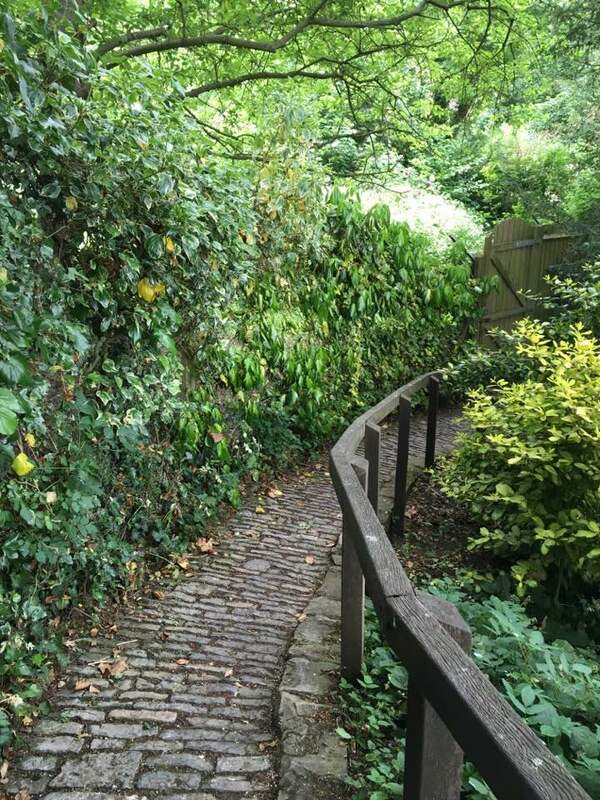 The path at the front of St Michael’s Tower. 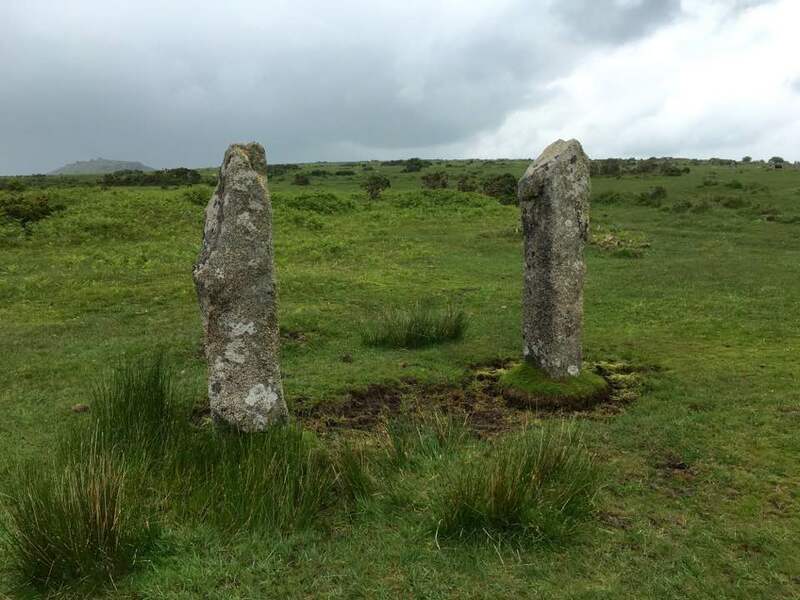 12th June 2016 — We went to see The Hurlers Stone Circles which are 3 stone circles arranged along a common axis on the moorlands at Minions near Liskeard. 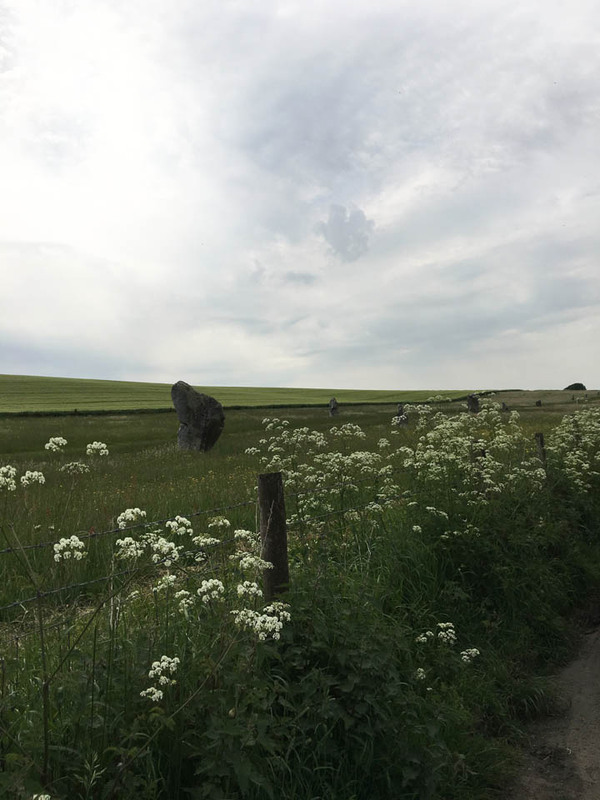 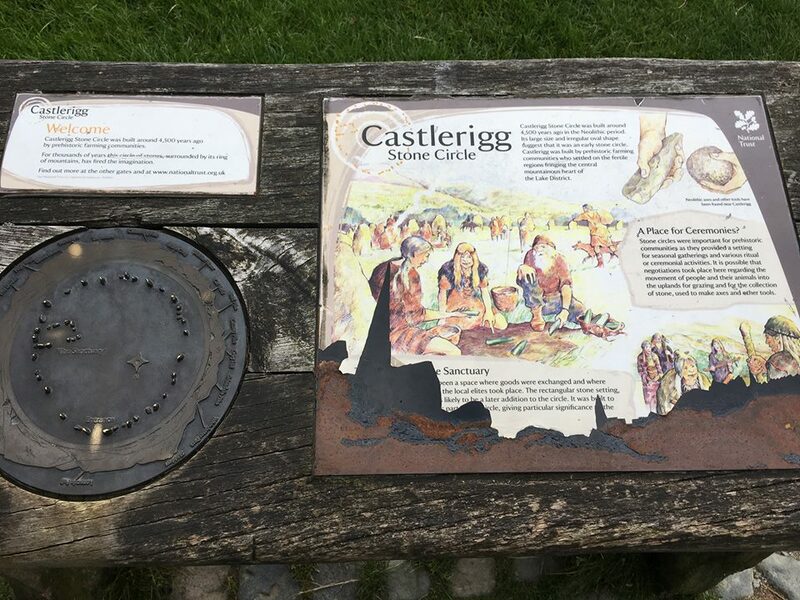 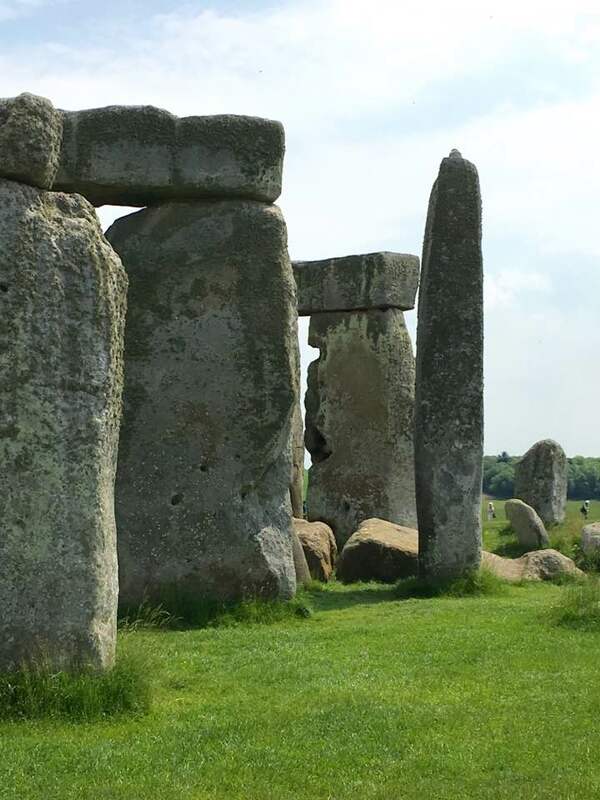 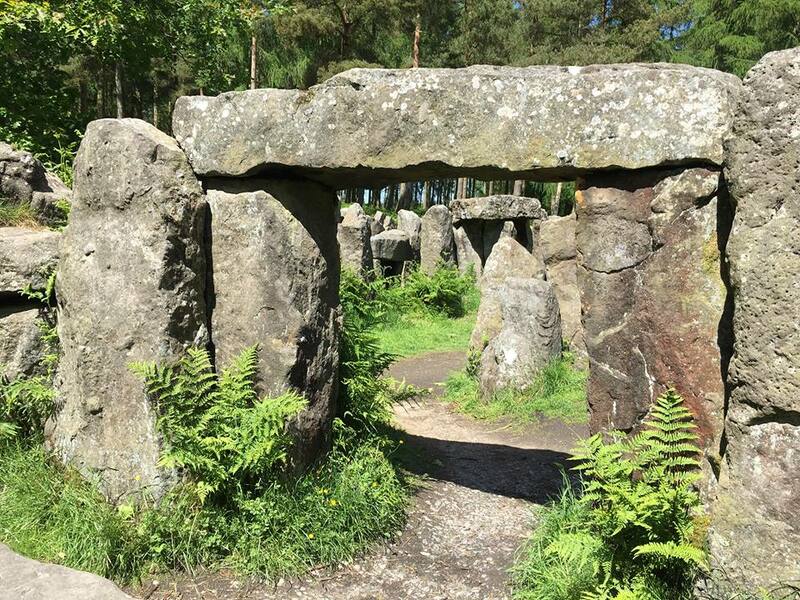 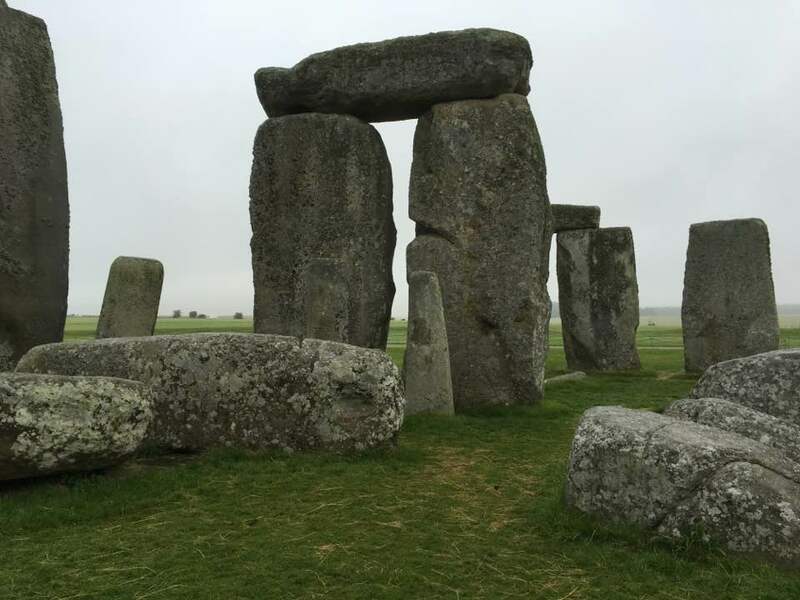 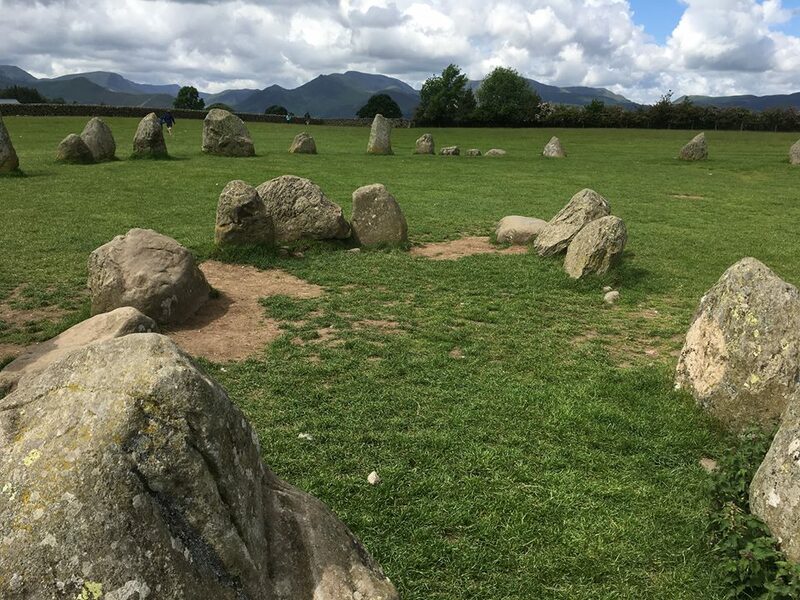 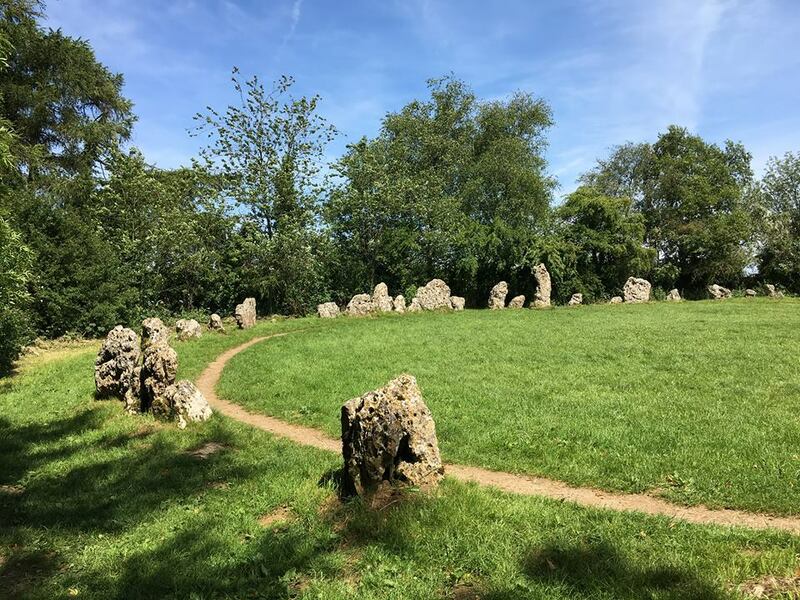 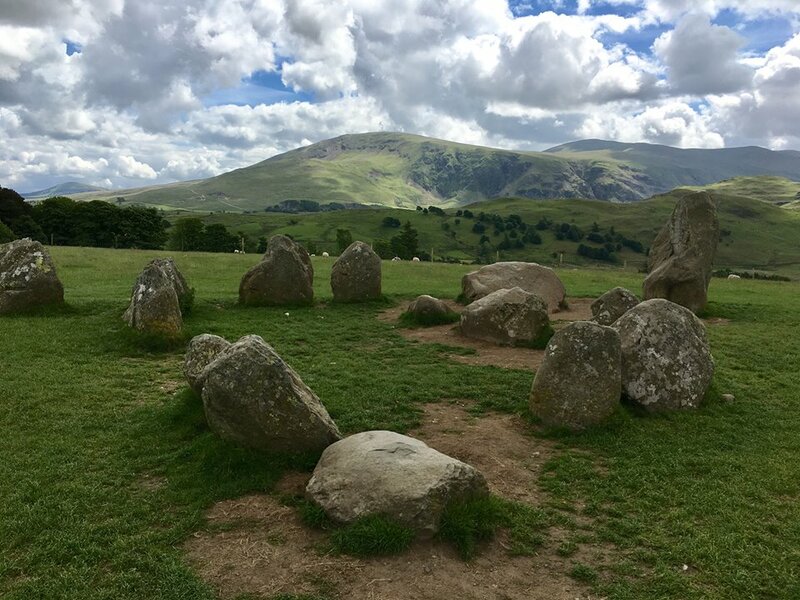 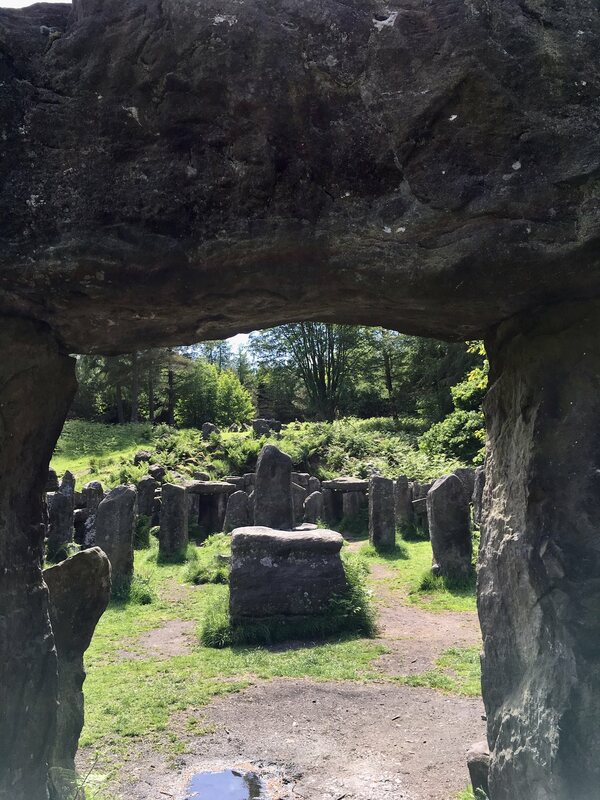 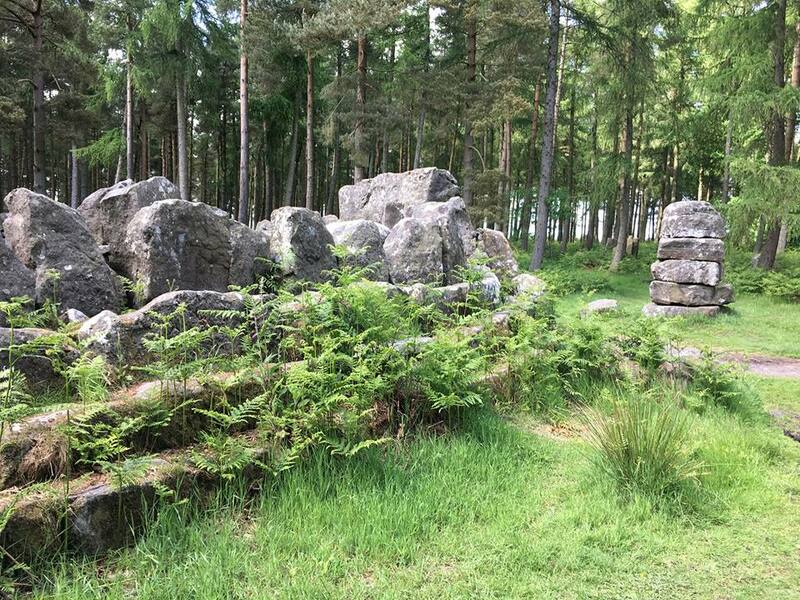 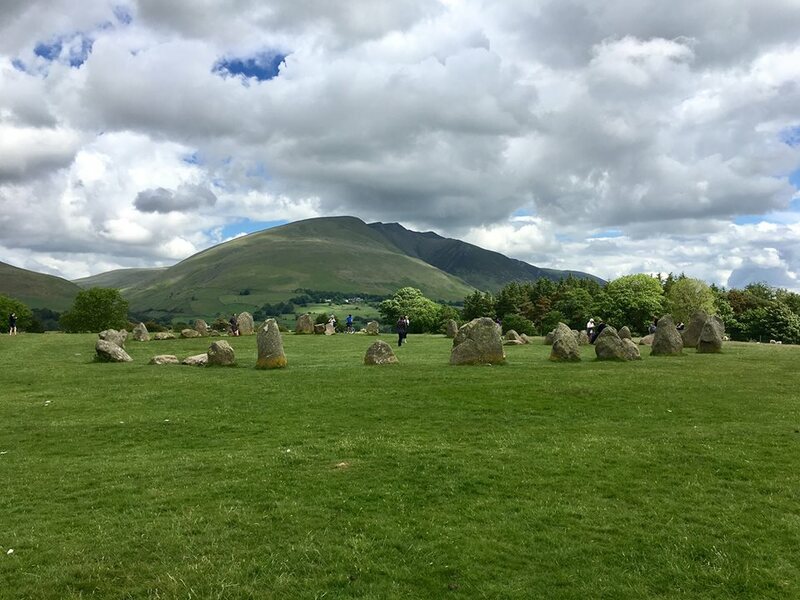 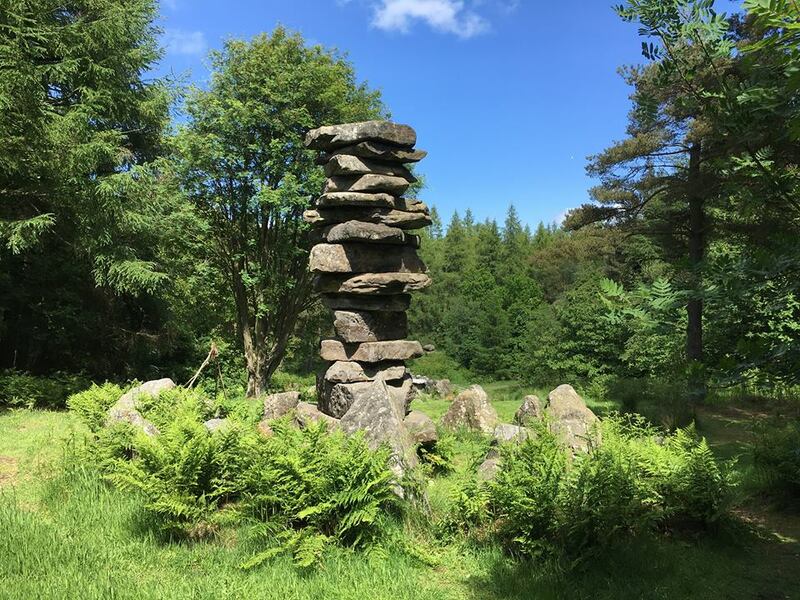 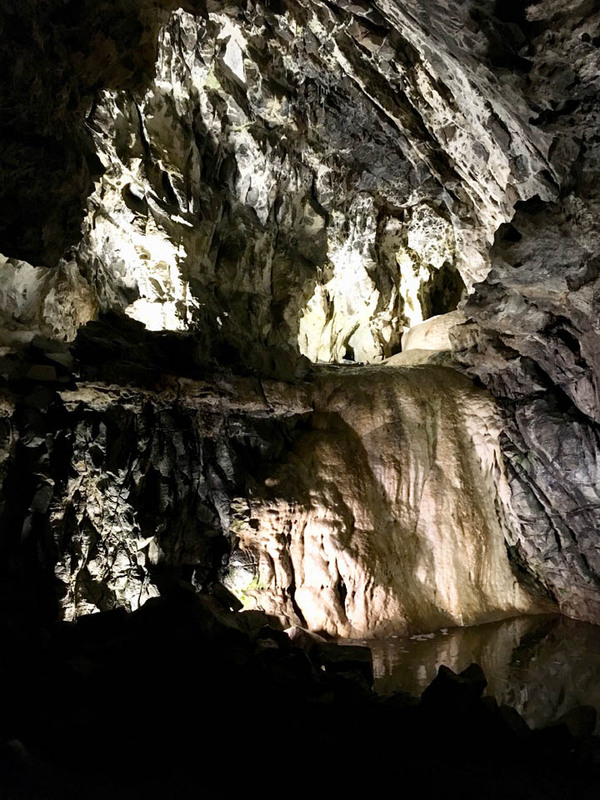 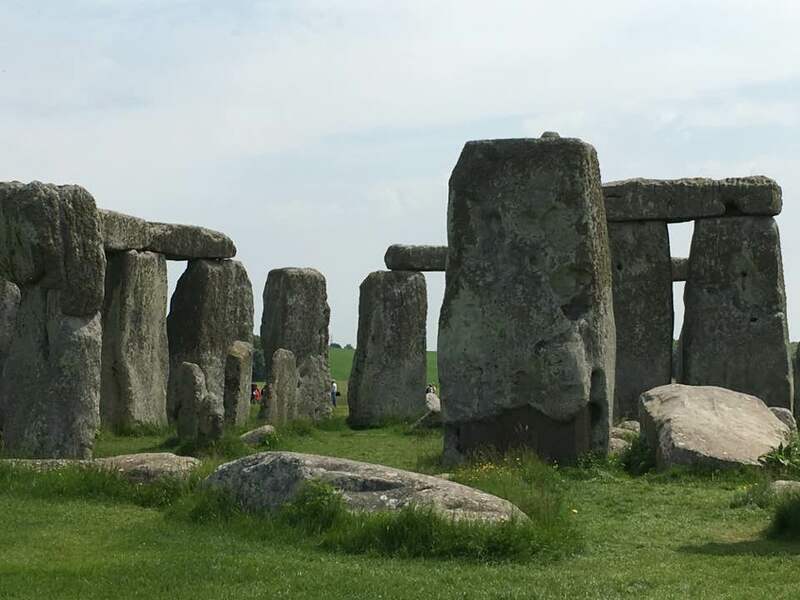 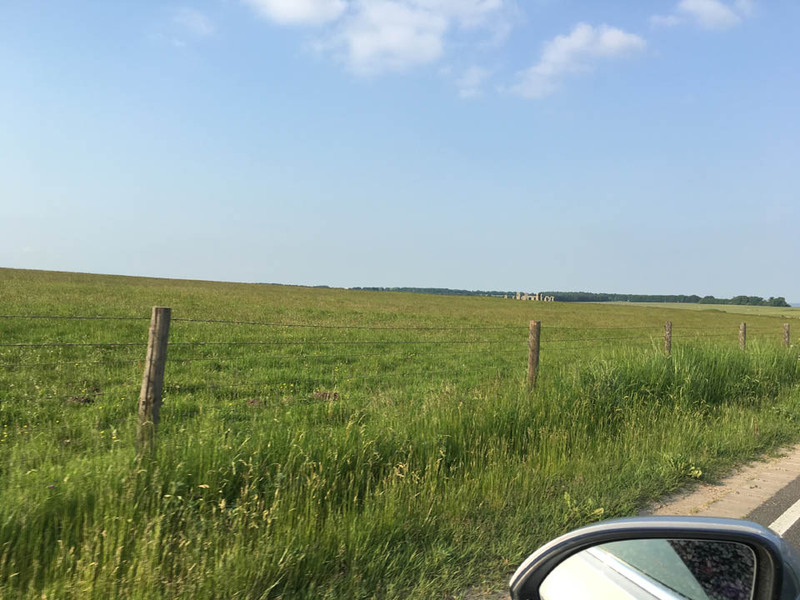 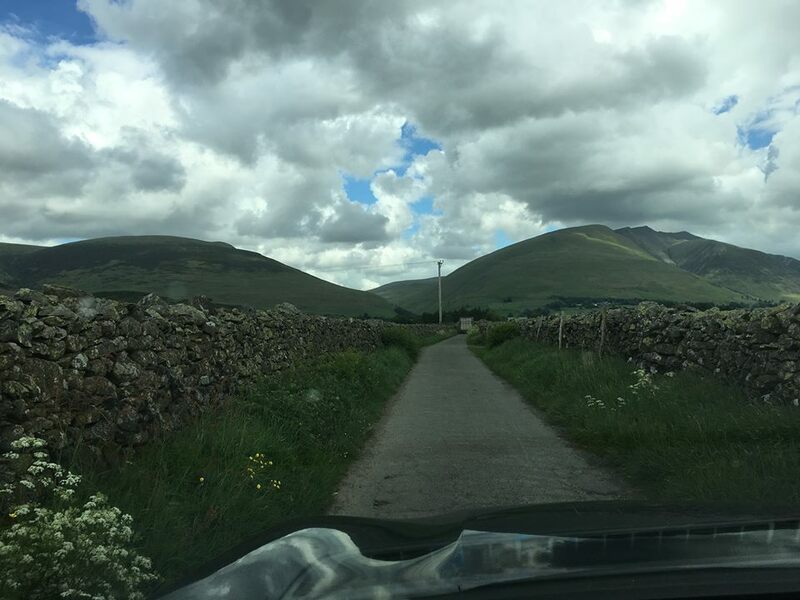 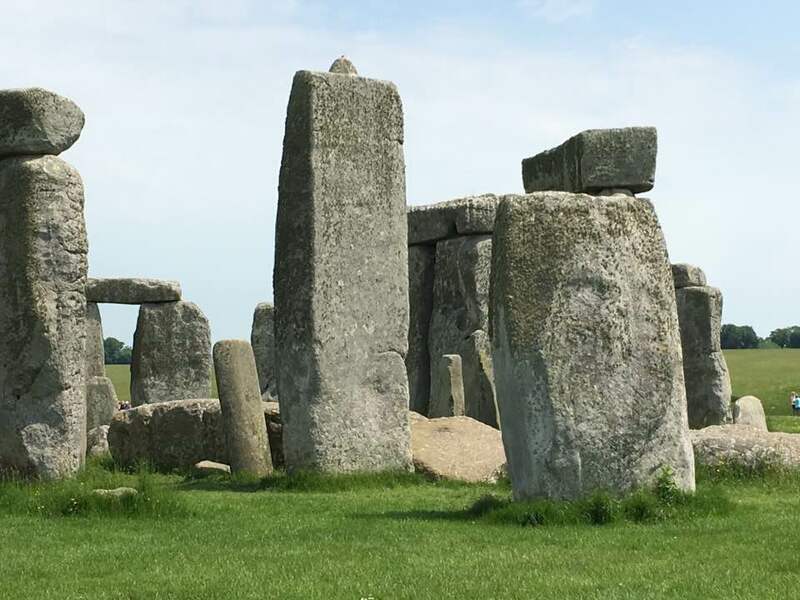 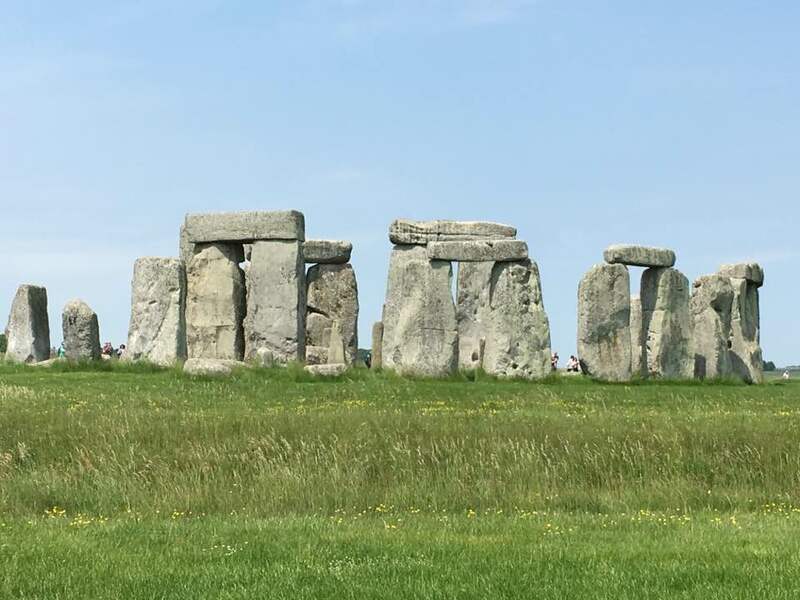 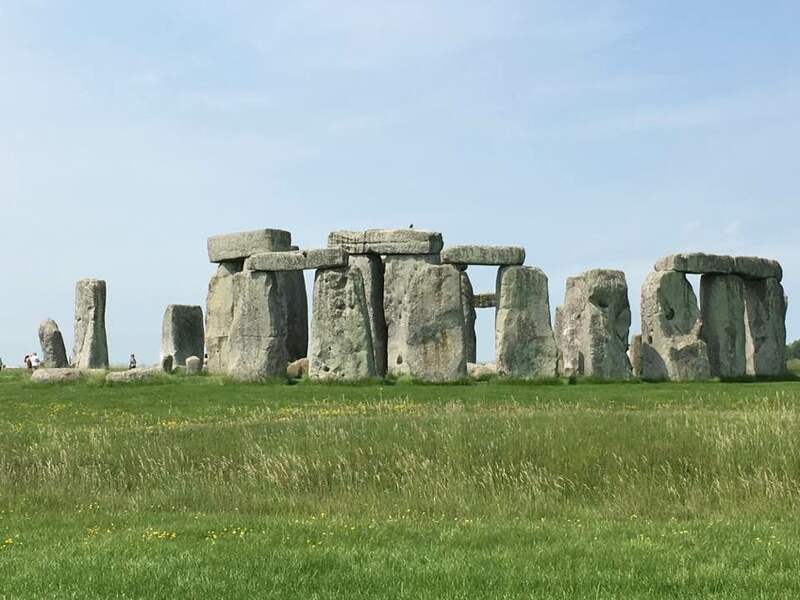 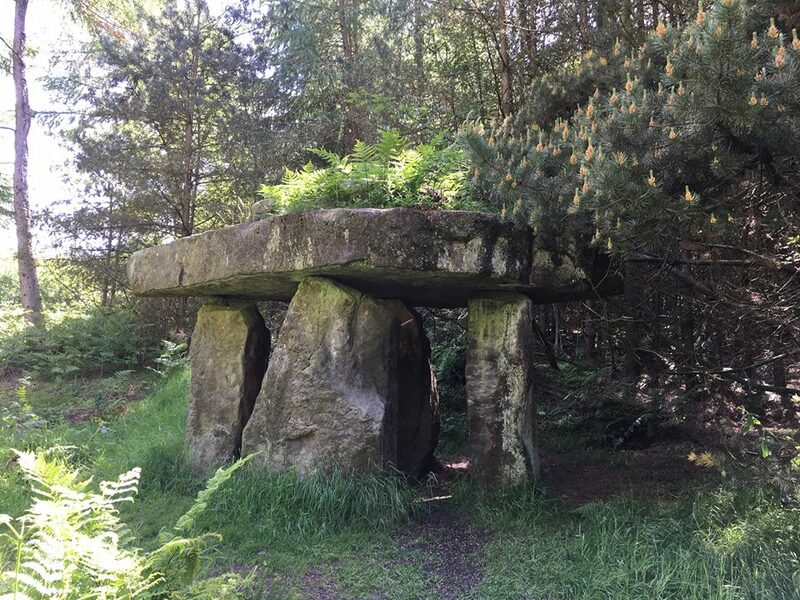 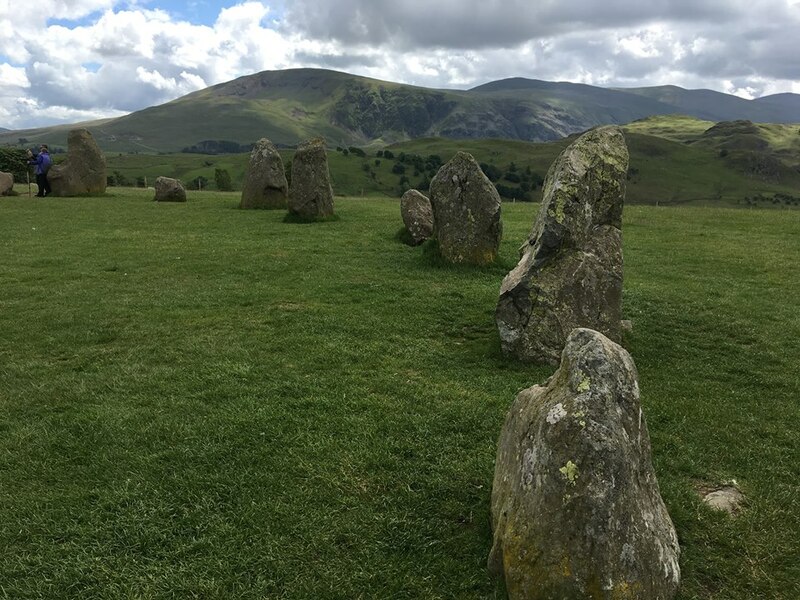 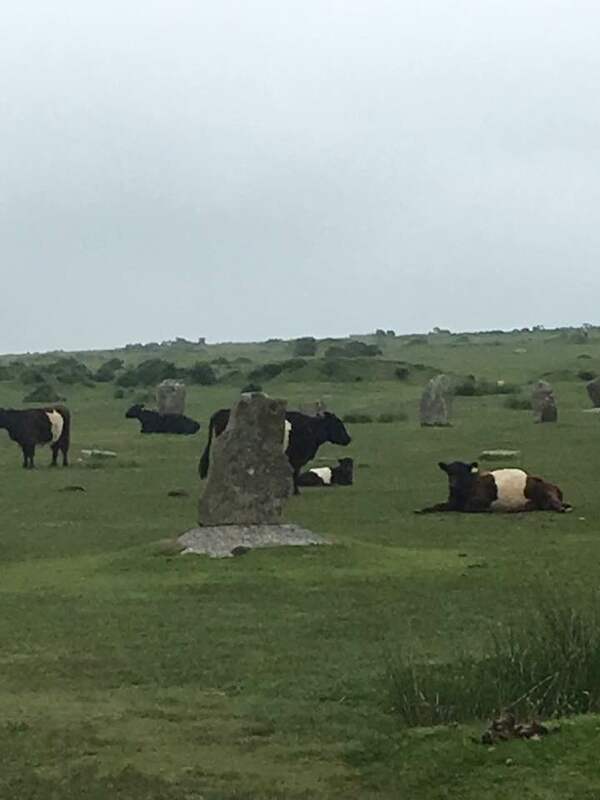 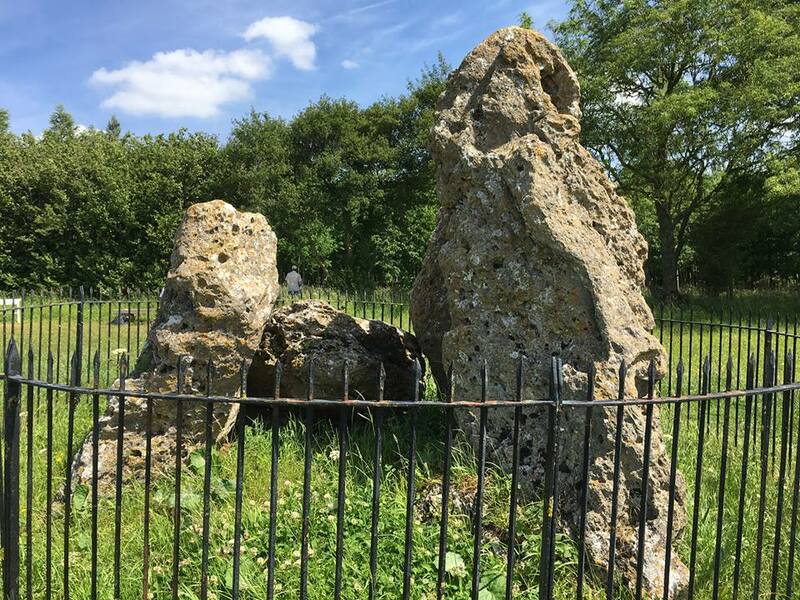 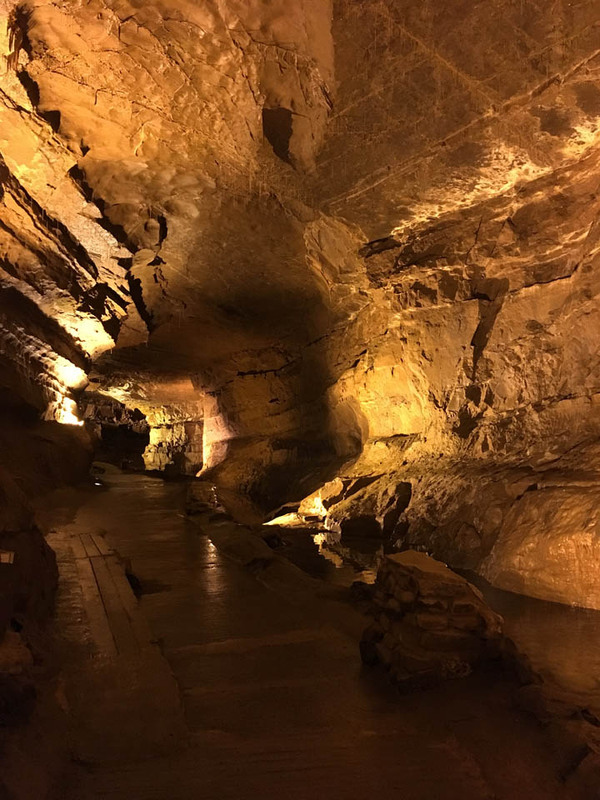 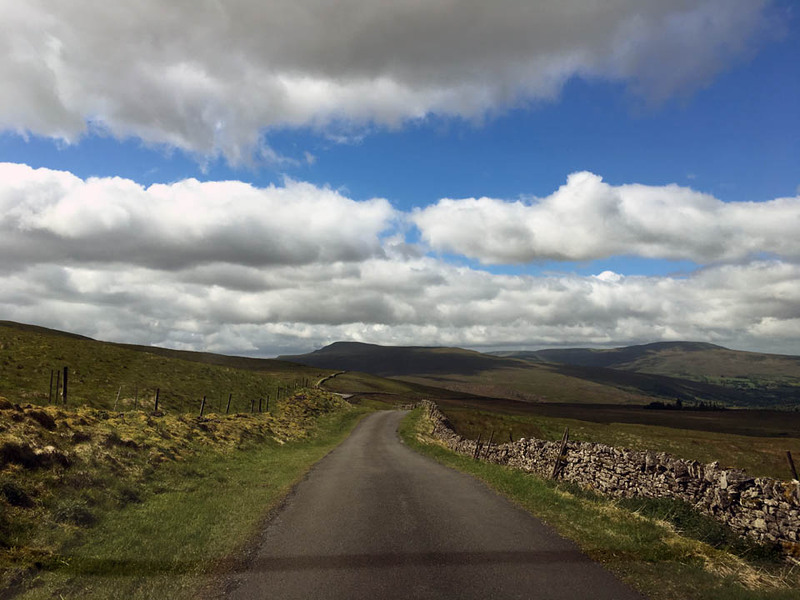 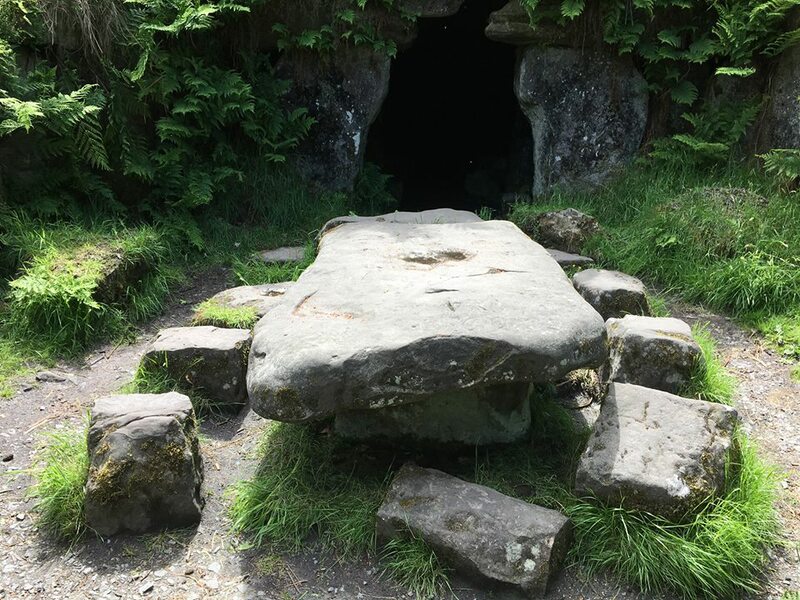 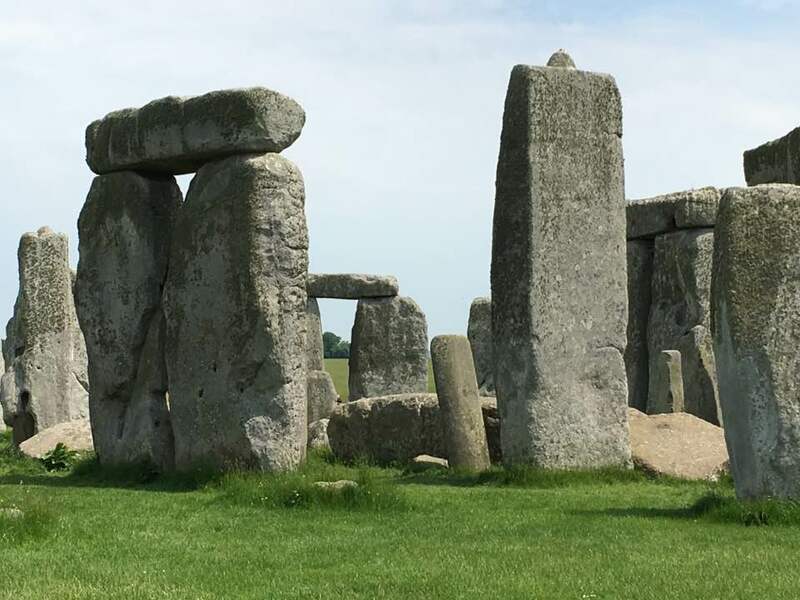 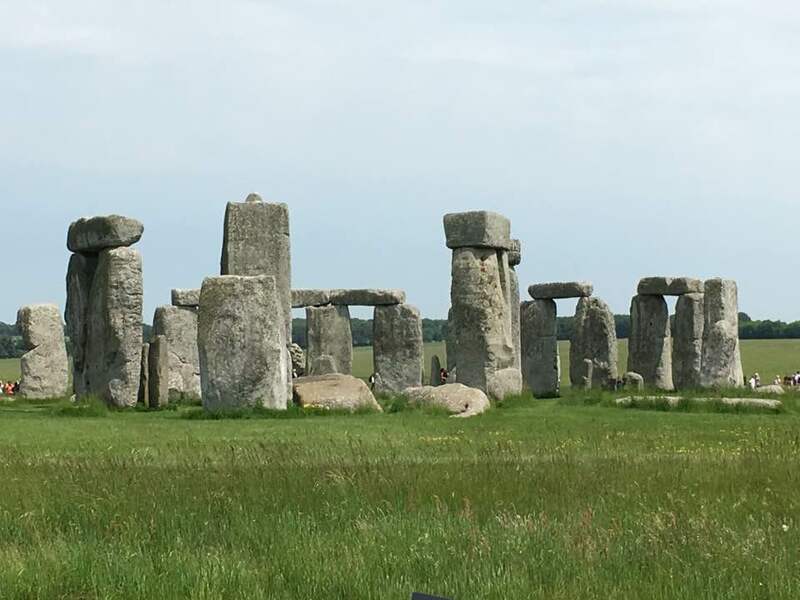 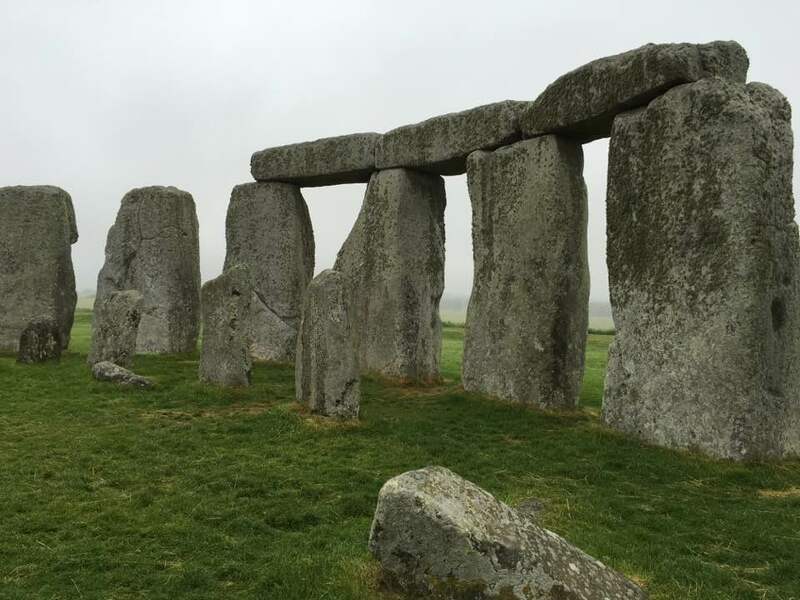 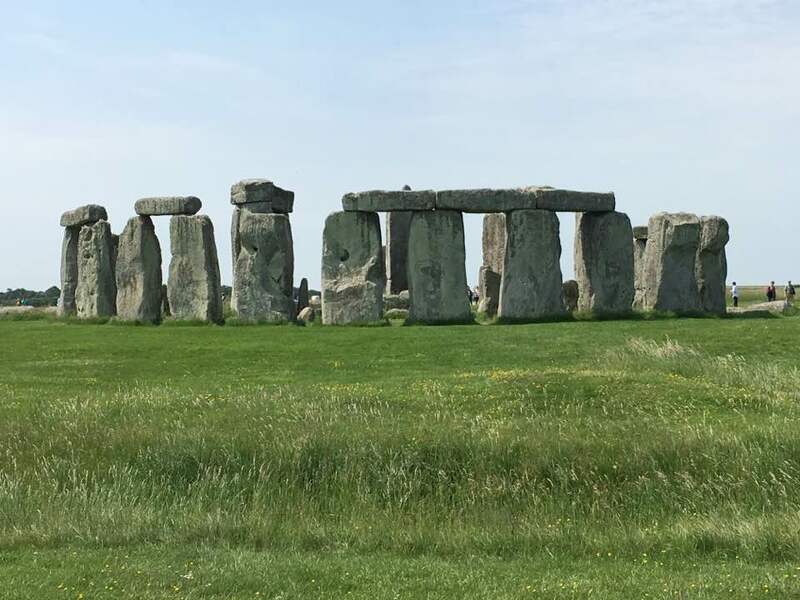 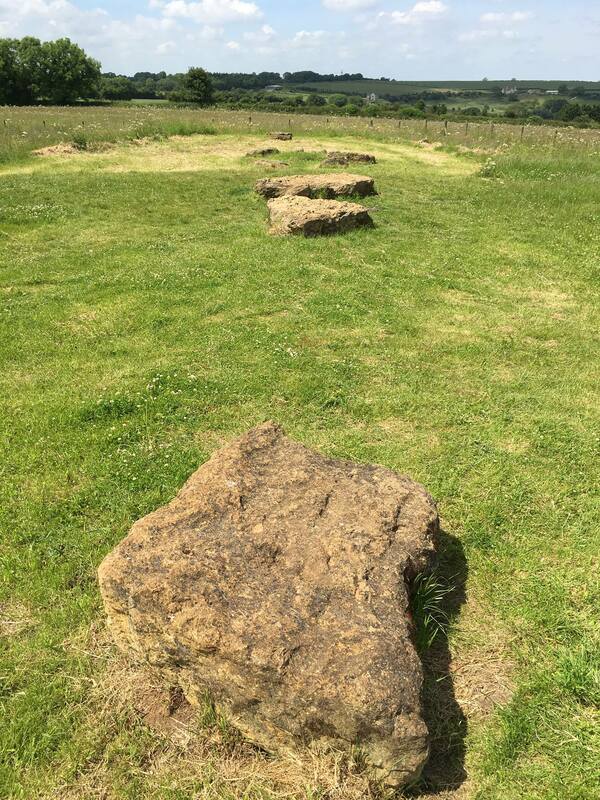 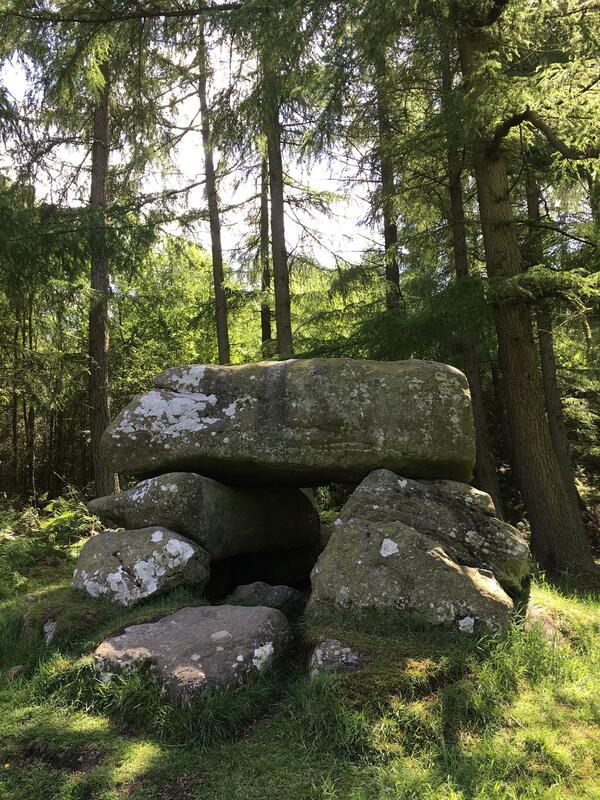 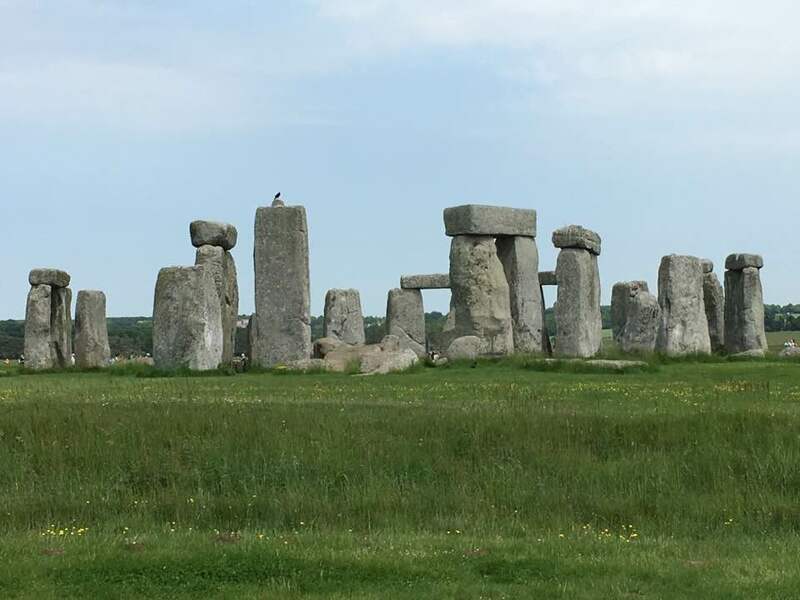 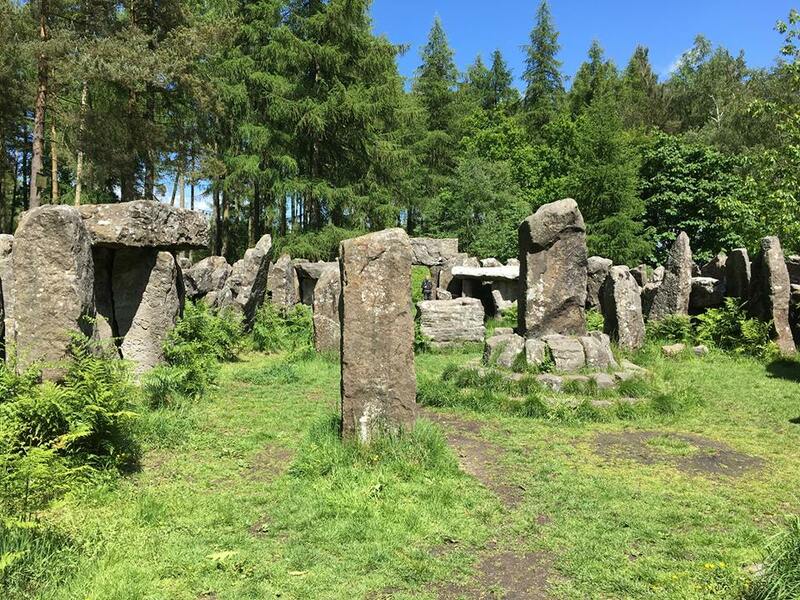 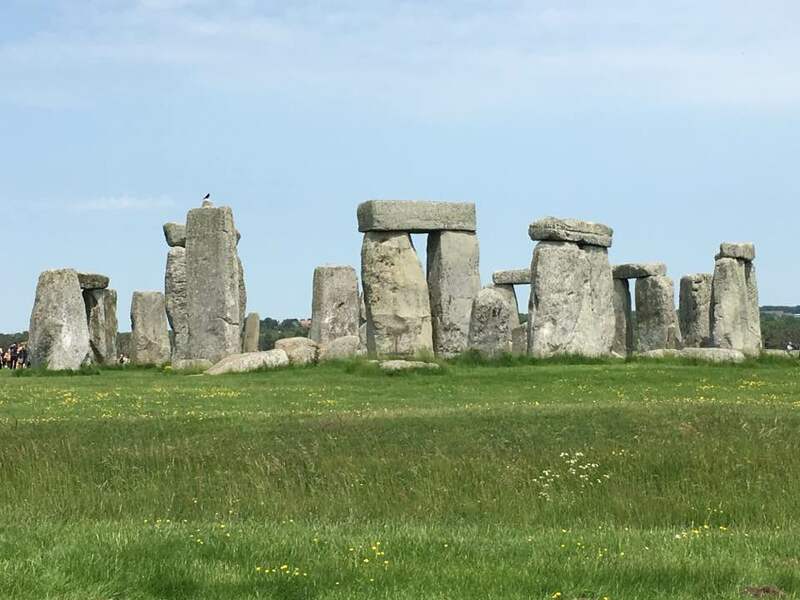 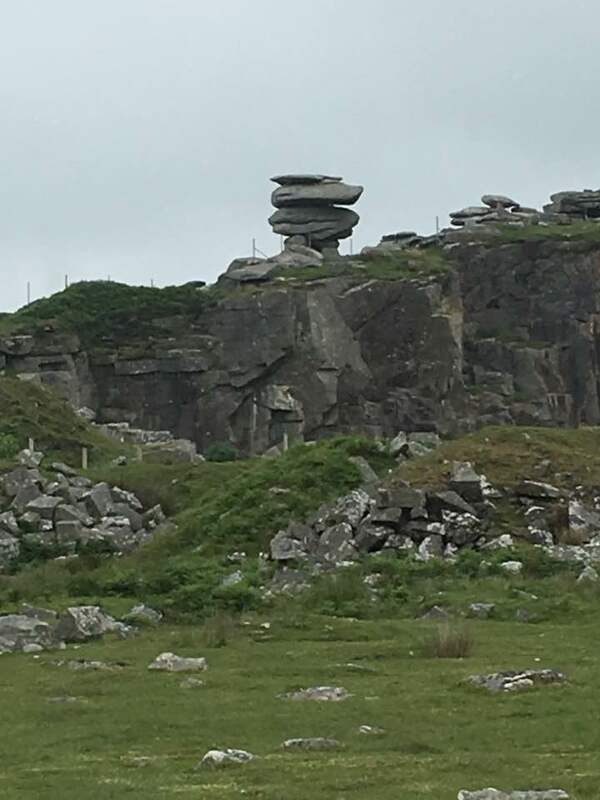 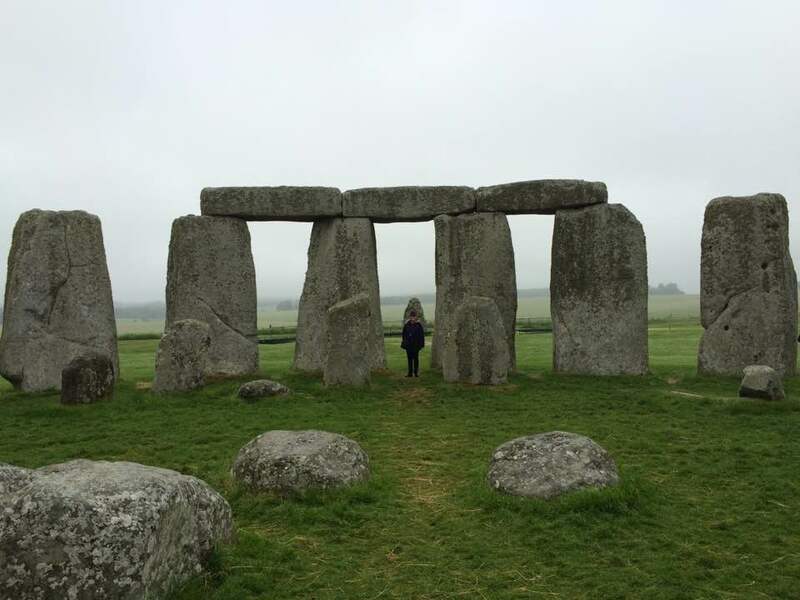 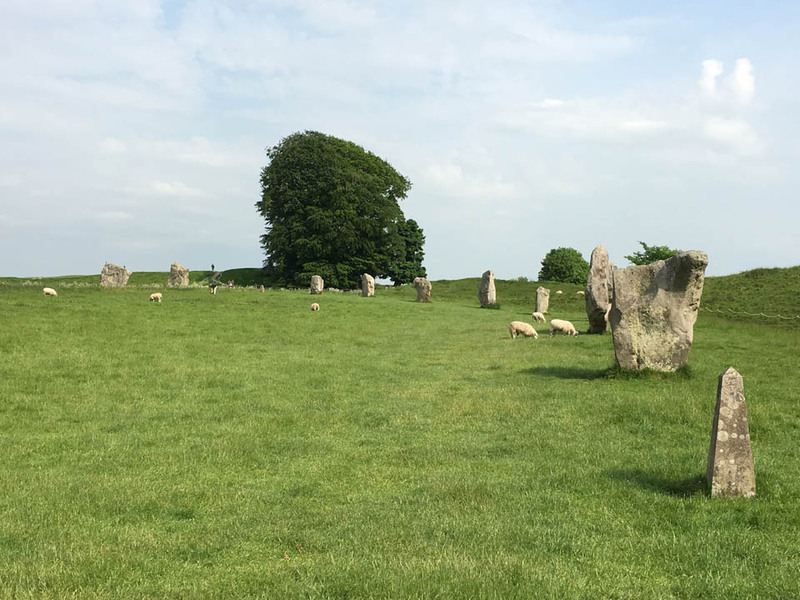 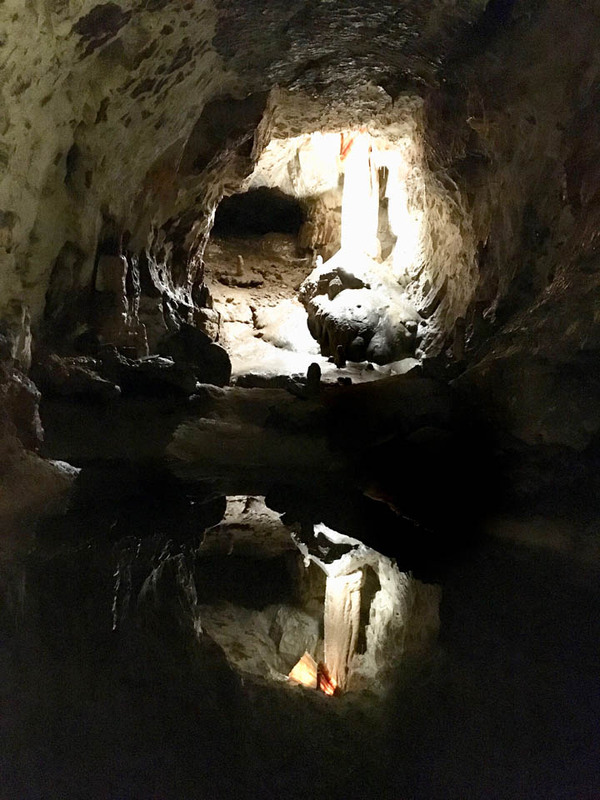 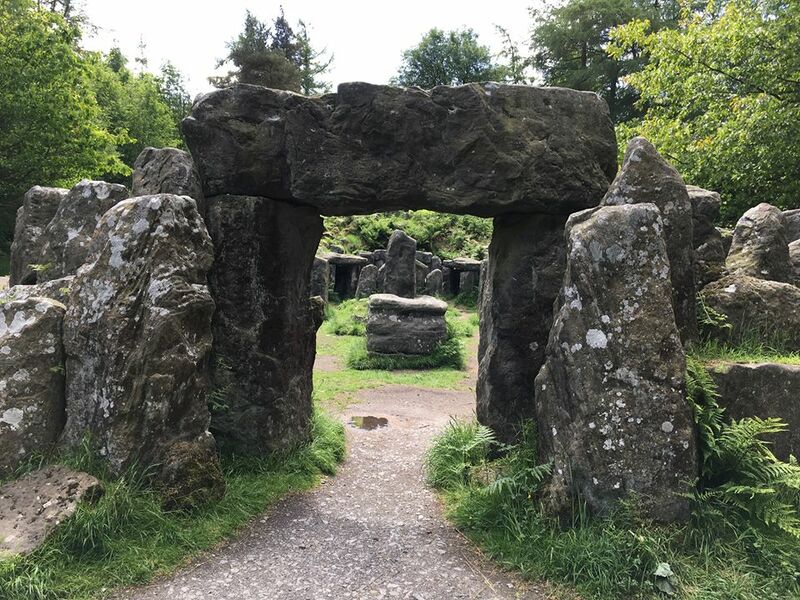 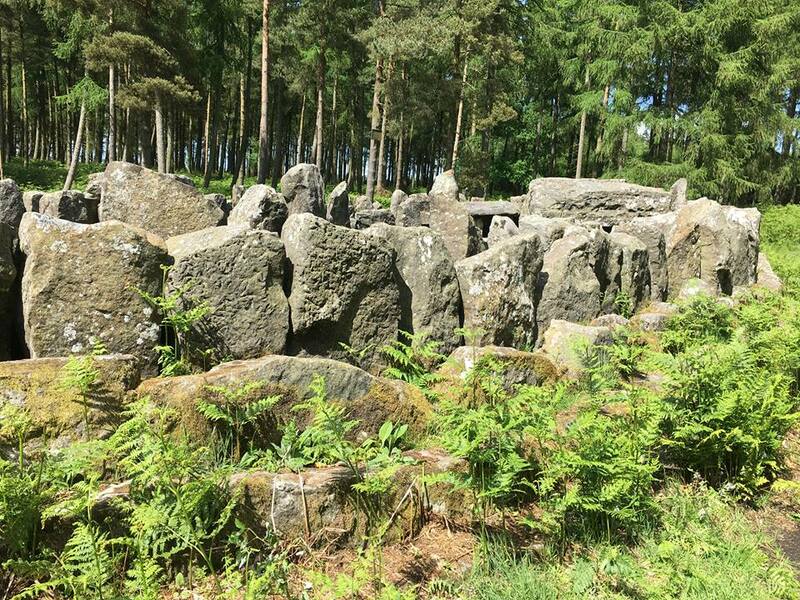 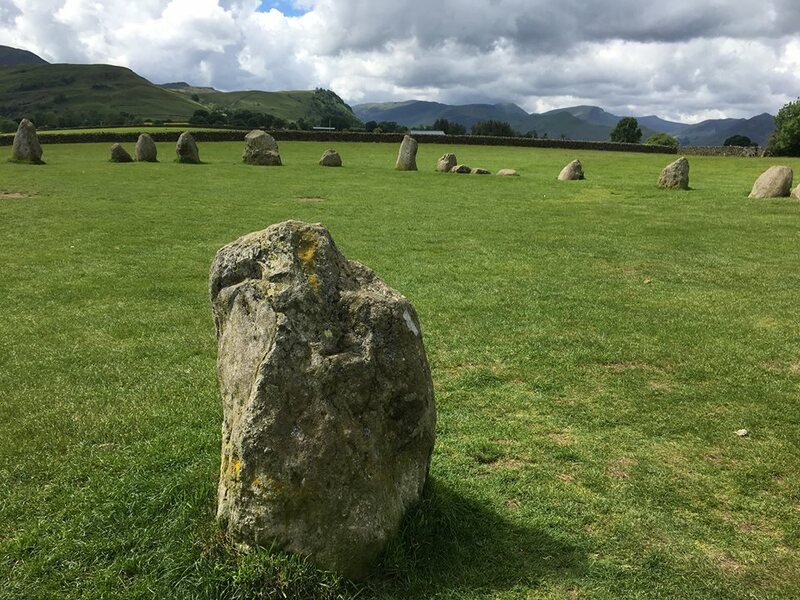 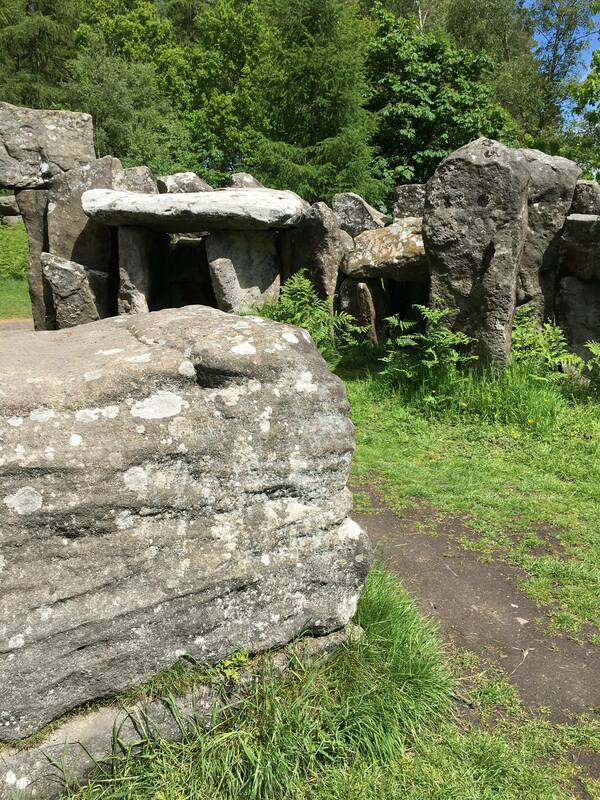 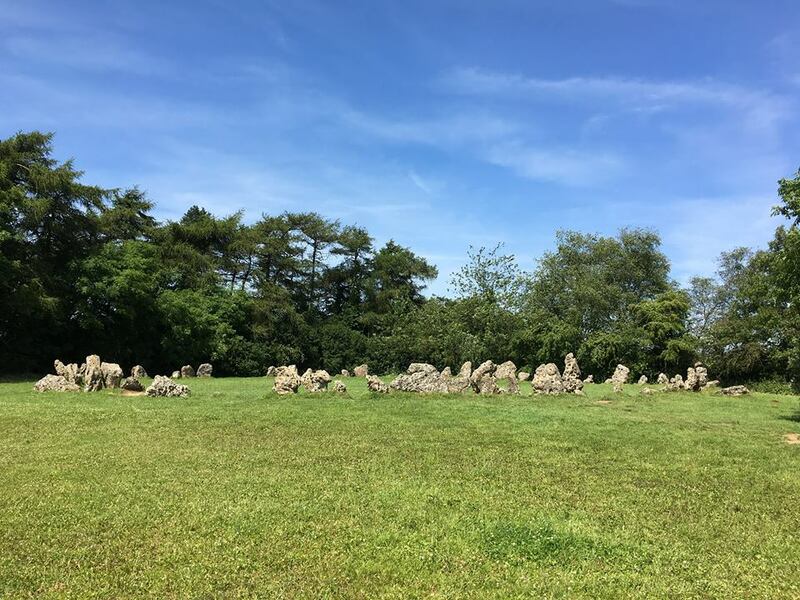 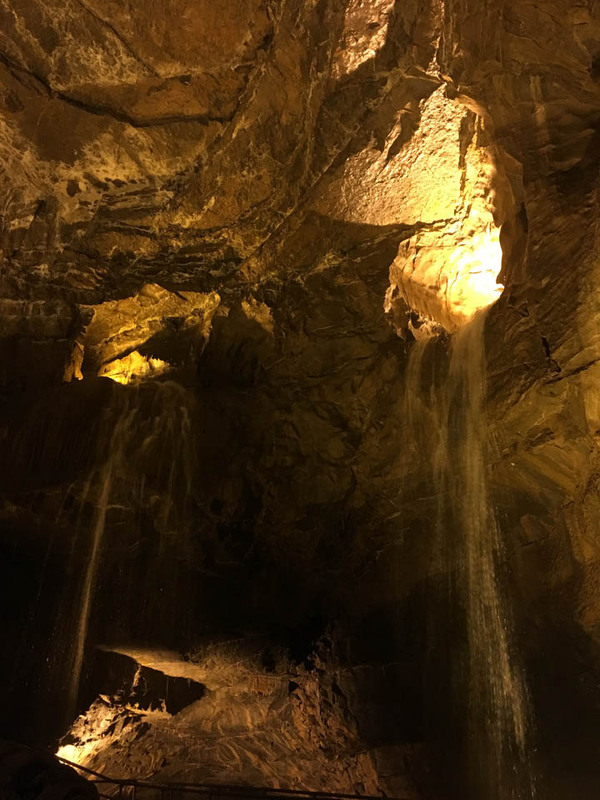 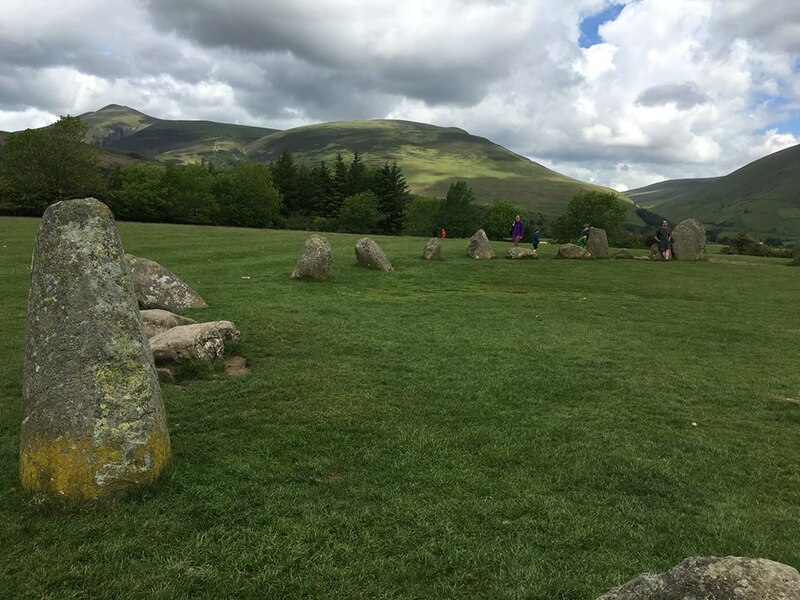 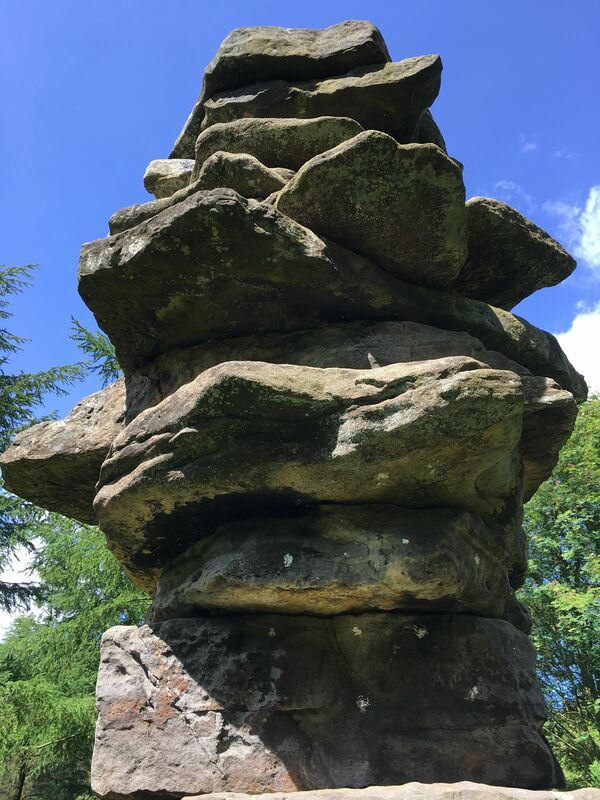 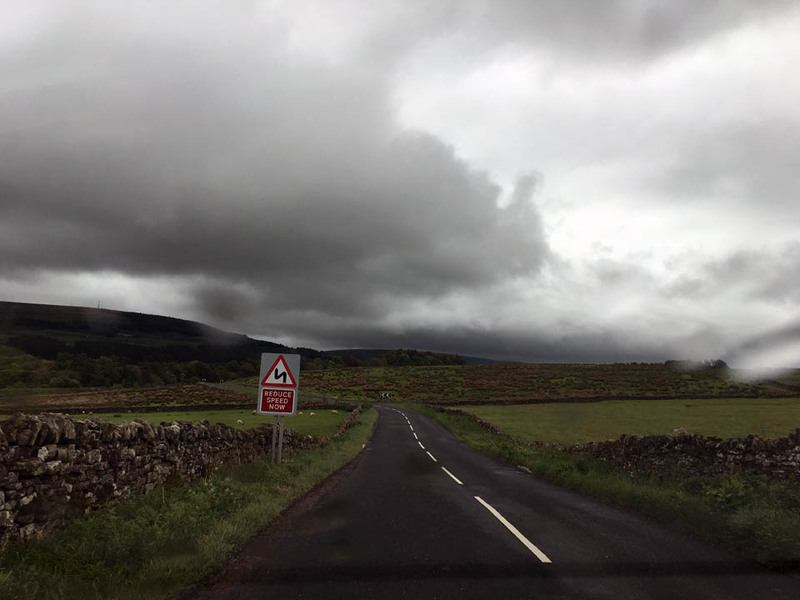 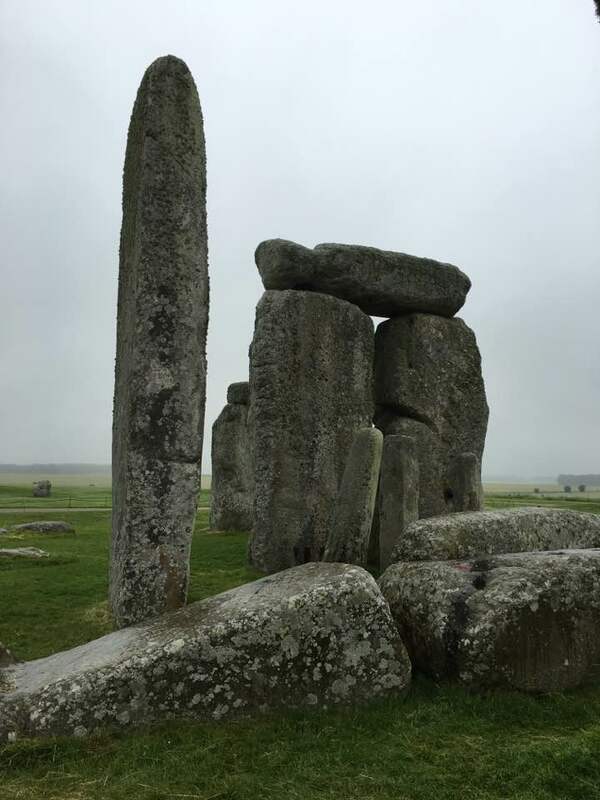 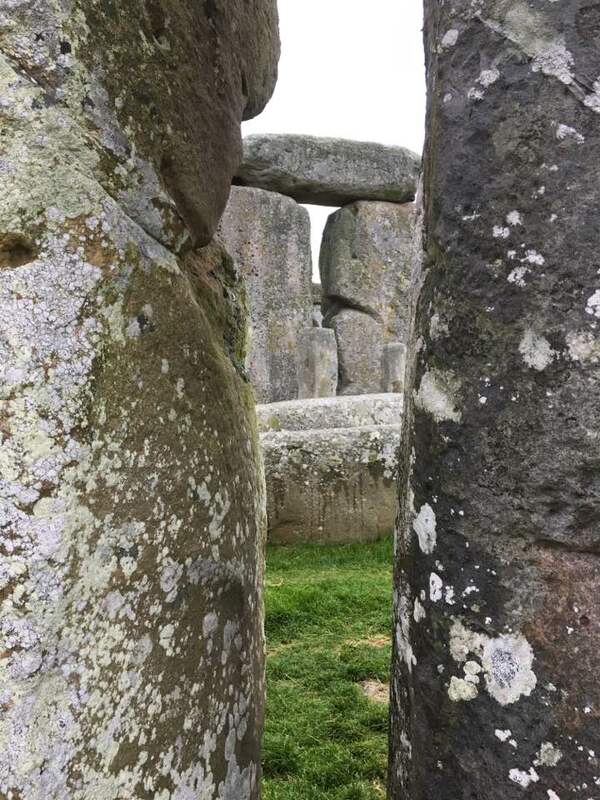 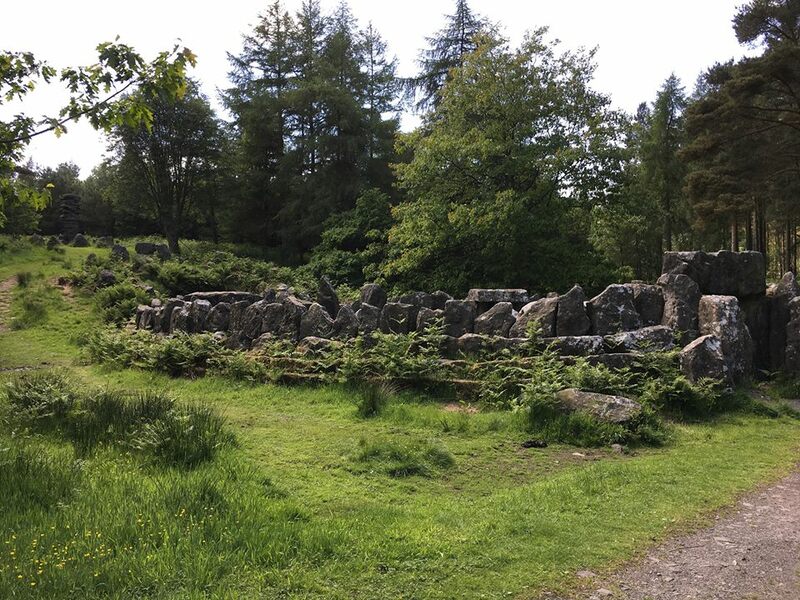 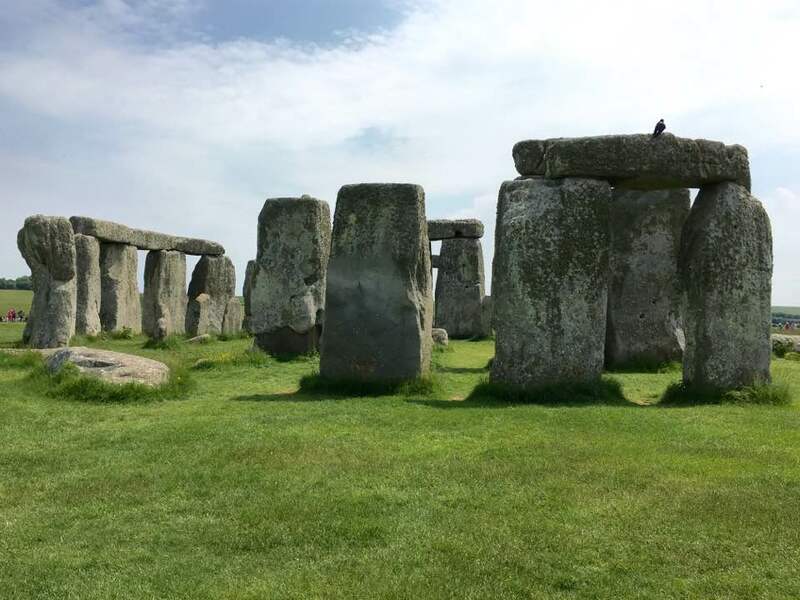 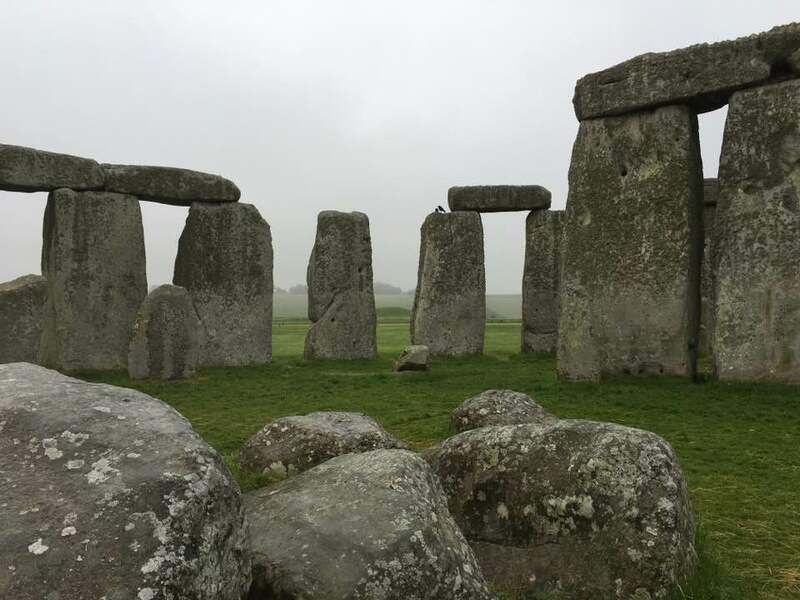 It’s a vast area with a couple of other attractions — Cheesewring (a granite outcrop above a quarry) and The Pipers Standing Stones (a pair of stones) and old mines and displays about the history of the area — but I wanted mainly to see the stone circles. 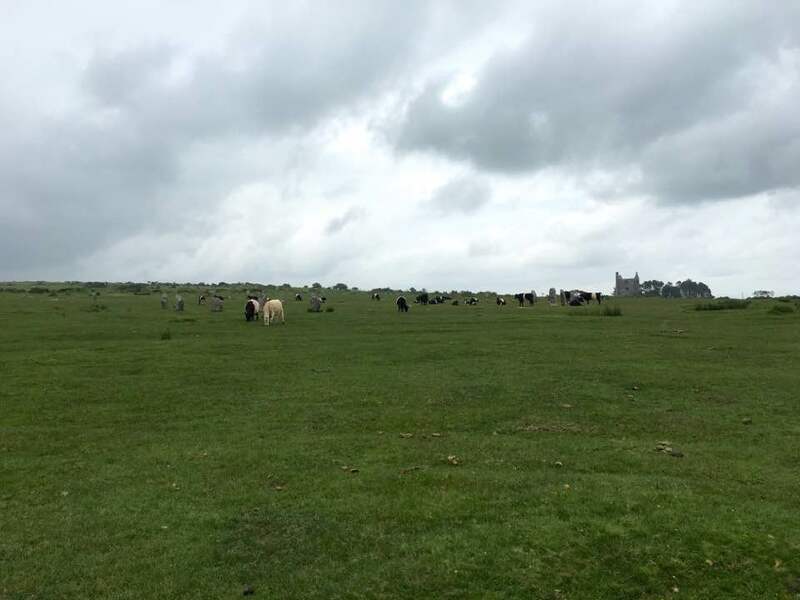 Like I said, it’s a huge space, but where were all the cows? 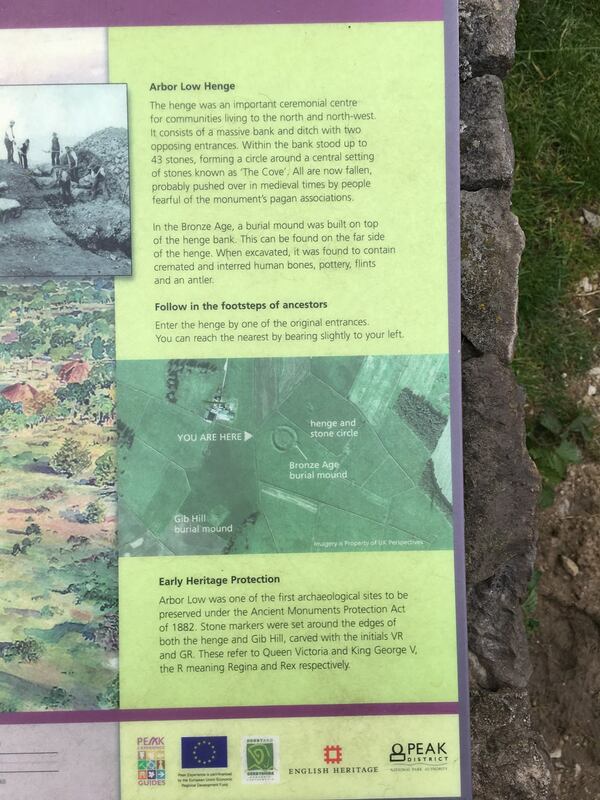 In the relatively small space in the middle of each of the 3 circles of course! 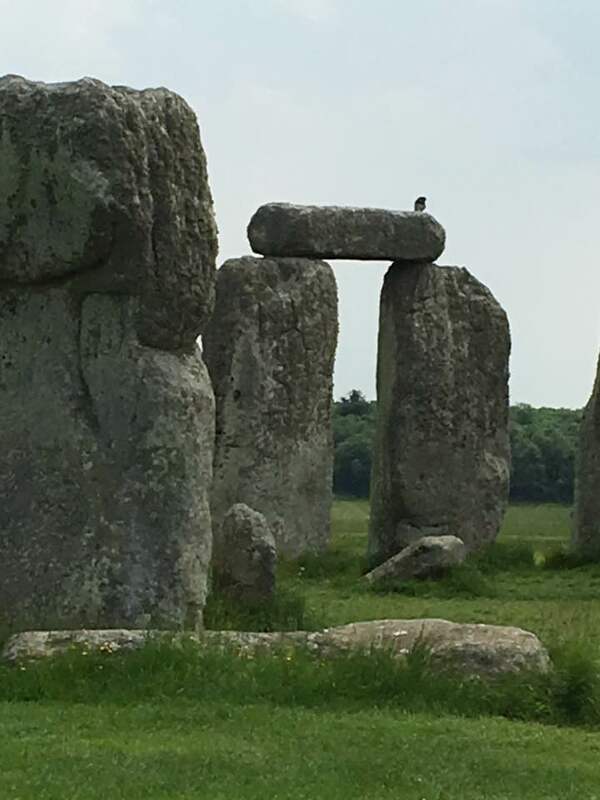 They obviously liked the energy inside the circles, but it did make photography of the actual circles a bit difficult, lol. 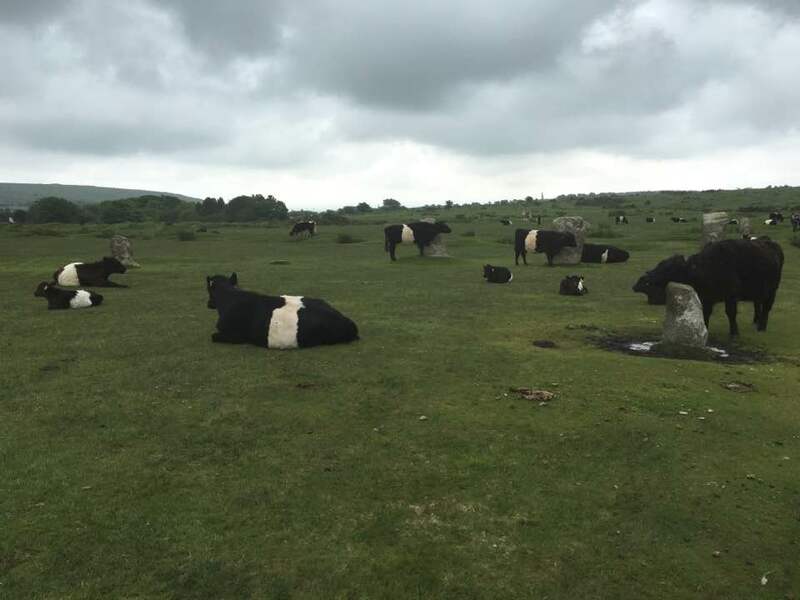 So here’s a few photos of moorlands, and ‘Belted Galloway’ cows in stone circles. 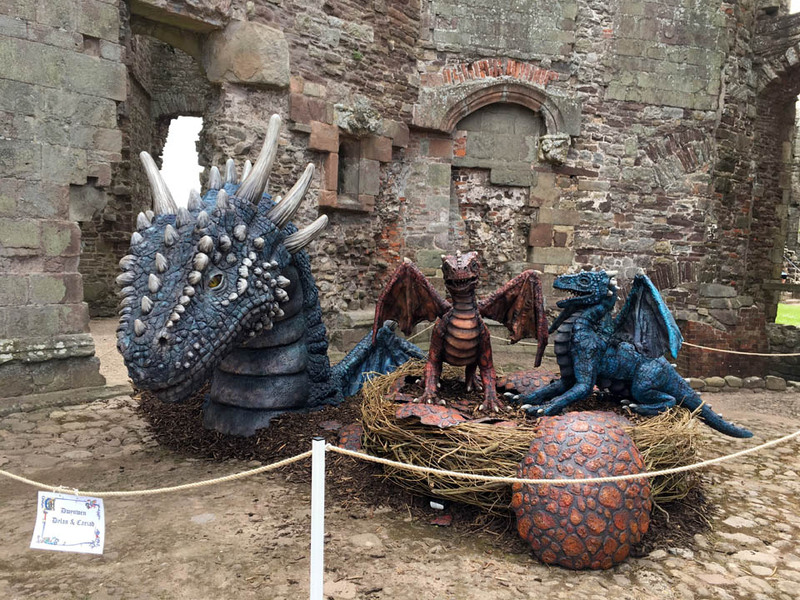 The comparative desolation and the overcast windy weather seemed to amplify impressions and thoughts of “here there be Dragons”! 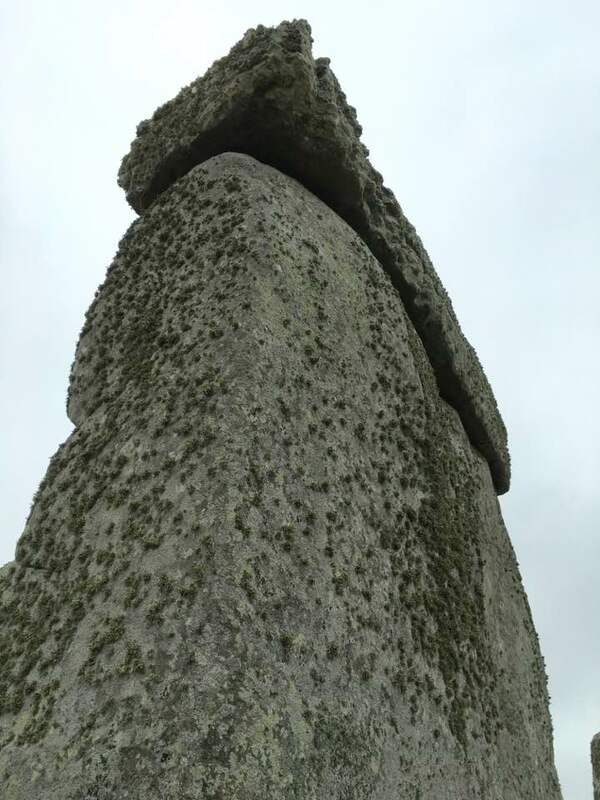 For a while there I had the feeling I was being watched — not so much by other people but by ‘something’ else — a presence that was quite tangible yet I couldn’t quite connect with it — whispers in the wind. 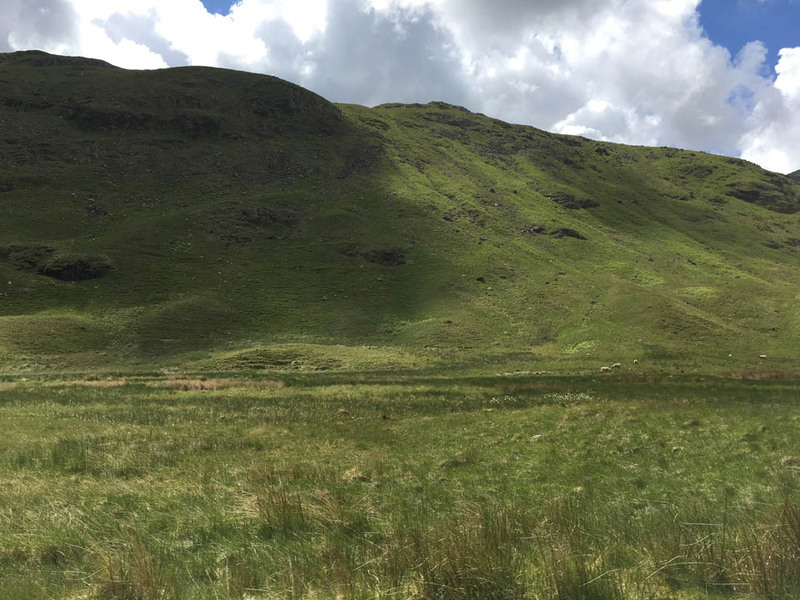 Looking at the surrounding landscape I felt that there were definitely Dragons in them thar hills! 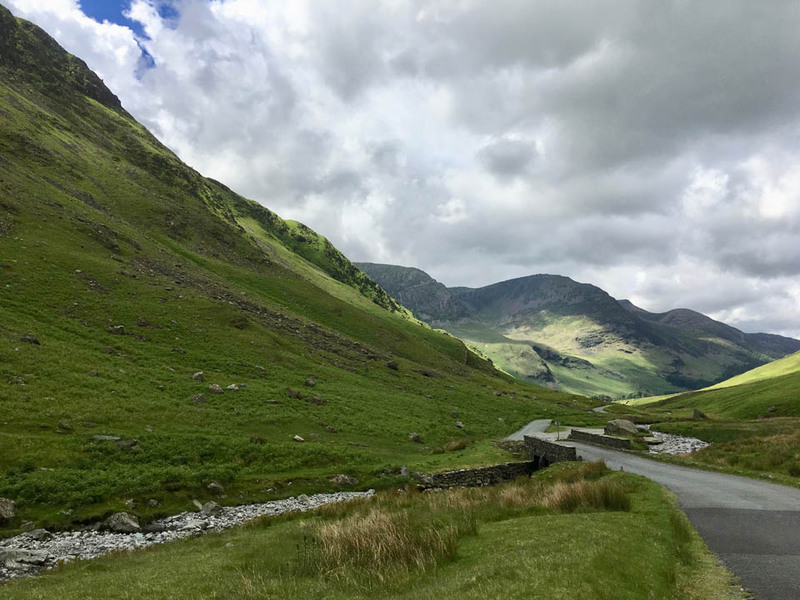 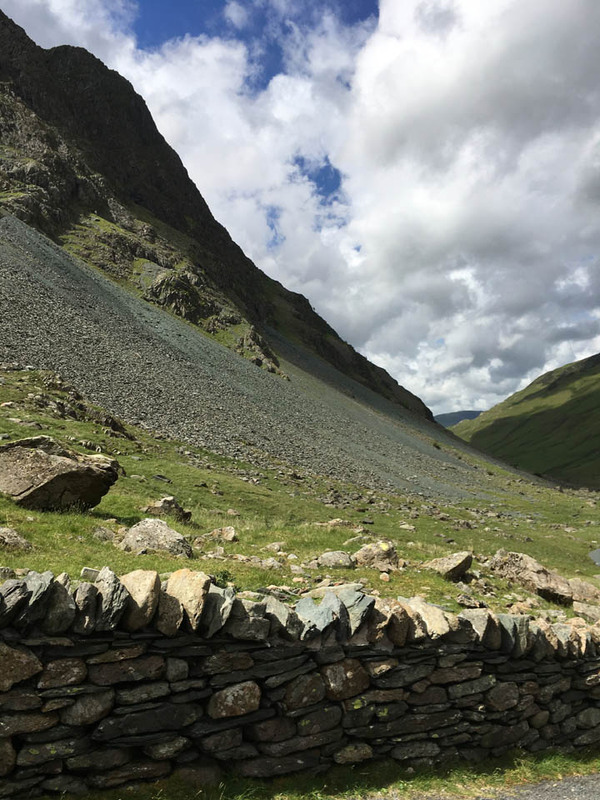 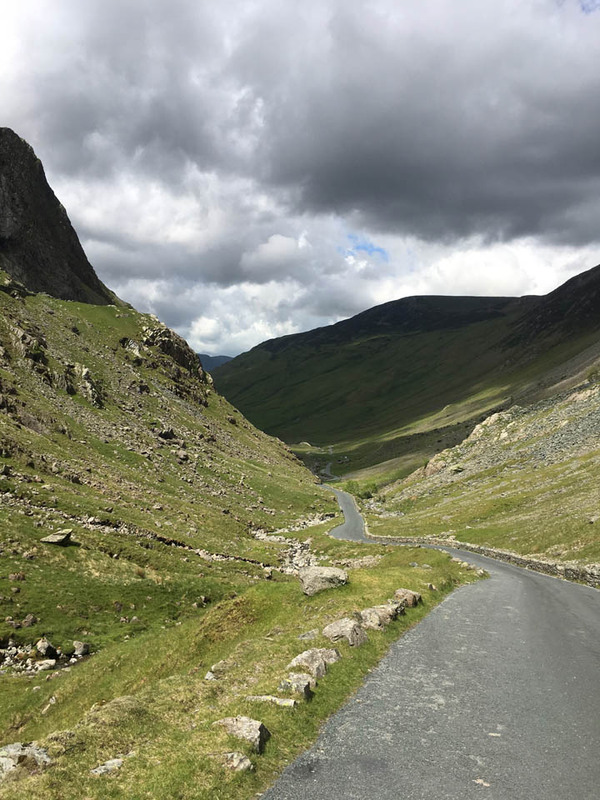 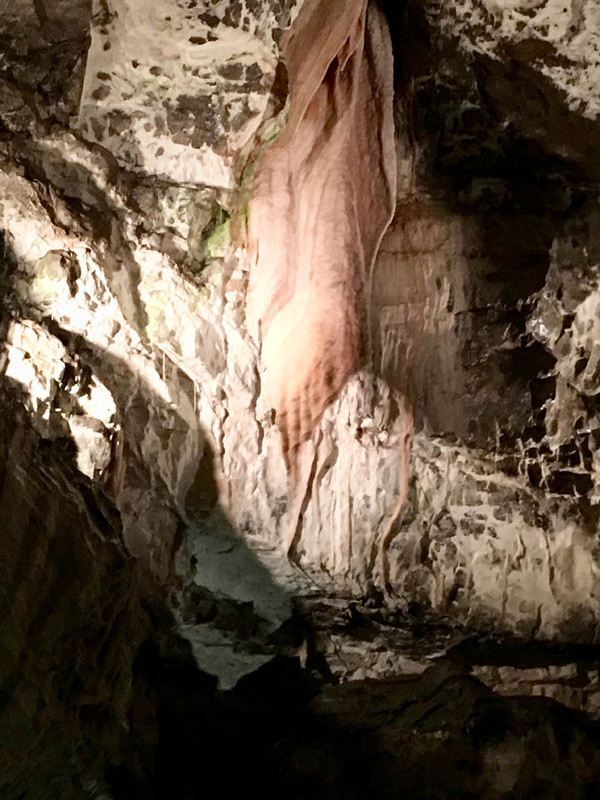 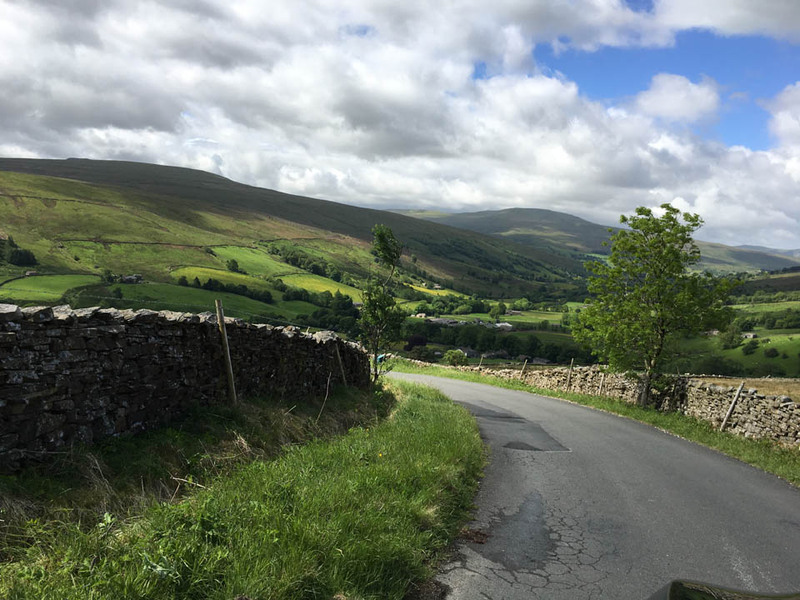 6th June 2017 — We journeyed across the Lake District (a mountainous region in North West England) through the Honister Pass (slate mining area) and eventually on through the North Pennines (the northernmost section of the Pennine range of hills which runs north-south through northern England) and through the Yorkshire Dales (an upland area of the Pennines). 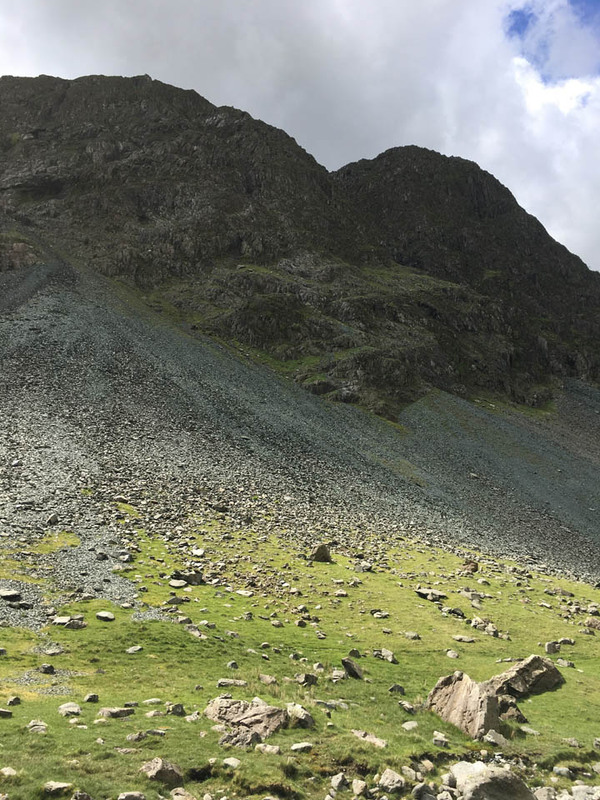 I found the whole mountainous area to have a very ‘Dragony’ feel about it. 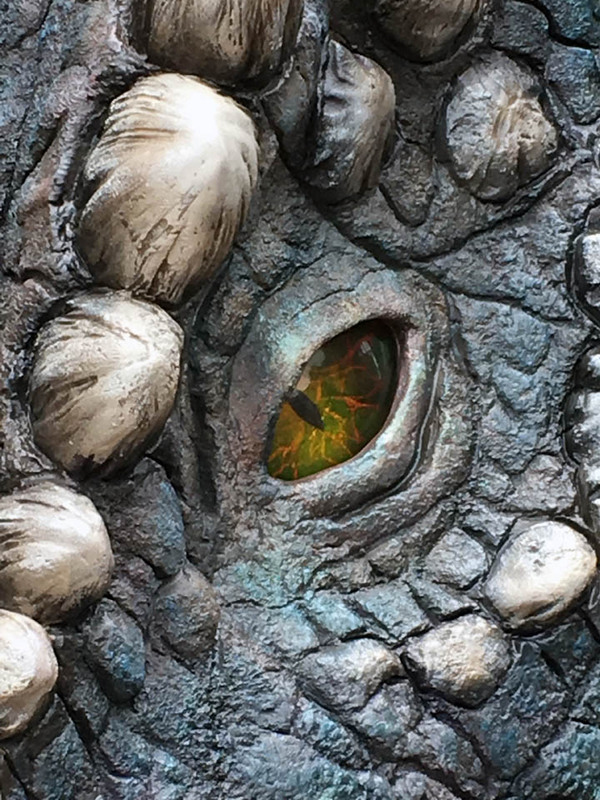 The more remote the area, the closer to the Dragons it felt — with the strongest presence being the massive Earth Dragons! 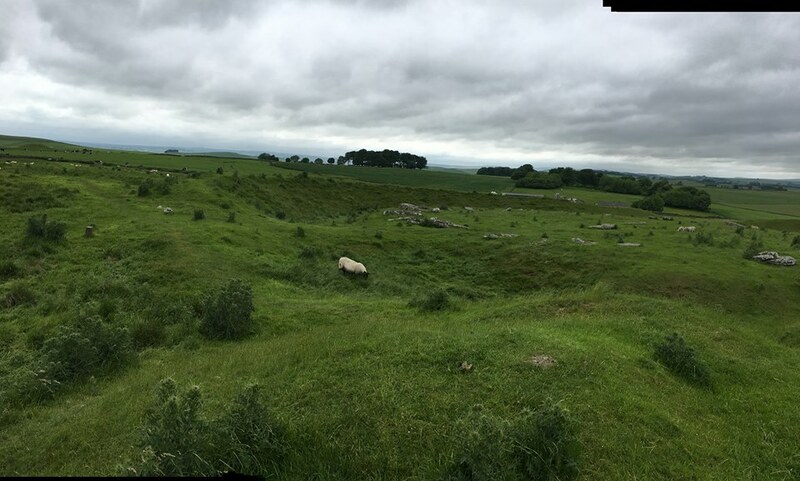 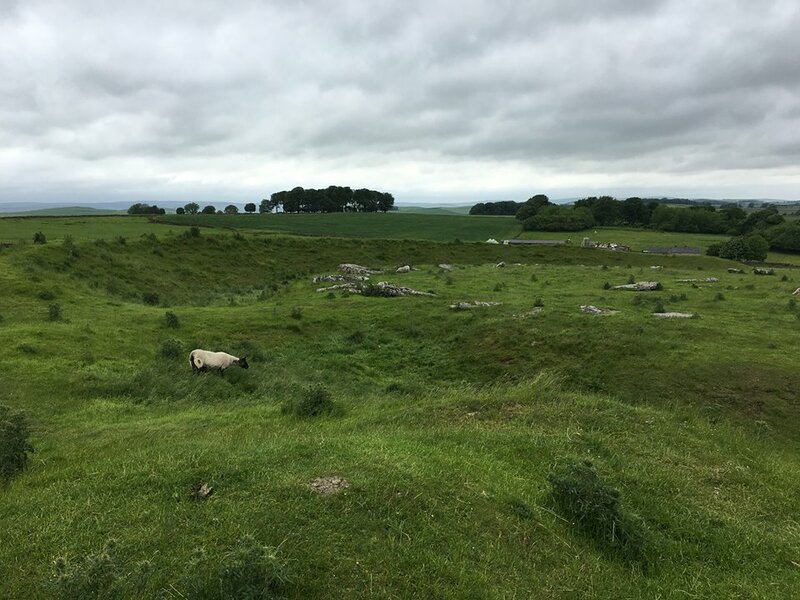 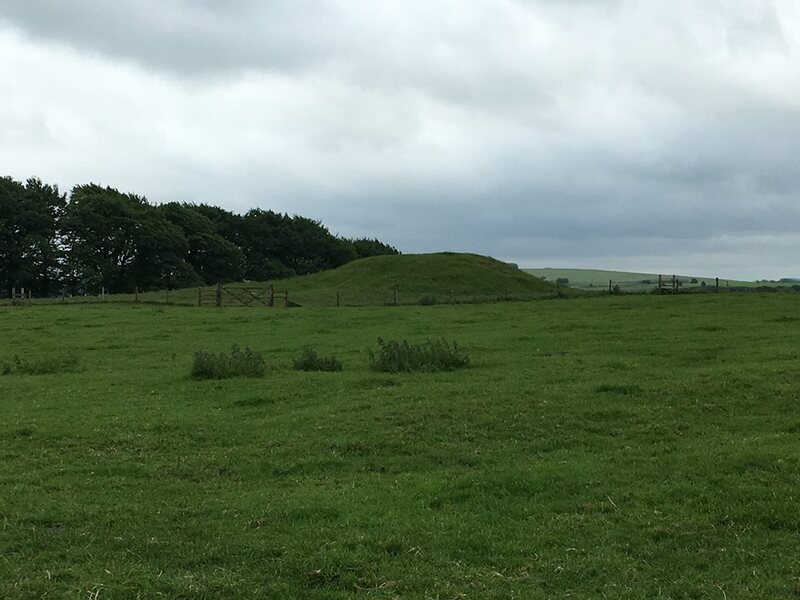 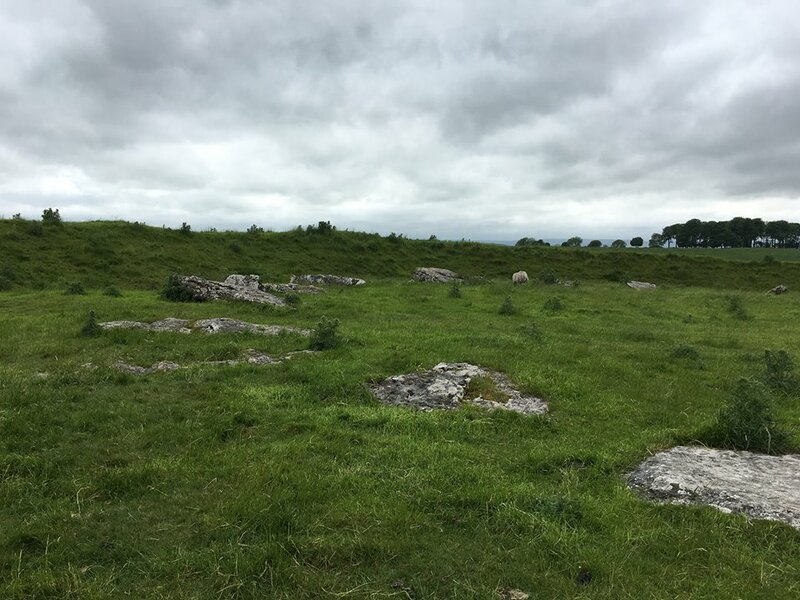 10th June 2017 — We visited Arbor Low Stone Circle & Gib Hill Barrow near Monyash. 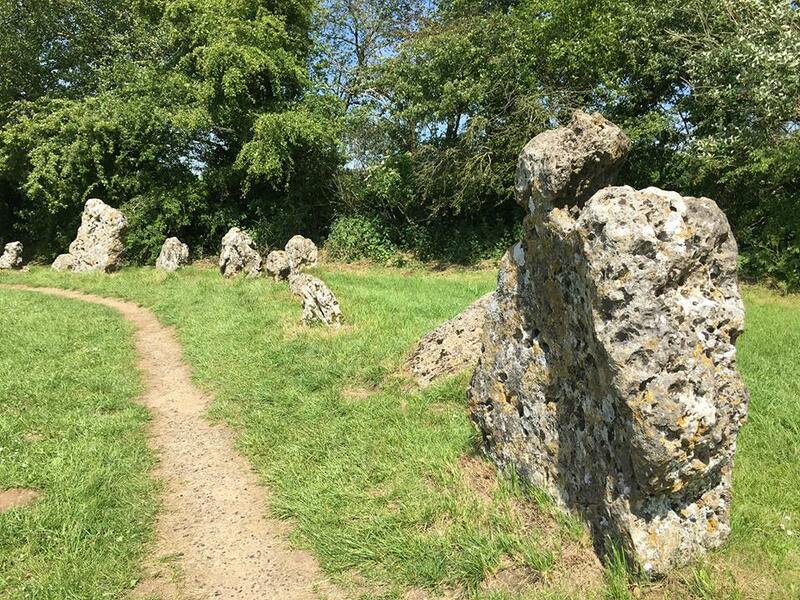 The stones in this circle are no longer standing but there is definitely a mystical feeling about the place. 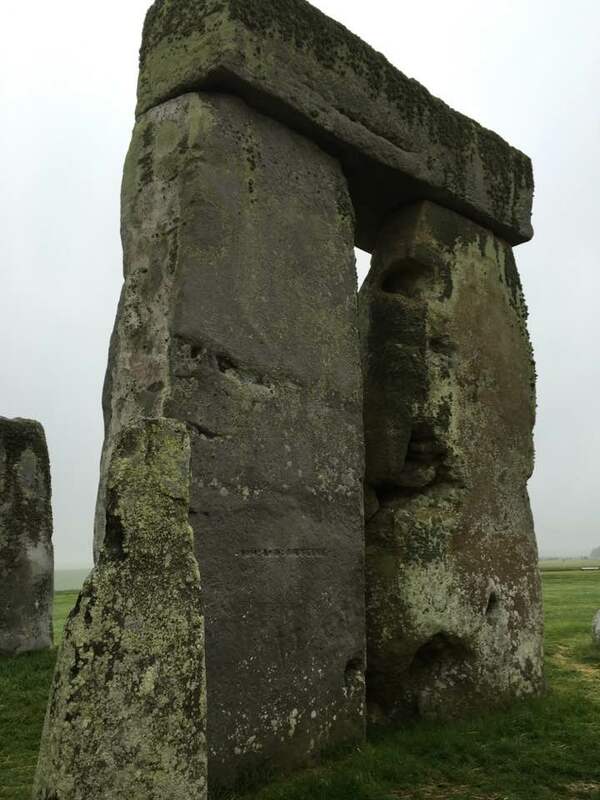 The strong wind blowing on the day also added to the feeling of mystery. 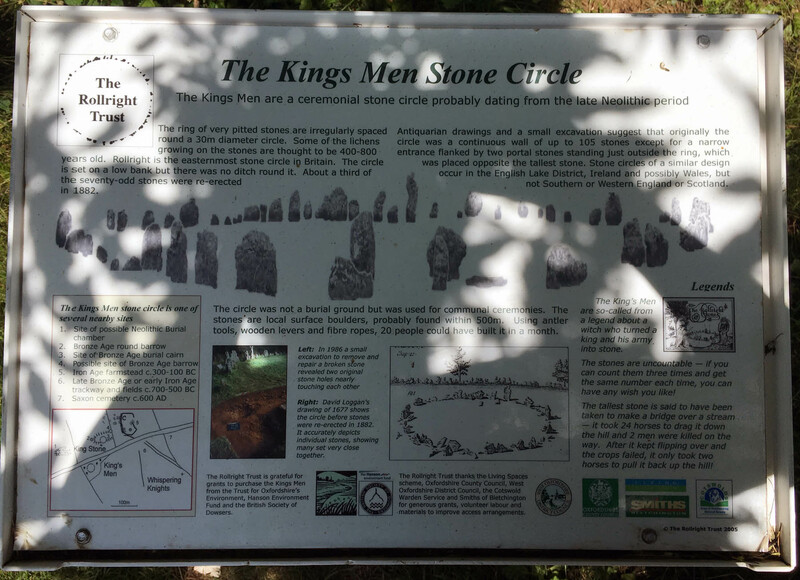 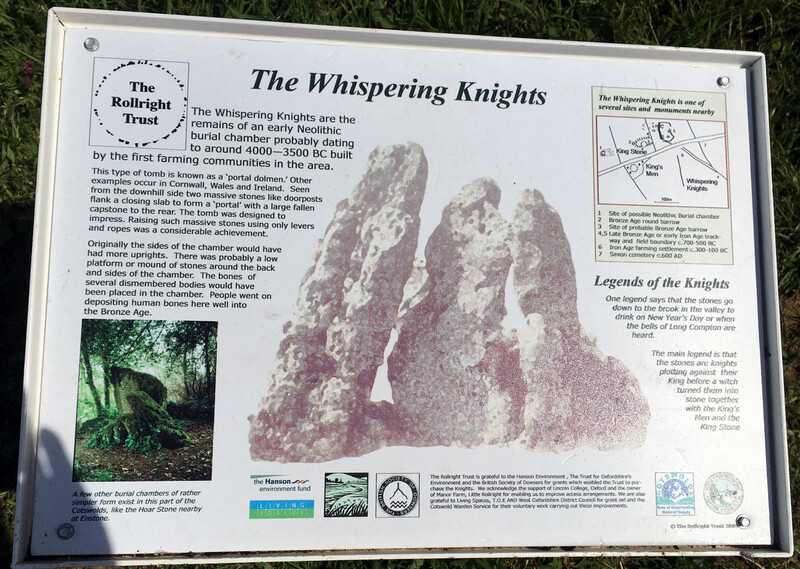 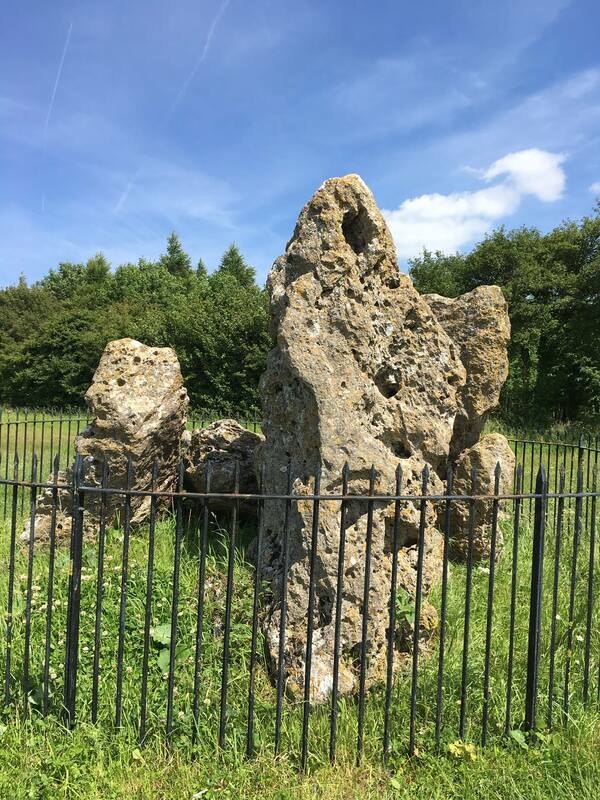 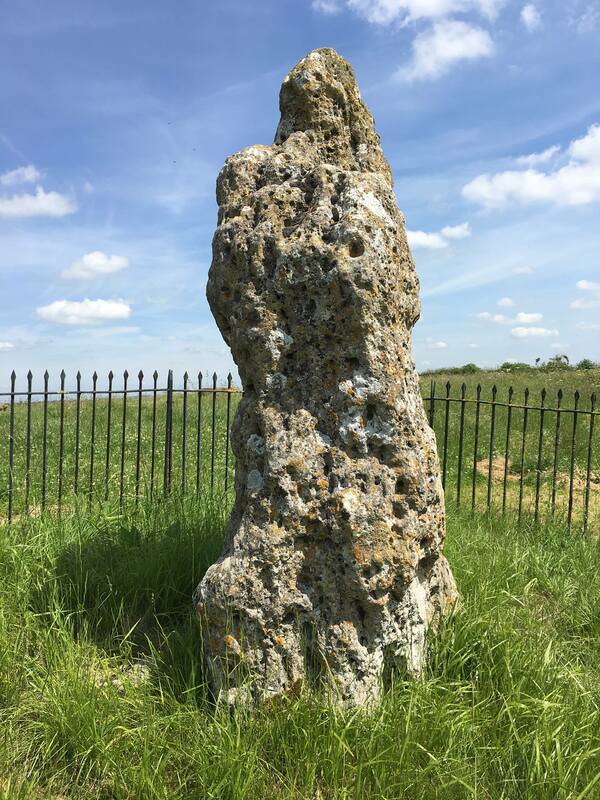 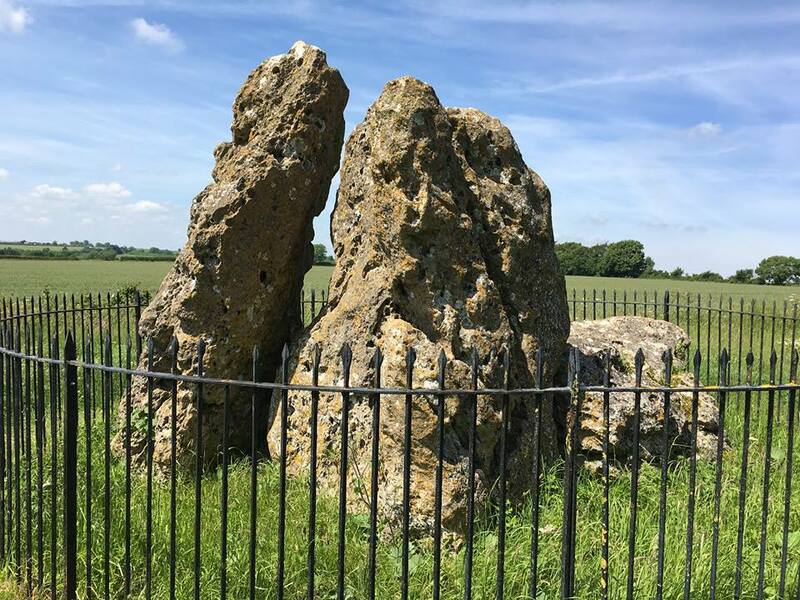 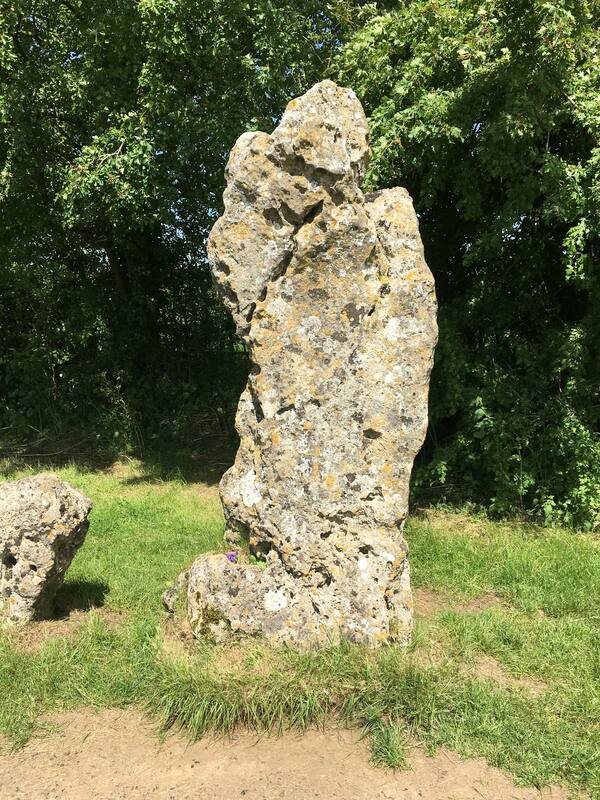 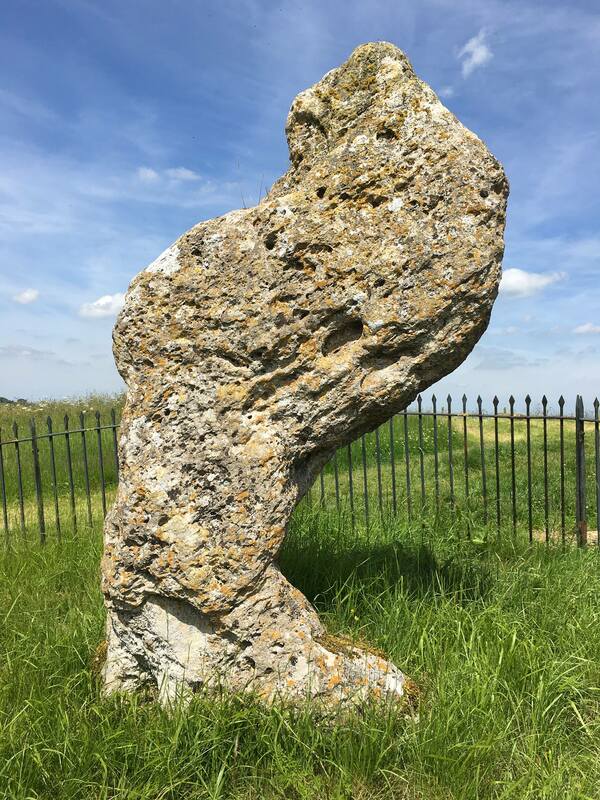 14th June 2017 — The Rollright Stones include the Kings Men Stone Circle, the Whispering Knights and the King Stone. 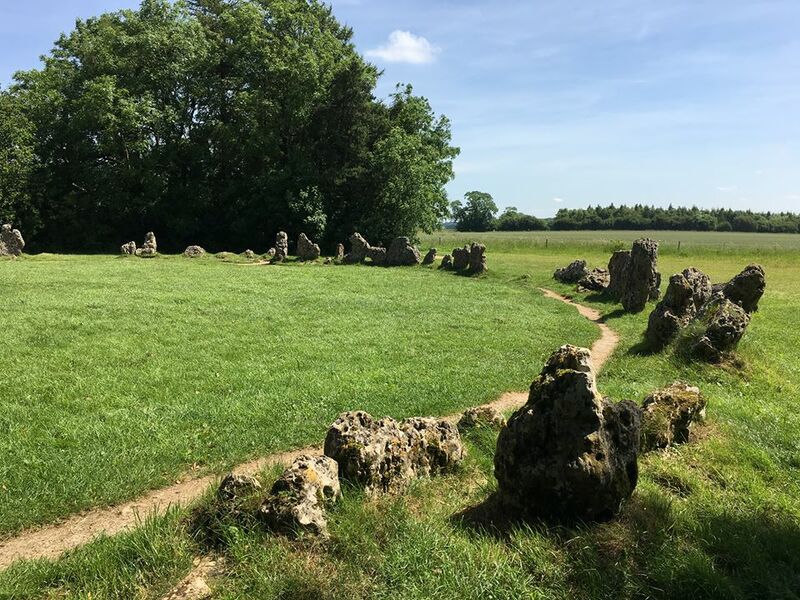 For a while at least, I had the stone circle to myself and was able to slowly walk the perimeter of the circle, soaking up the atmosphere of the place. 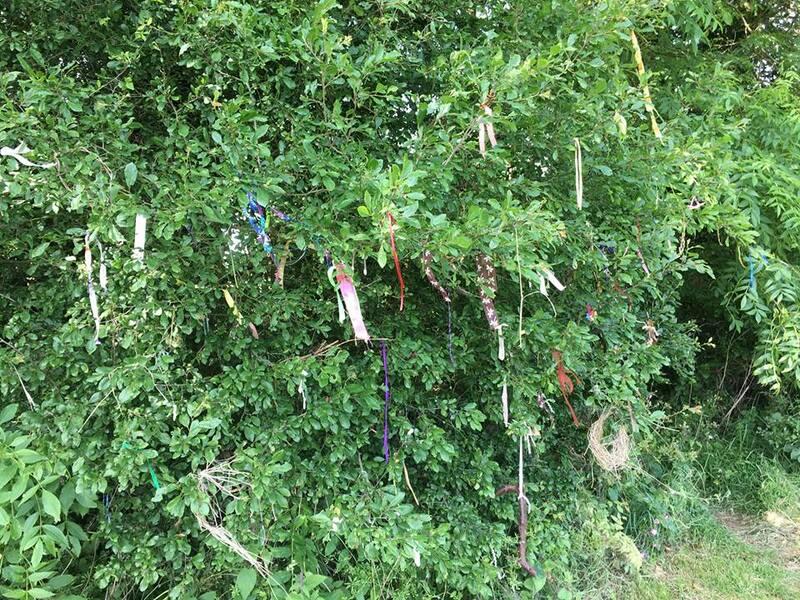 One small tree at the side of the circle was covered in clooties/clouties (bits of ribbon or other stuff tied to trees as part of a healing spell). 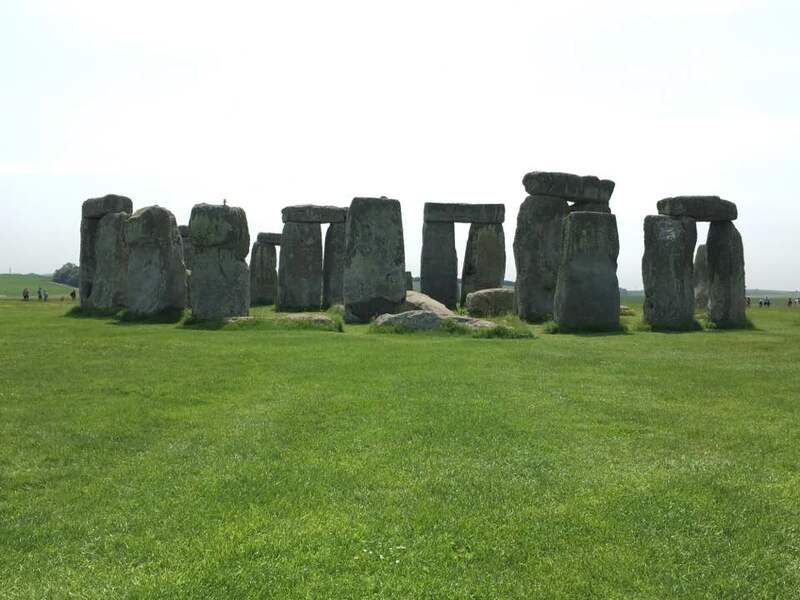 I left a ‘clootie’ made of grass, mainly just to say, “I was here”, lol. 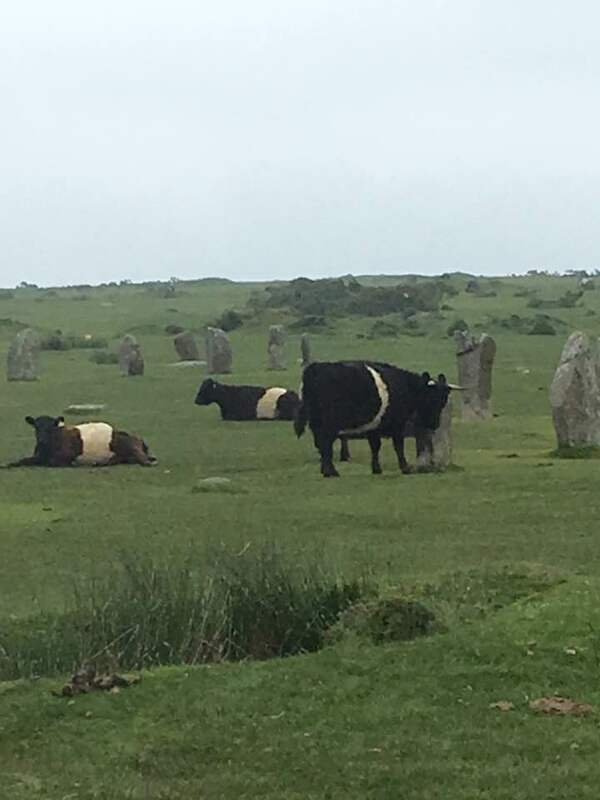 There was a little spell involved too but I won’t elaborate. 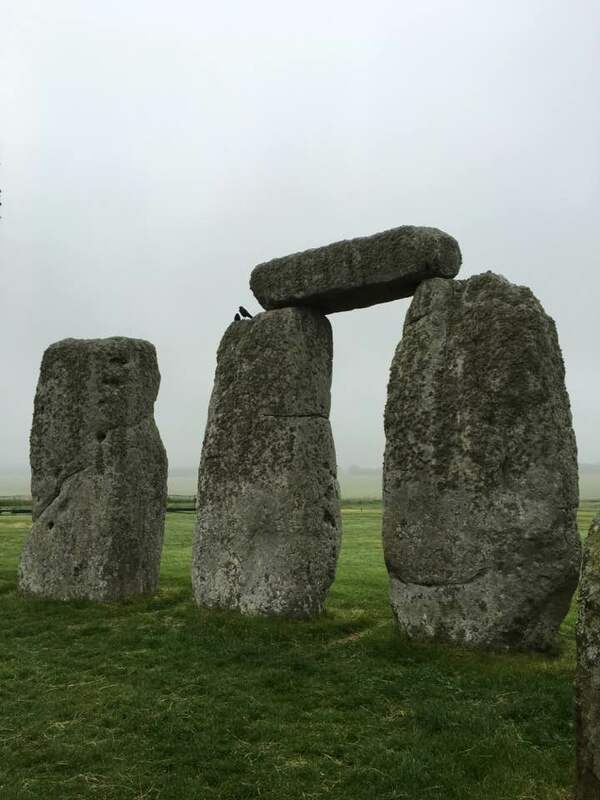 These spells rely on the ribbon or whatever being biodegradable so that by the time the object has rotted away, the magick will be done. 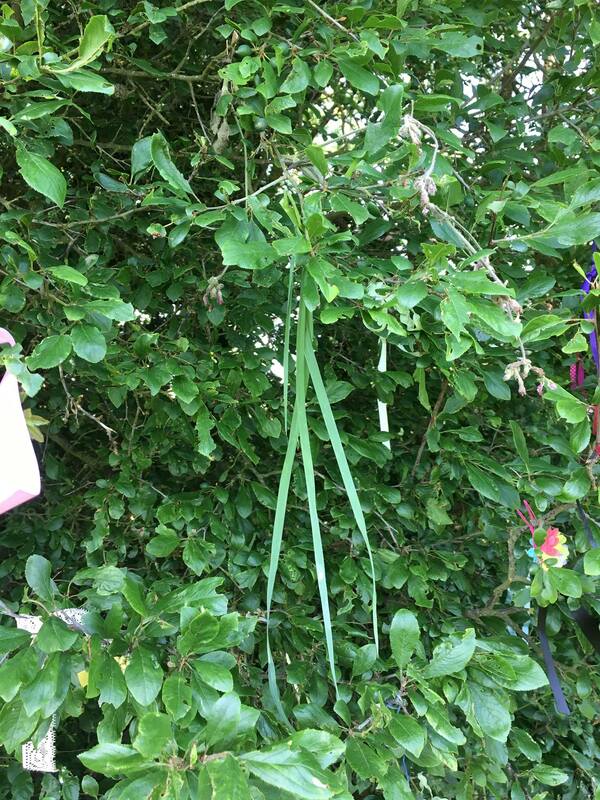 Unfortunately the many synthetic bits of ribbon and cord tied to the tree won’t work the desired magick in an acceptable or practical time frame, which kinda defeats the whole purpose of doing such a spell. 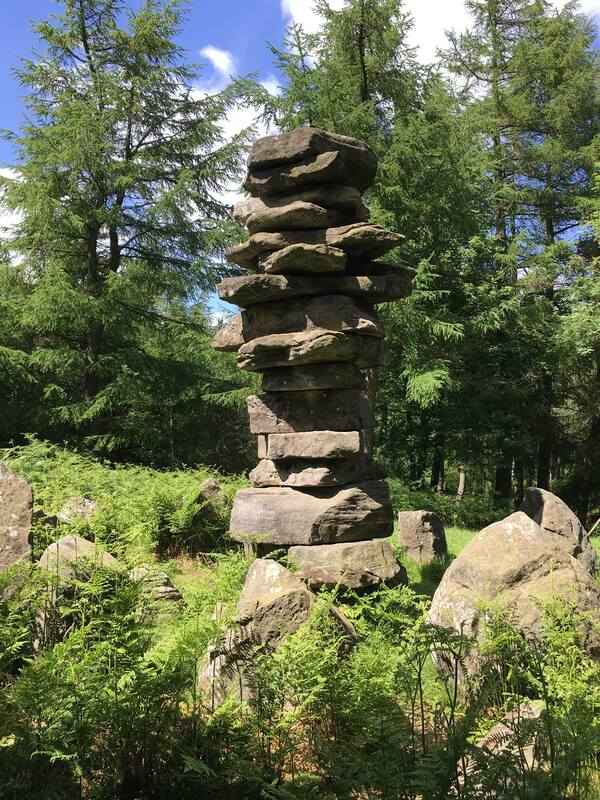 Many people consider such additions to any sacred site akin to littering and desecration. 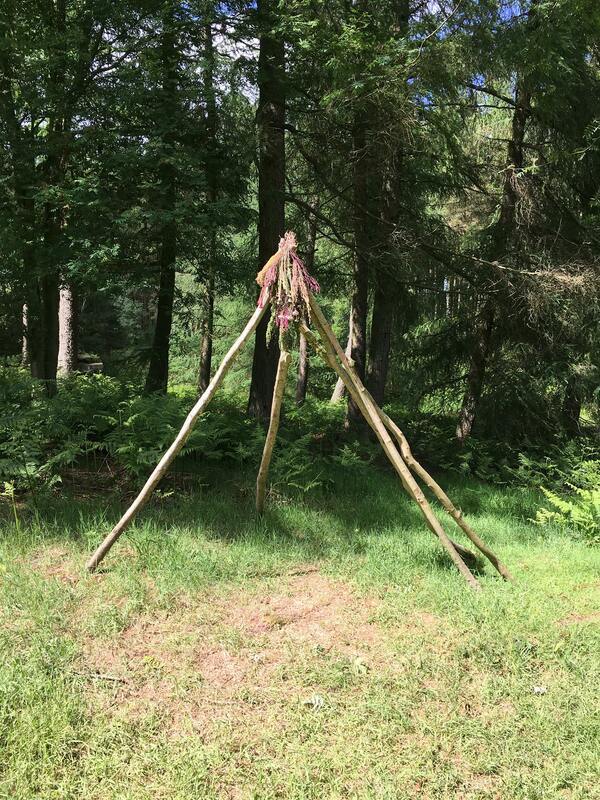 Personally, as long as it’s not harming the tree and is confined to one small area, I think it adds to the magickal charm of a place. 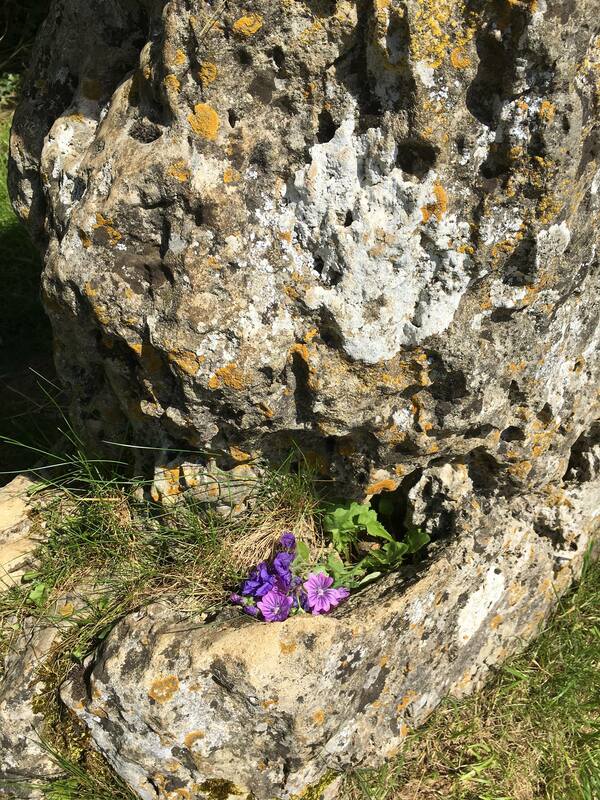 There were also little bunches of flowers left by somebody in some of the hollows in the stones. 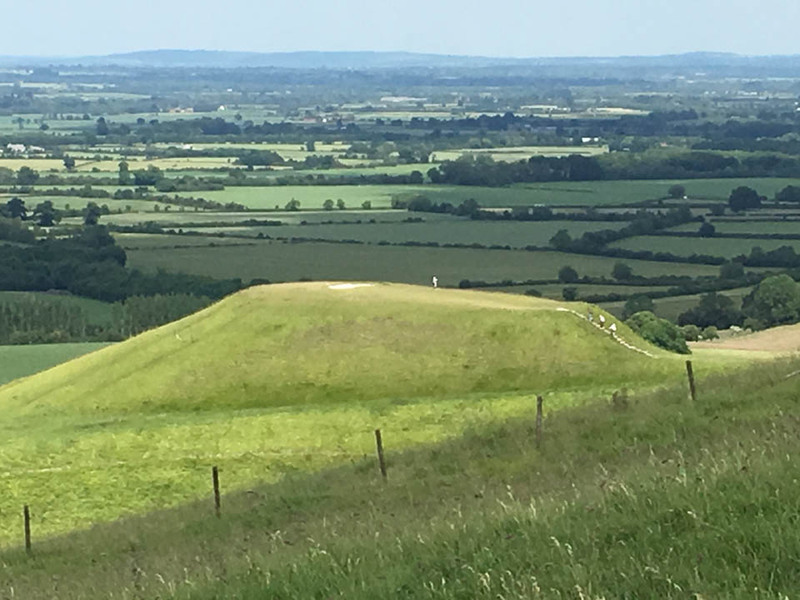 14th June 2017 — After seeing the Rollright Stones we travelled on to see the Uffington White Horse. 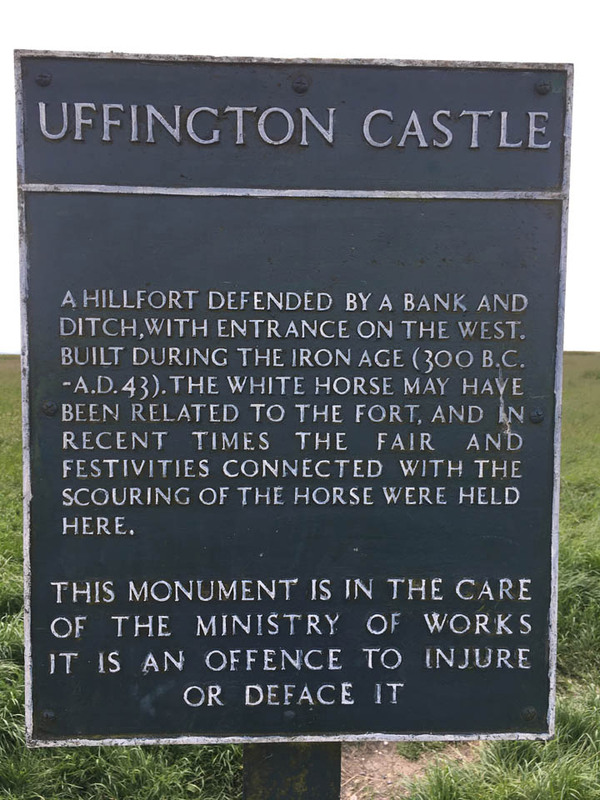 I sensed that this area also had an air of mystery and of Dragons about it as we walked from the car-park across the fields and up the hill to the horse and the Iron Age hill fort called Uffington Castle. 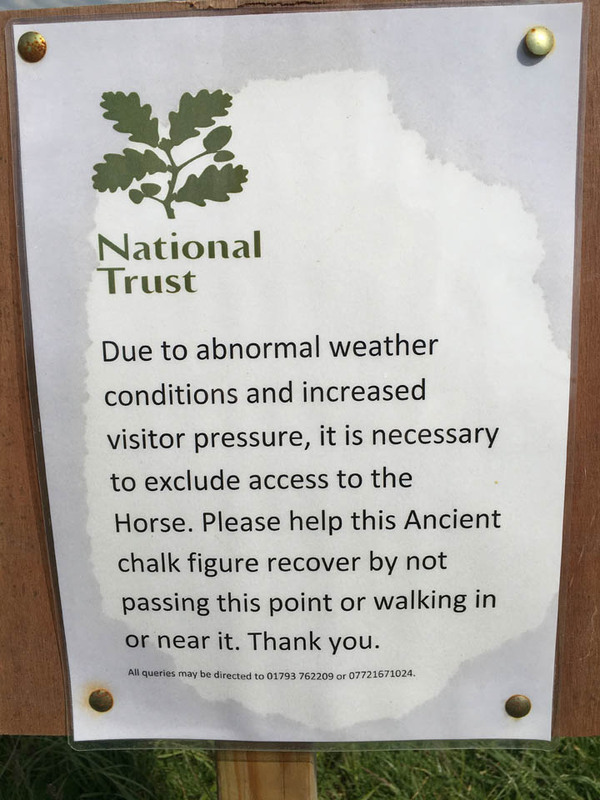 Unfortunately we were not able to get very close to the horse as access had been restricted to help preserve it. 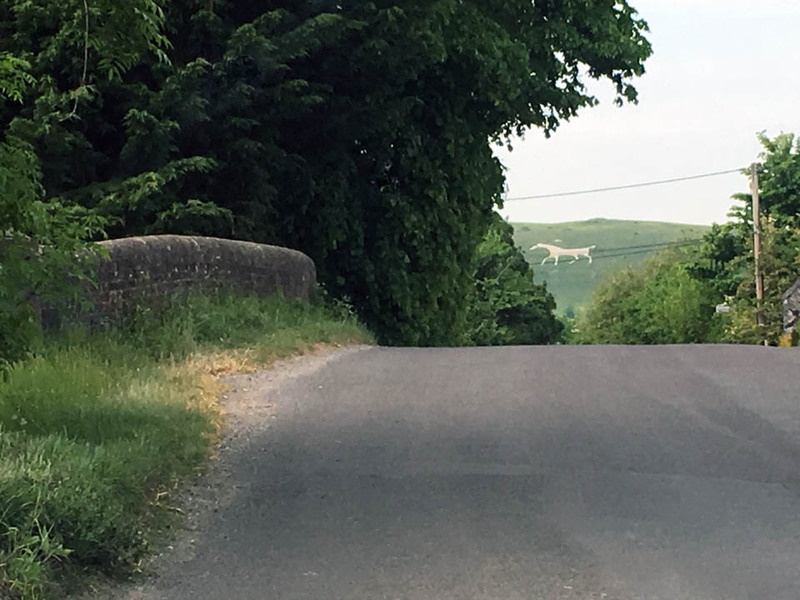 Having already seen another white horse in 2016 that did actually look like a horse it was hard to see the ‘horsiness’ of this one. 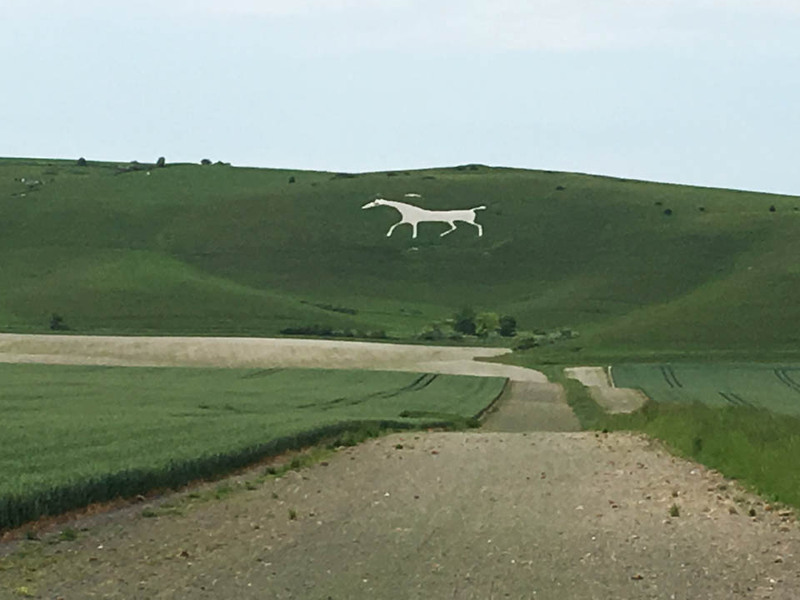 It has also been suggested by some that rather than a horse or horse goddess such as Epona it could be a representation of the Dragon killed by St George, which is an event thought to have taken place on nearby Dragon Hill. 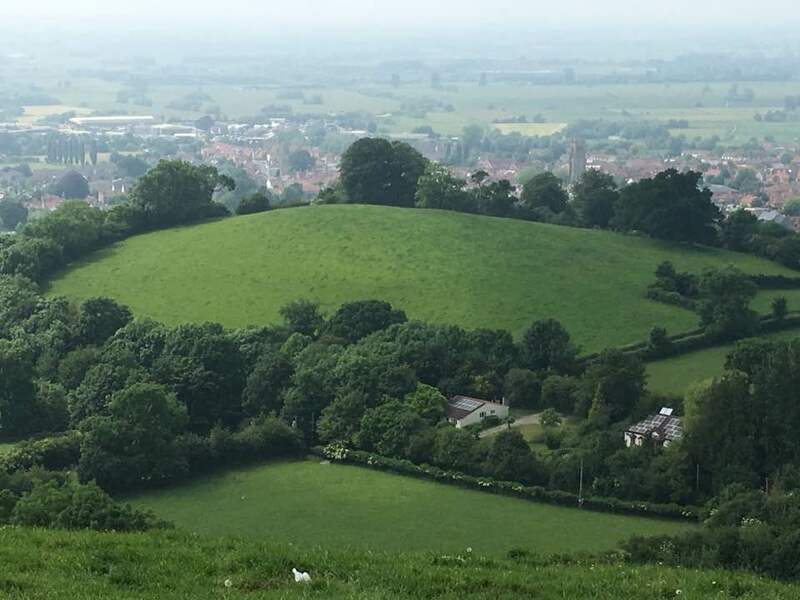 We saw Dragon Hill from a distance but didn’t actually walk on it. 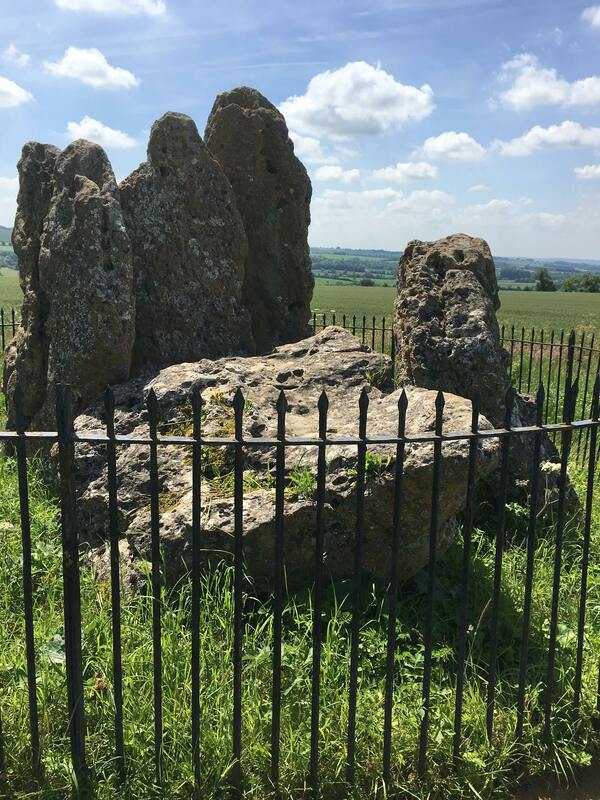 Whether the St. George story is true or not I don’t know, but if he did kill a physical Dragon there, the Dragons are thumbing their collective noses at this because the Dragon spirit is definitely alive and well at this location! 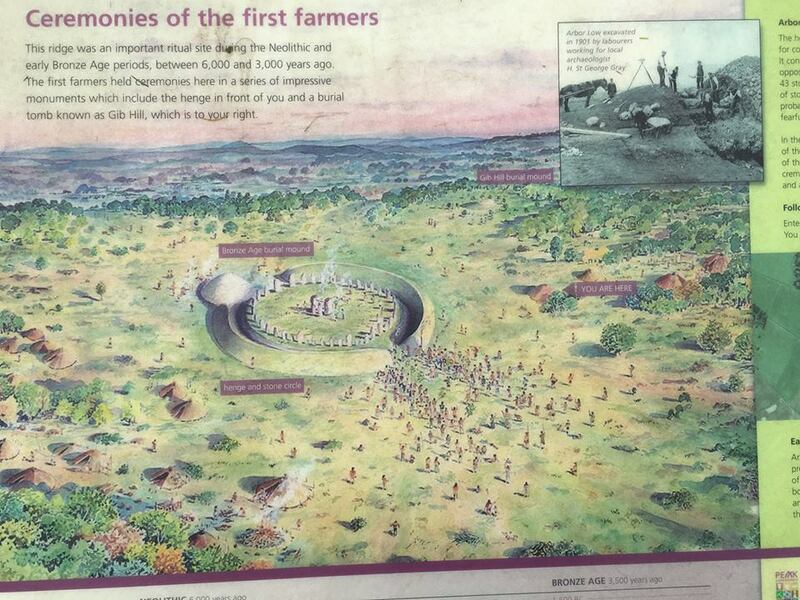 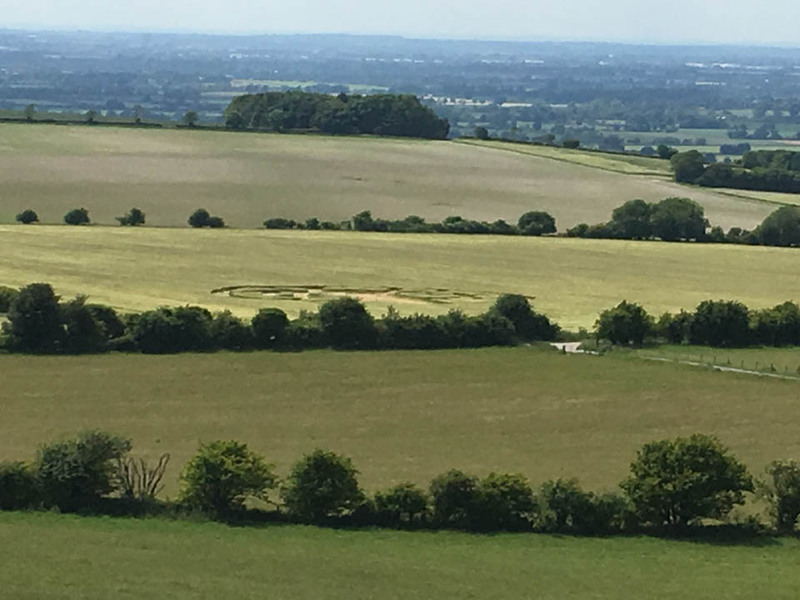 The hill fort provided an excellent view of the surrounding countryside (obviously why it was built there, lol) including what appeared to be a crop circle in a nearby field. 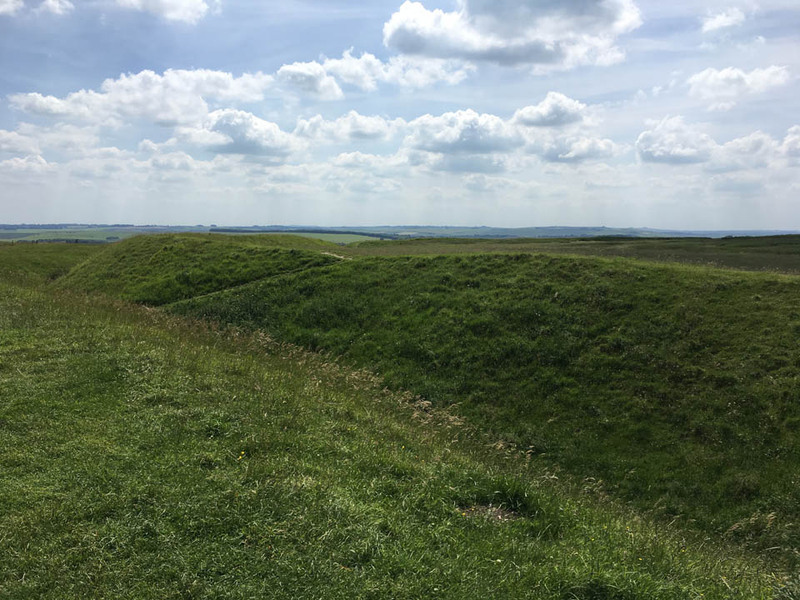 Uffington Castle viewed from the field below after walking back down. 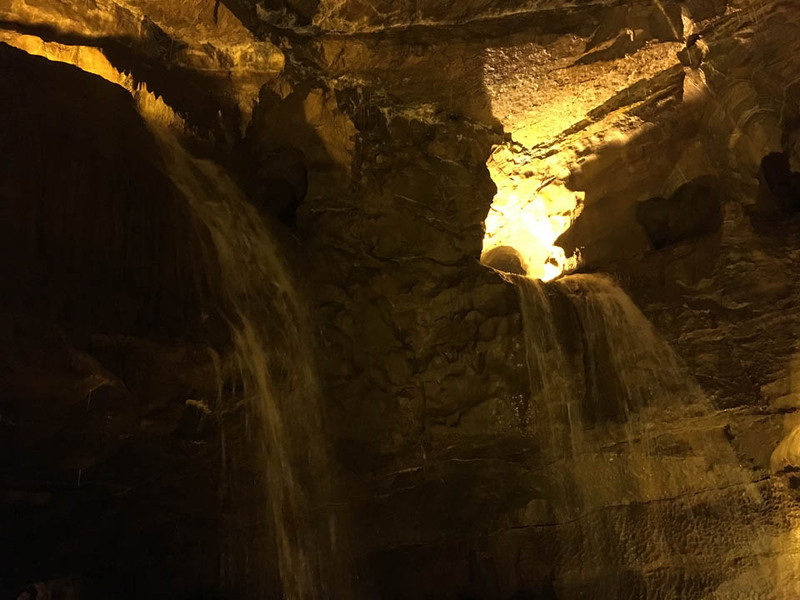 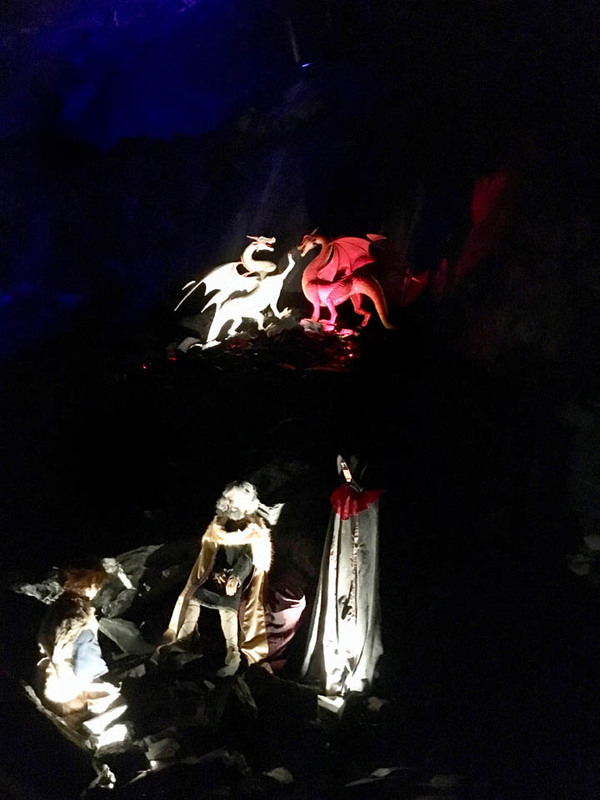 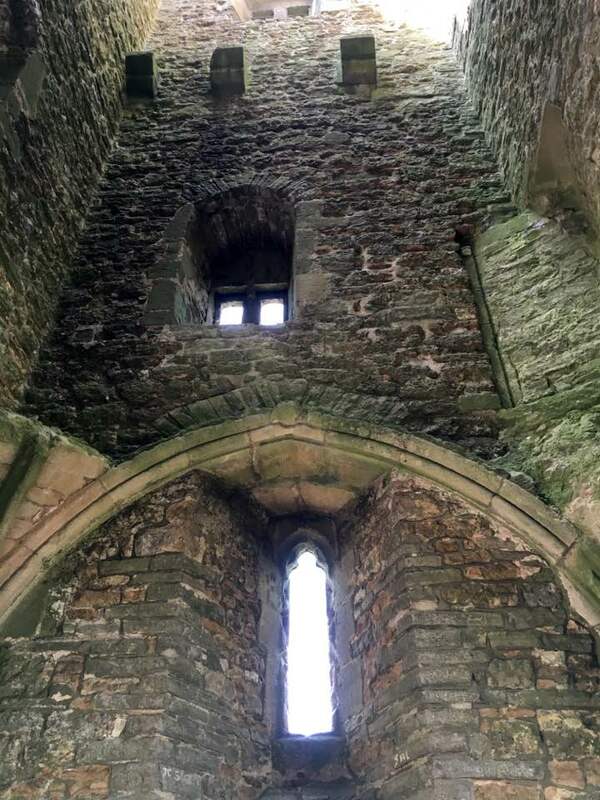 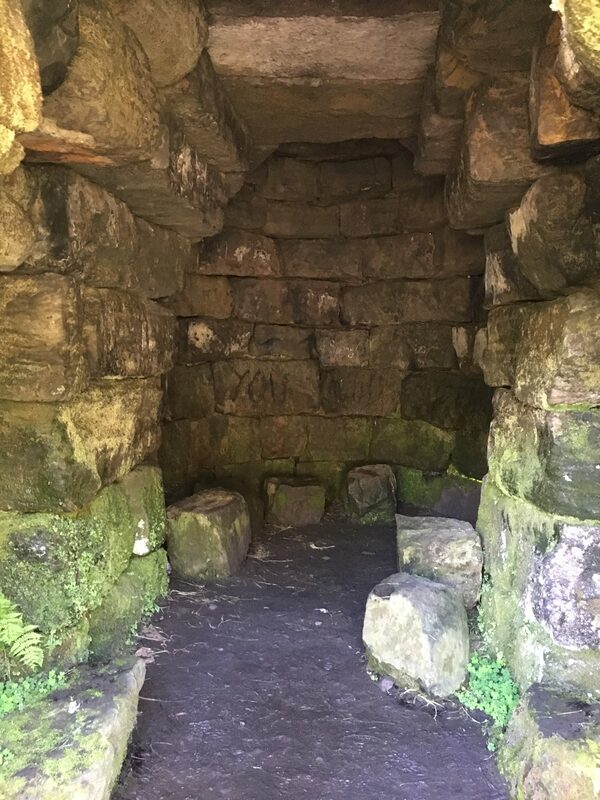 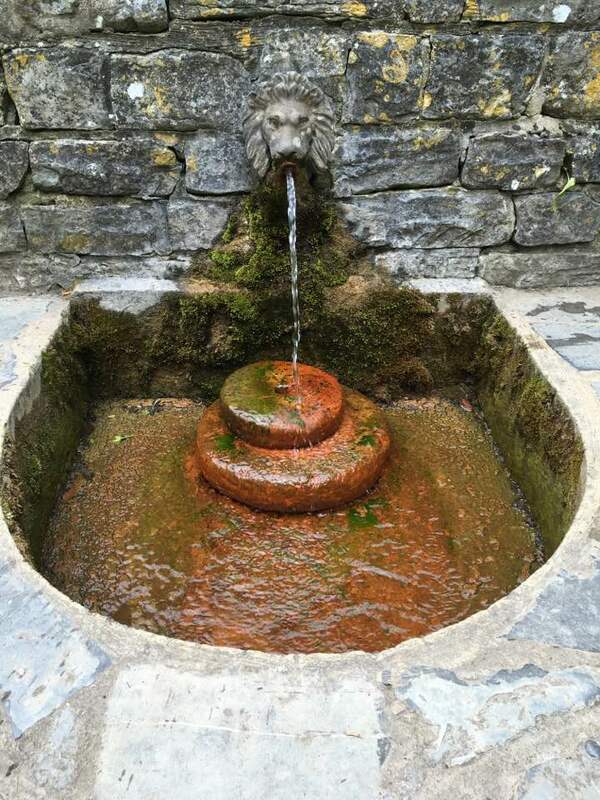 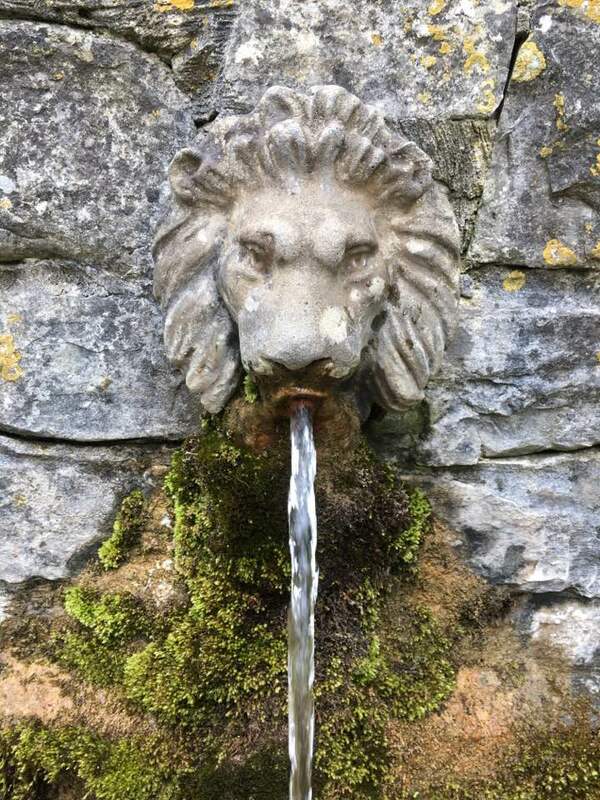 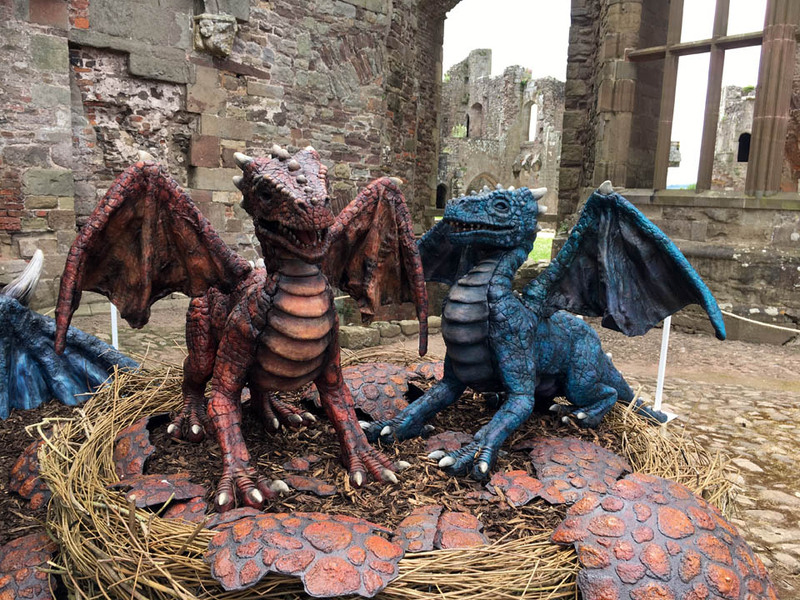 Raglan Castle – There Be Dragons! 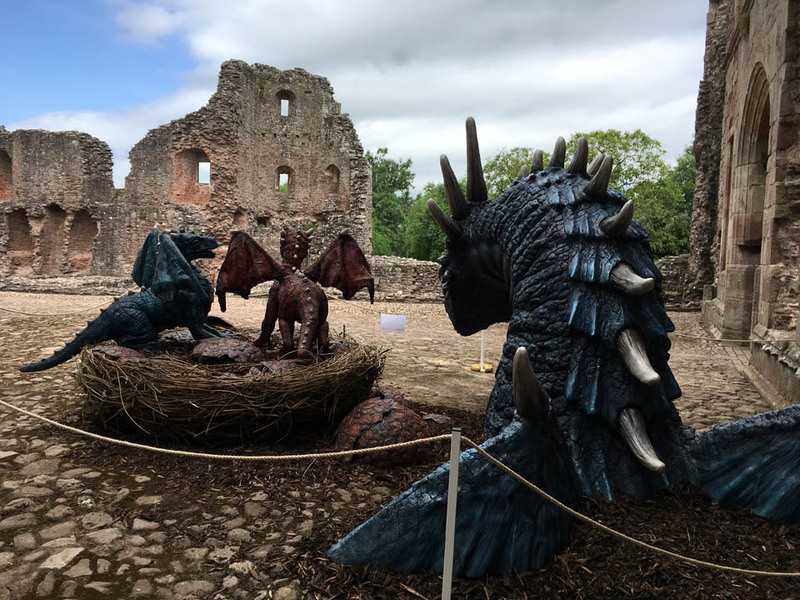 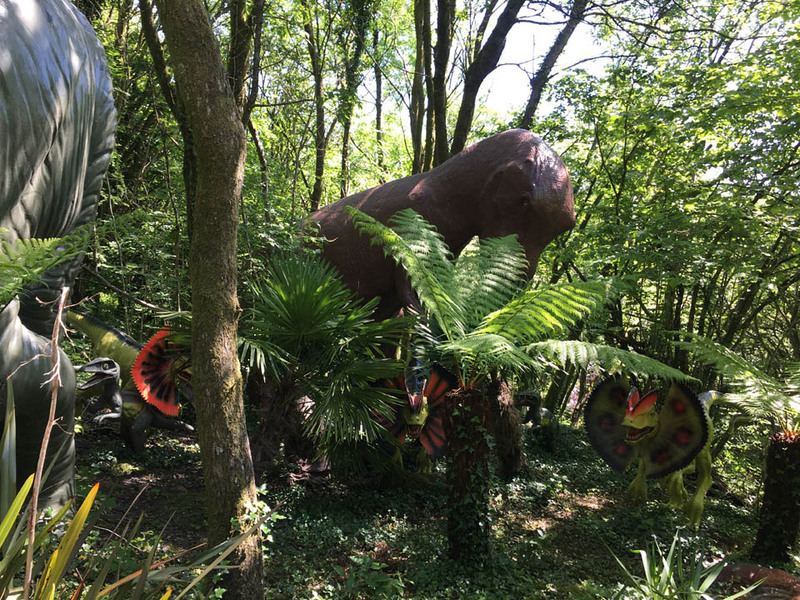 16th June 2017 — We drove to Wales and went to Raglan Castle …there be Dragons! 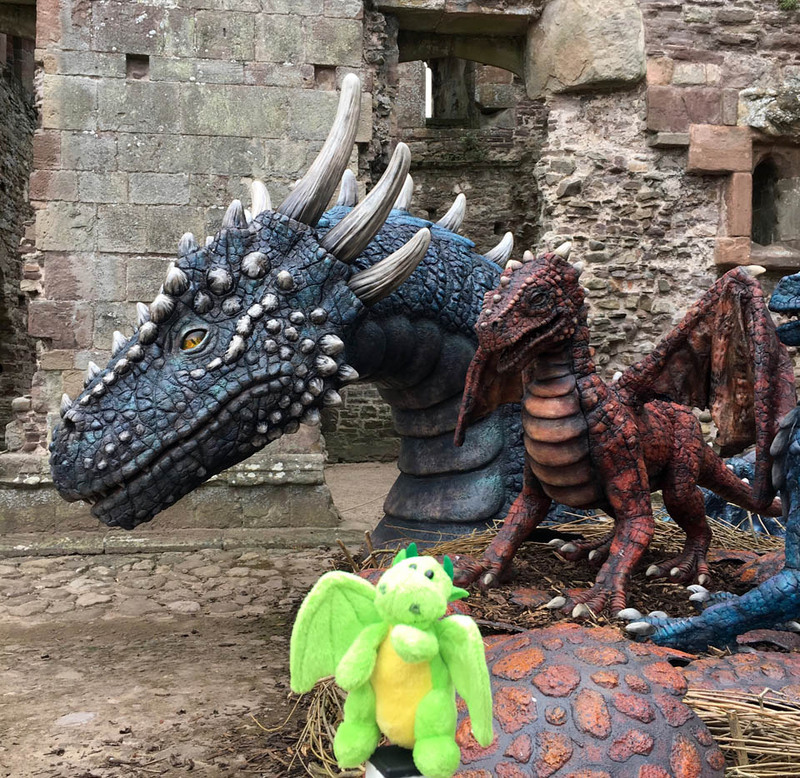 We met Dywnwen and her Dragon Babies Dylan and Cariad at Raglan Castle. 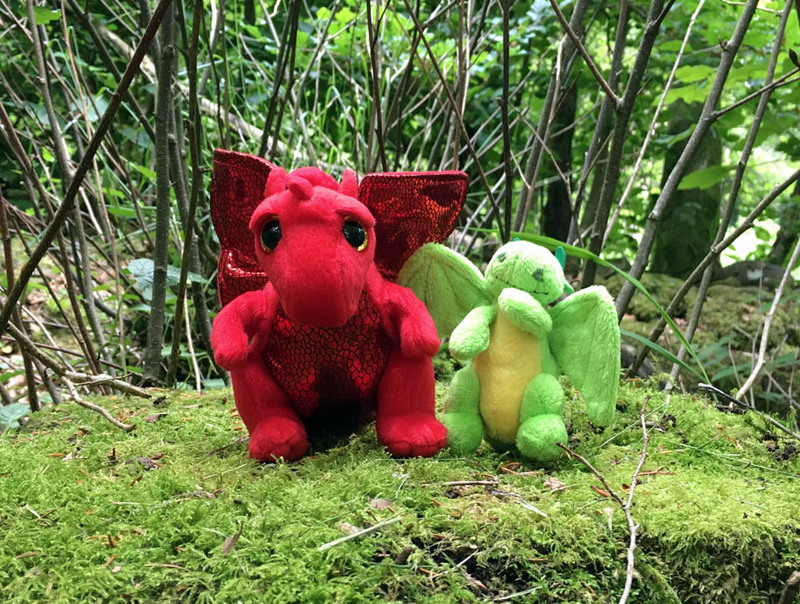 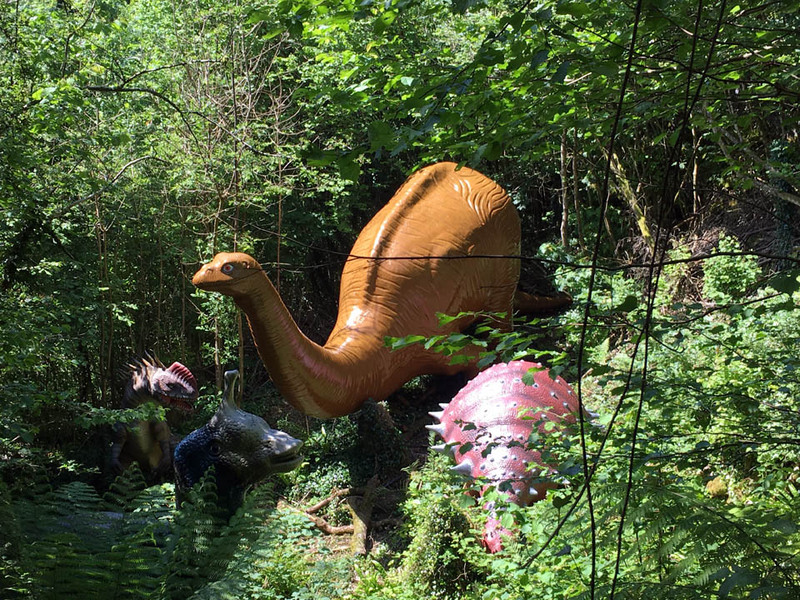 Unfortunately Dewi, the daddy Dragon was not visiting this location at the time. 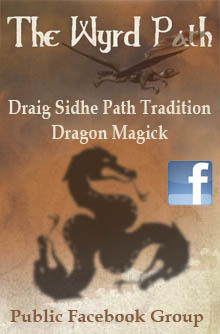 (See here for more details). 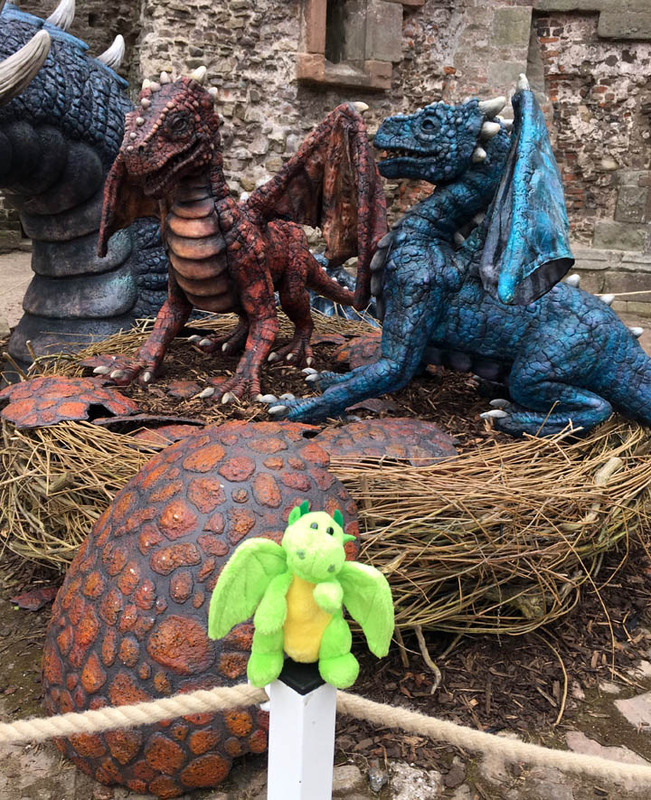 Raglan the Welsh Dragon — On the way out of Raglan Castle we passed through the gift shop, where I found a friend for Clifford, whose name was of course ‘Raglan’. 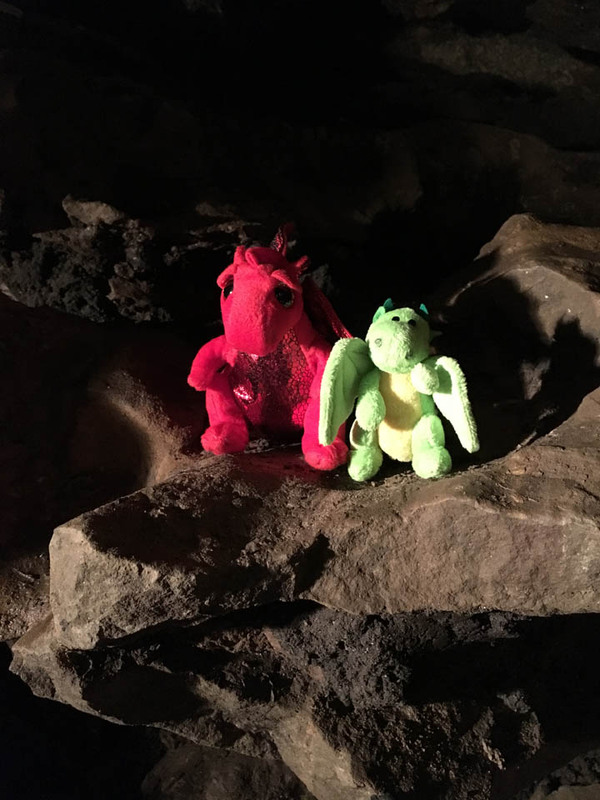 Here is a photo of Raglan and Clifford together at our next destination which was Craig-y-Nos (click image to enlarge). 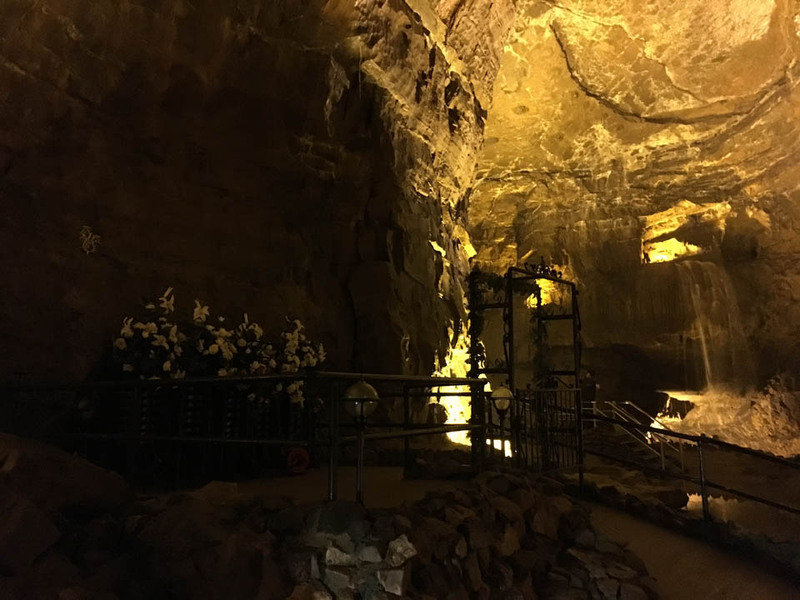 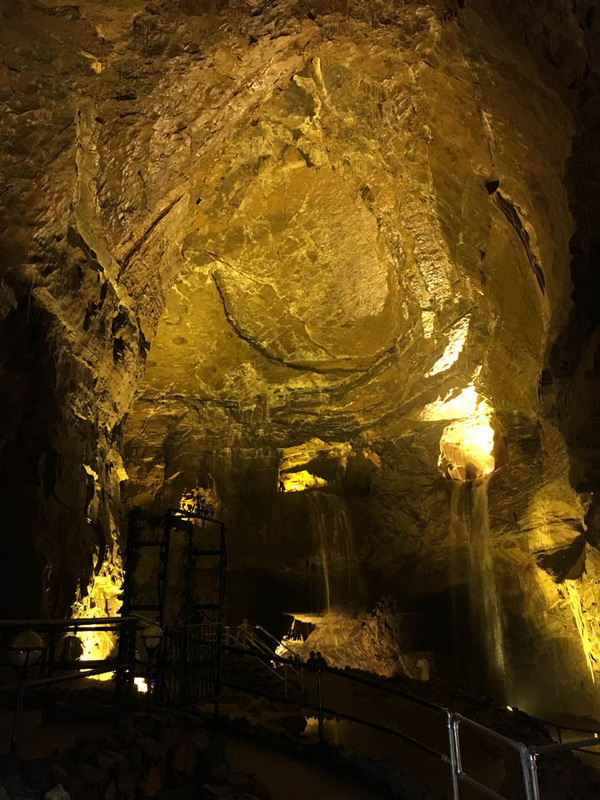 The wedding chapel at Cathedral Cave. 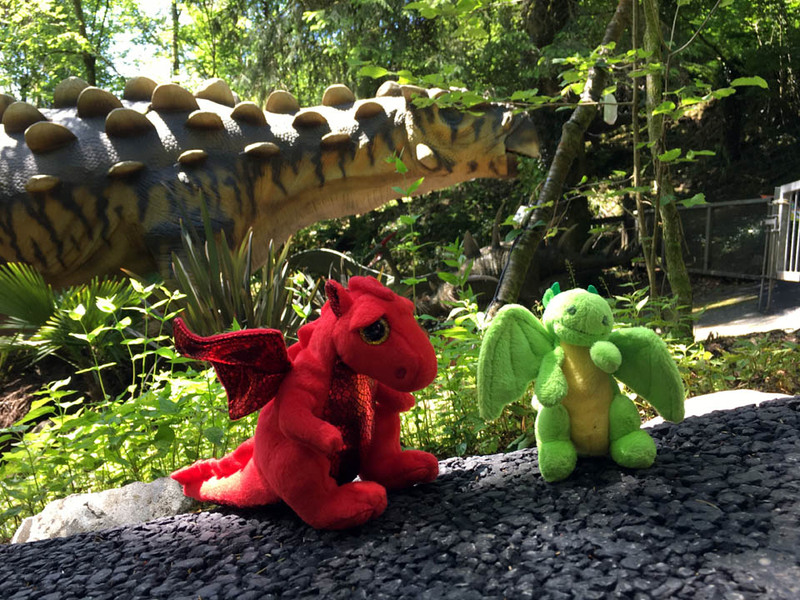 Raglan looks a bit worried but Clifford doesn’t seem to mind as the critter behind them is a herbivore. 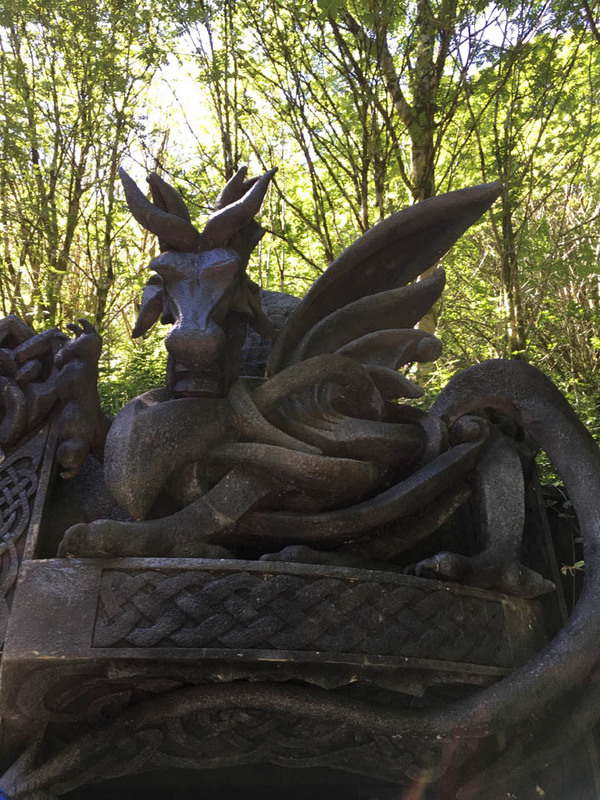 Dragon over the entrance to King Arthur’s Labyrinth (previously a slate mine). 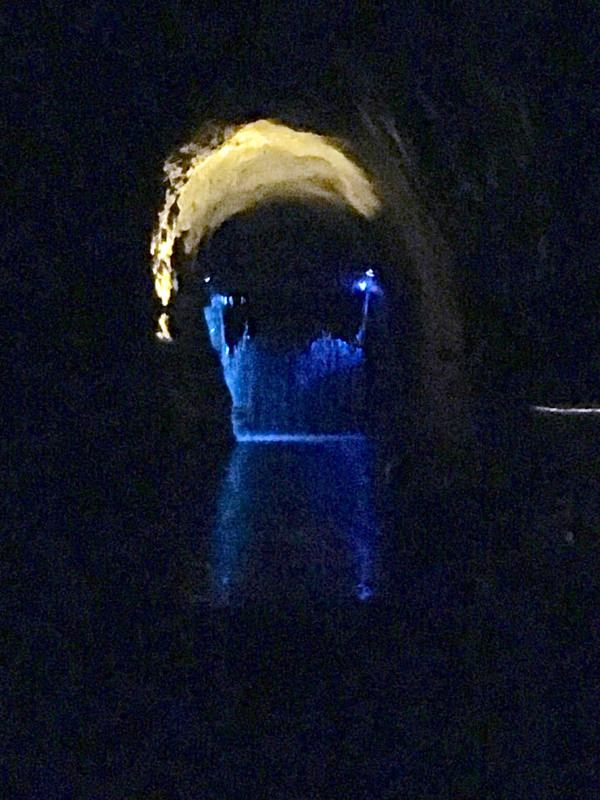 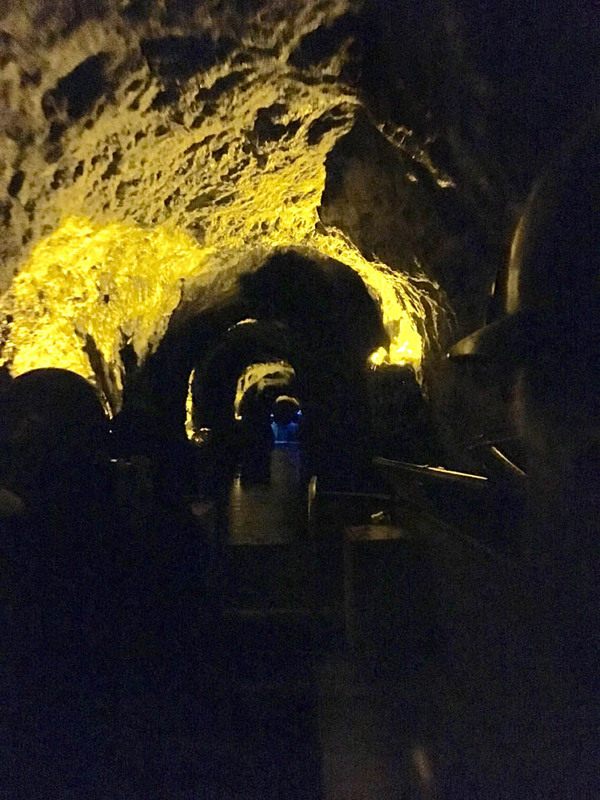 View from the boat of the waterfall ahead …the gateway between worlds. 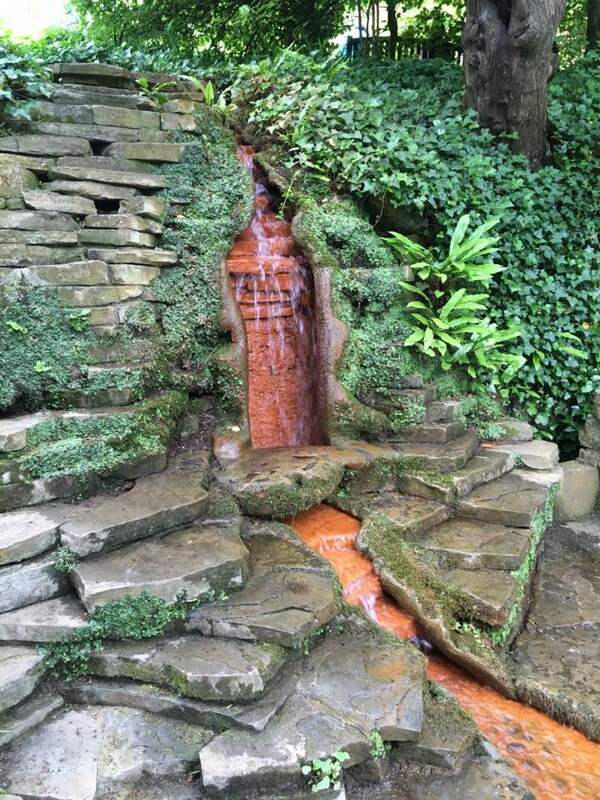 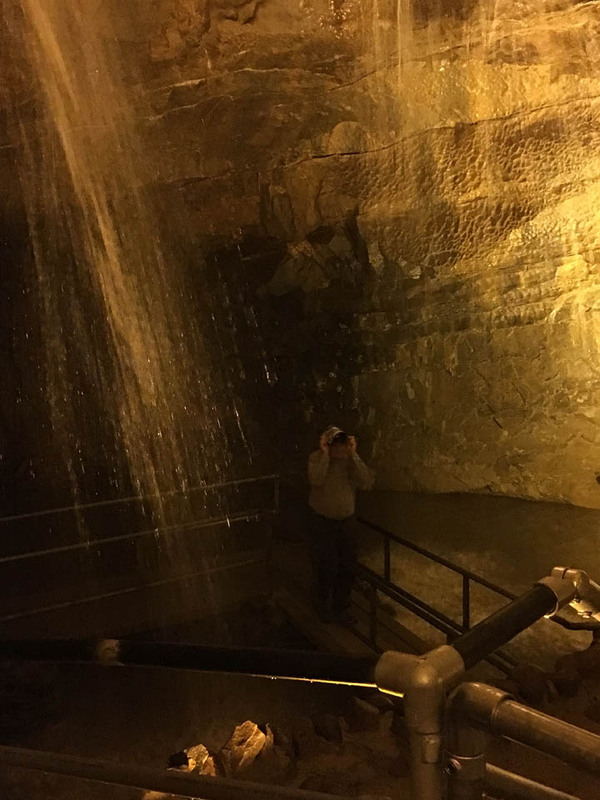 The waterfall with pretty lighting. 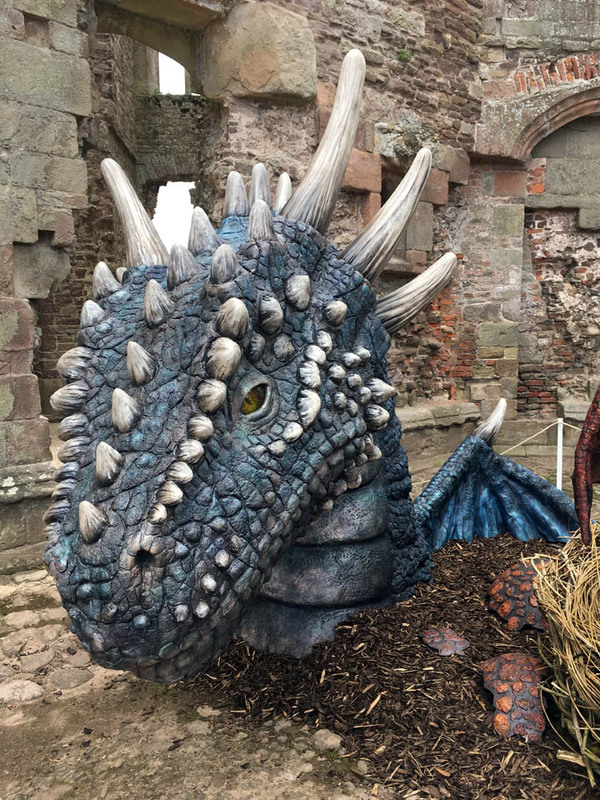 The story of Merlin’s prophecy re the red and white dragons. 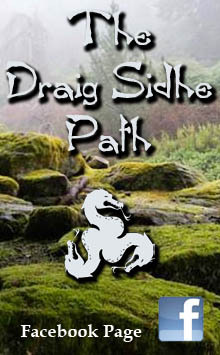 The Dragon Project Trust www.dragonprojecttrust.org — Researches into rumours about the power and properties of ancient “sacred” sites. 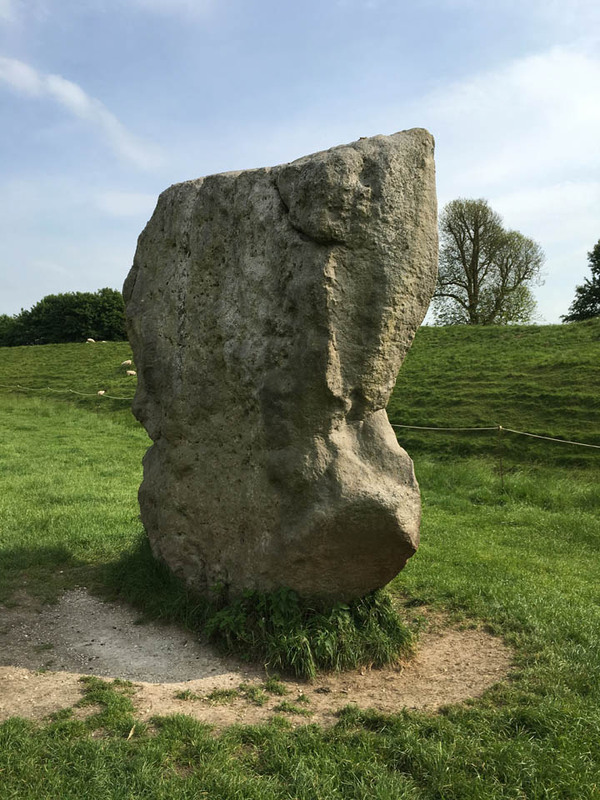 Trail of the White Dragon: Part 1 — Wayland’s Smithy, Part 2 — Uffington Chalk Horse, Part 3 — The Avebury Egg. 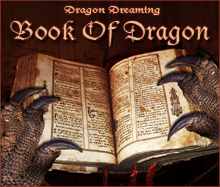 I also came across this interesting bit of info in the “Google Books” preview of “The Return of the Serpents of Wisdom”, by Mark Amaru Pinkham, 1997 (on page 80 in Chapter 4 – THE WORLDWIDE DRAGON CULTURE pp70–109). 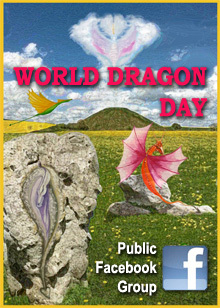 The Dragon Culture arrived in the British Isles via sea and land routes taken by the Iberians, the Egyptians, the Tuatha de Danaan and the Pheryllt. 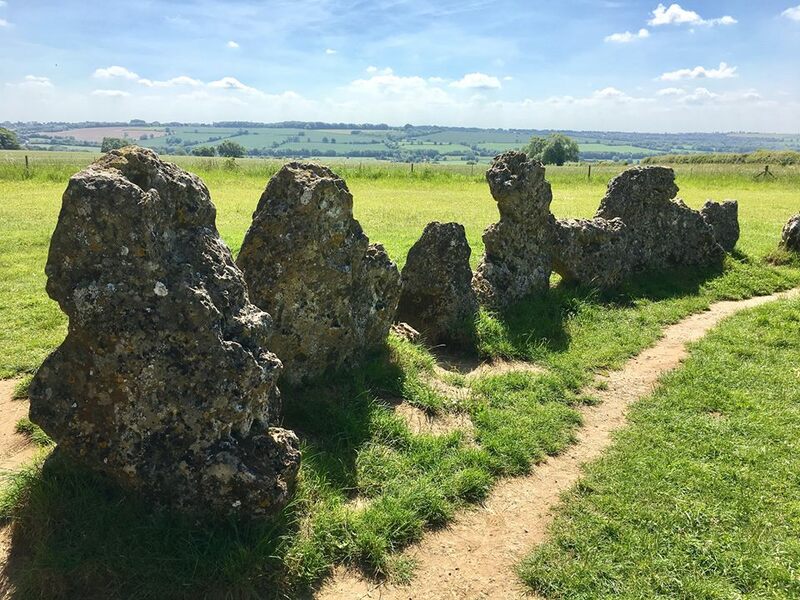 Together these migrant Serpents of Wisdom covered the British dragons’ lairs with stone circles, mounds, menhirs and tors (earthen mounds). 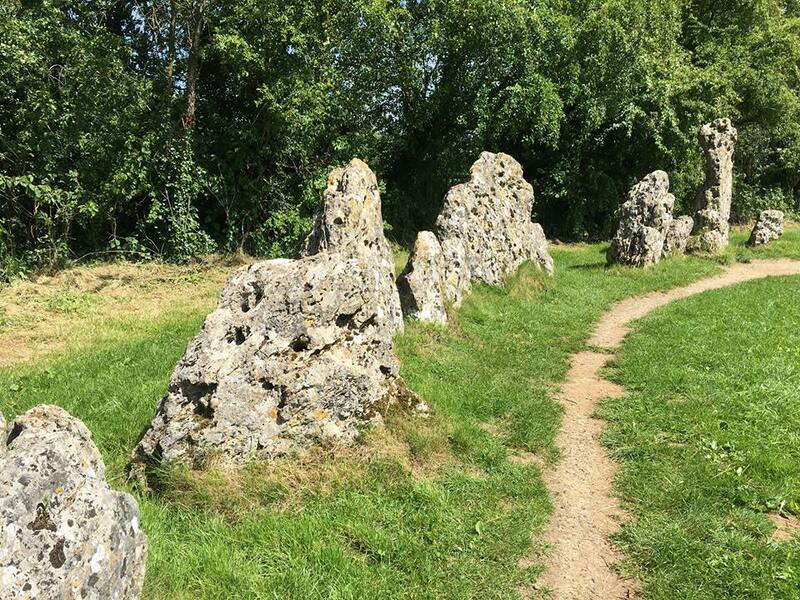 The tors were manifestations of the mound form of the Primal Serpent and the stone circles were conceived of as being “Temples of Keridwen” or homes of the Serpent Goddess. 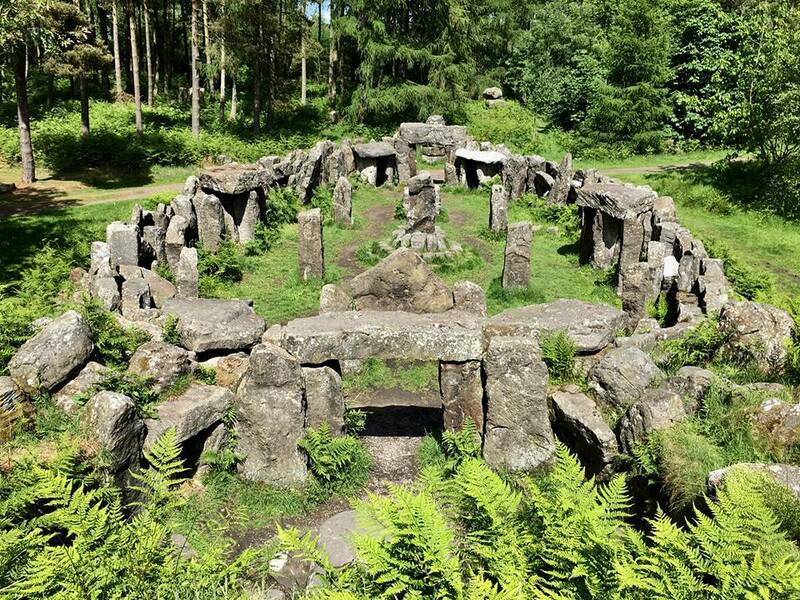 The British megaliths were all united by Ley Lines (the english term for dragon lines) into Dragon Communities. 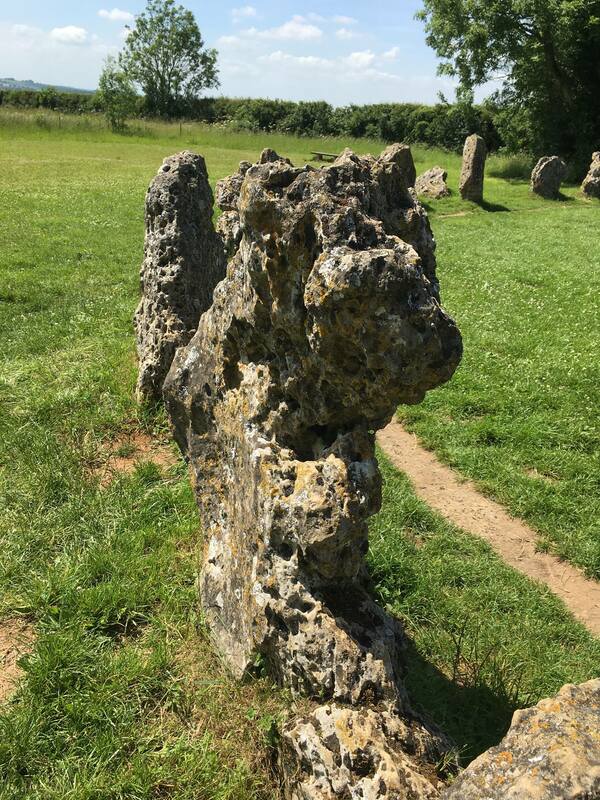 These Dragon Communities were in turn eventually amalgamated into one national British Dragon Community which included the communities of Stonehenge, Avebury, Glastonbury, Bath, and those on the sacred islands of Man, Wight, Iona, and Anglesey. 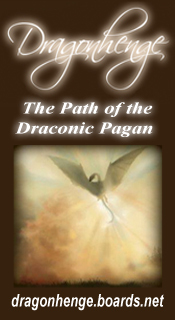 This landmark book brings together the lineages and teachings of the spiritual masters around the world whose symbol has been the serpent or dragon. 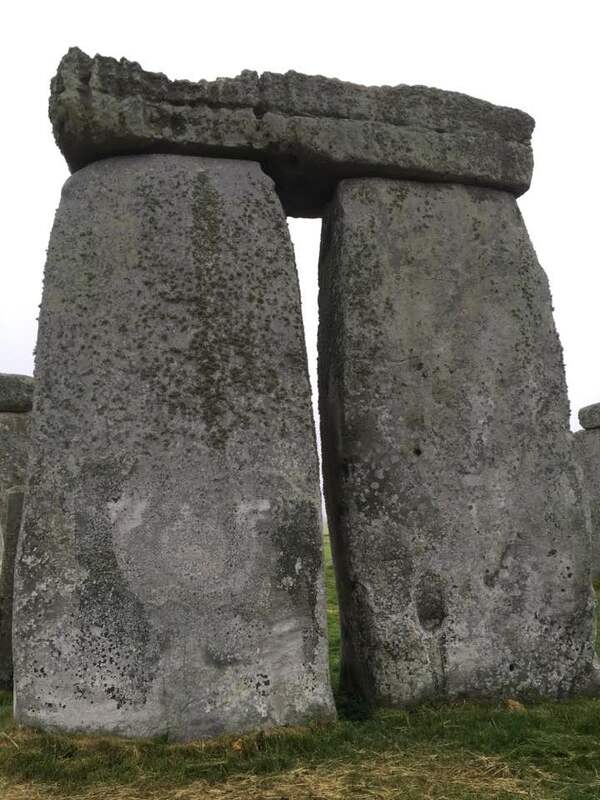 The book traces the fabled beginnings of these adepts from the legendary continents in the Atlantic and Pacific Oceans, to their later occurrences as the pyramid builders, priest kings and hierophants of pre-Christian cultures around the globe, and finally to their clandestine manifestation as the Secret Societies of Europe, within which they orchestrated the overthrow of the British rule and the eventual founding of the United States of America. 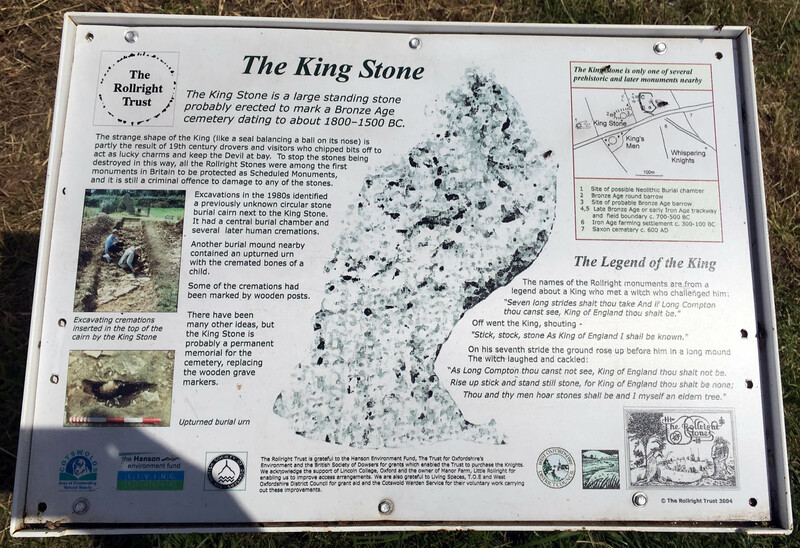 This entry was posted in Dragon Energy, Dragon Magick and tagged Arbor Low Stone Circle, Avebury Stone Circles, Castlerigg Stone Circle, Dragon Energy, Dragon Hill, Druids Temple, Gib Hill Barrow, Glastonbury, Glastonbury Tor, King Arthur's Labyrinth, King Stone, Kings Men Stone Circle, Lake District, National Show Caves, Pennines, Raglan Castle, Rollright Stones, Stonehenge, The Hurlers, Uffington Castle, Uffington Dragon, Uffington White Horse, Welsh Dragons, Whispering Knights, Woodhenge, Yorkshire Dales. 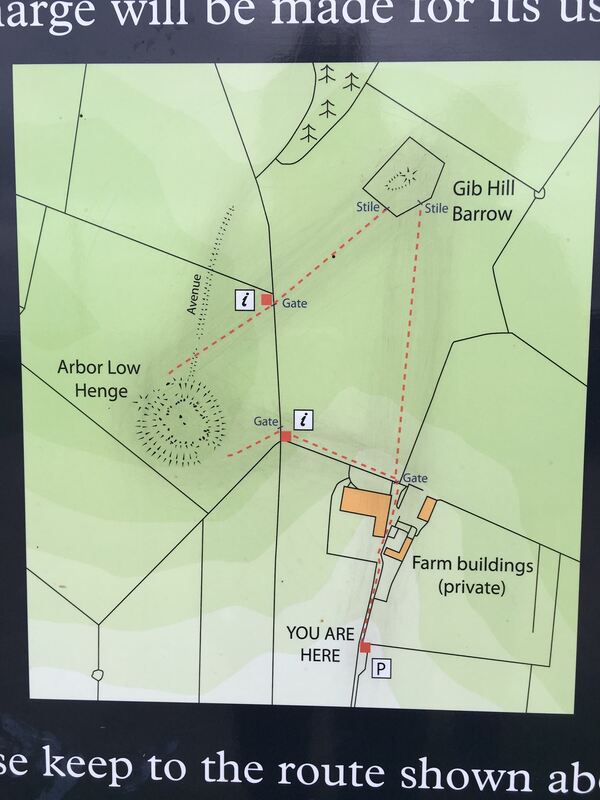 I found your blog by typing “Arbor Low dragon” in Google and making sure dragon was included in the search. 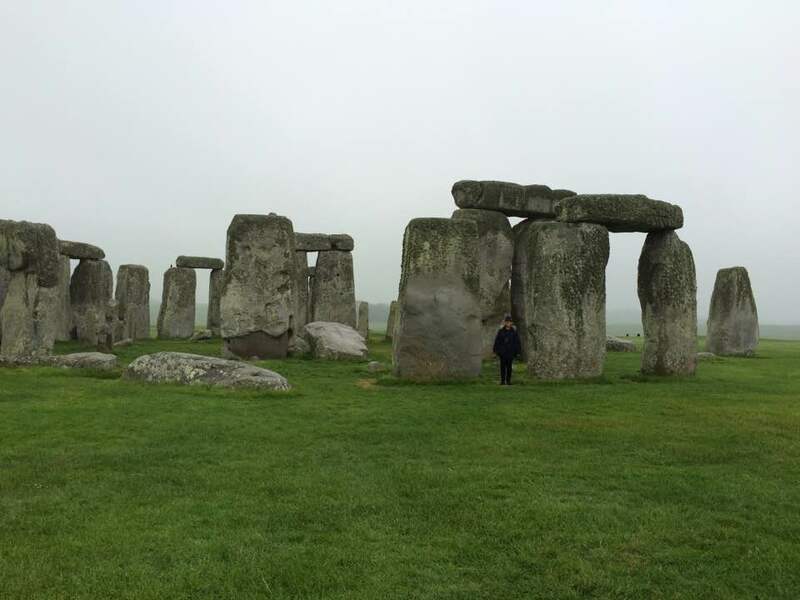 I enjoyed reading your blog. 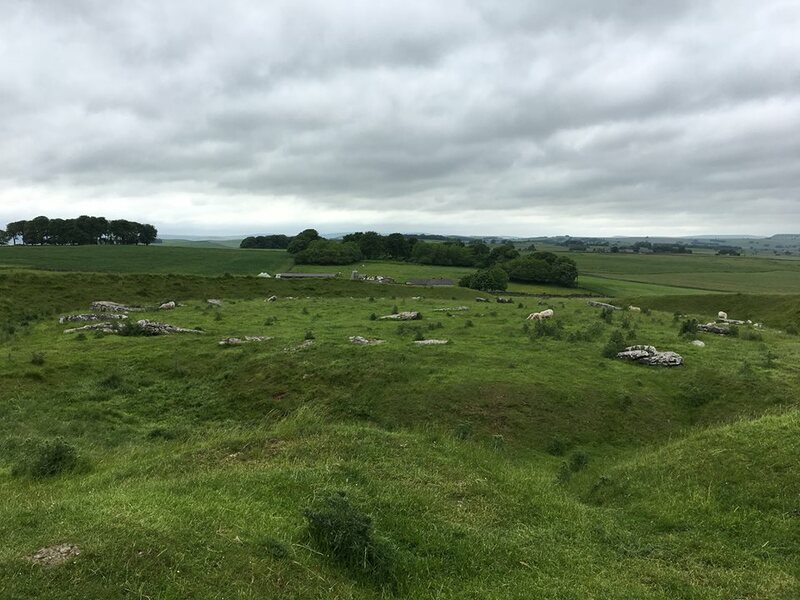 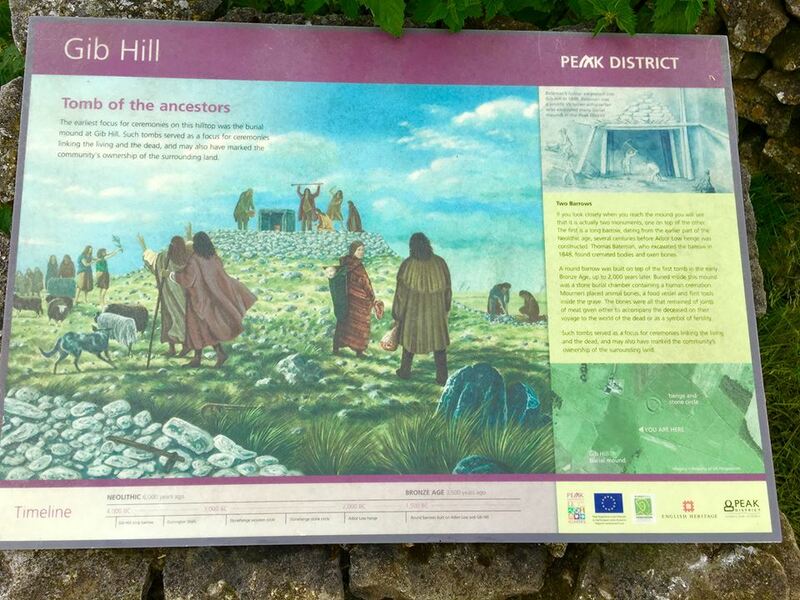 I am lucky enough to have been to all of the places you have listed and am a regular visitor at Arbor Low where I practise magic alone and with a group. 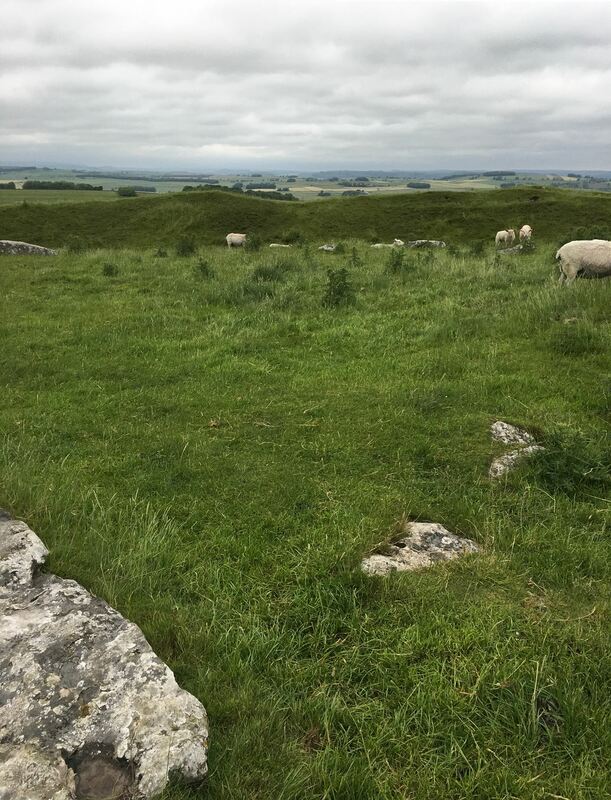 There is a dragon at Arbor Low. 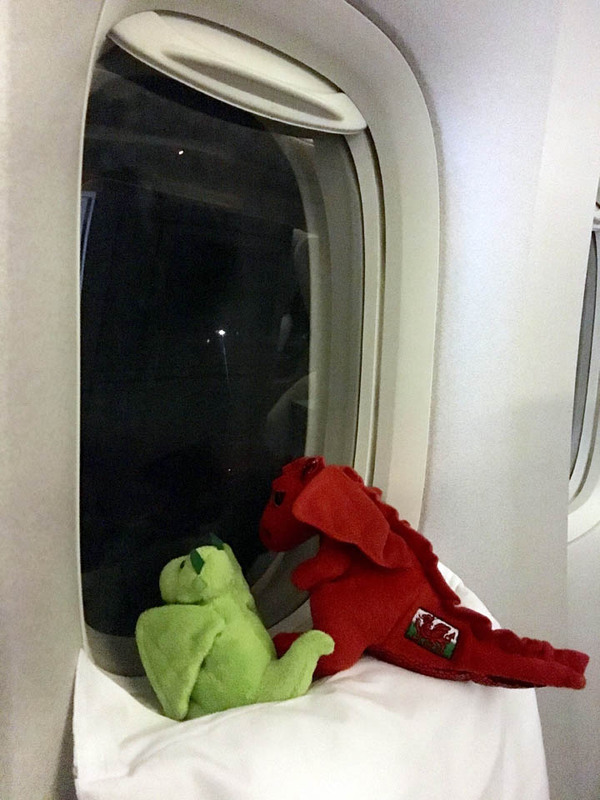 If you think of Dragons as elements it is air. 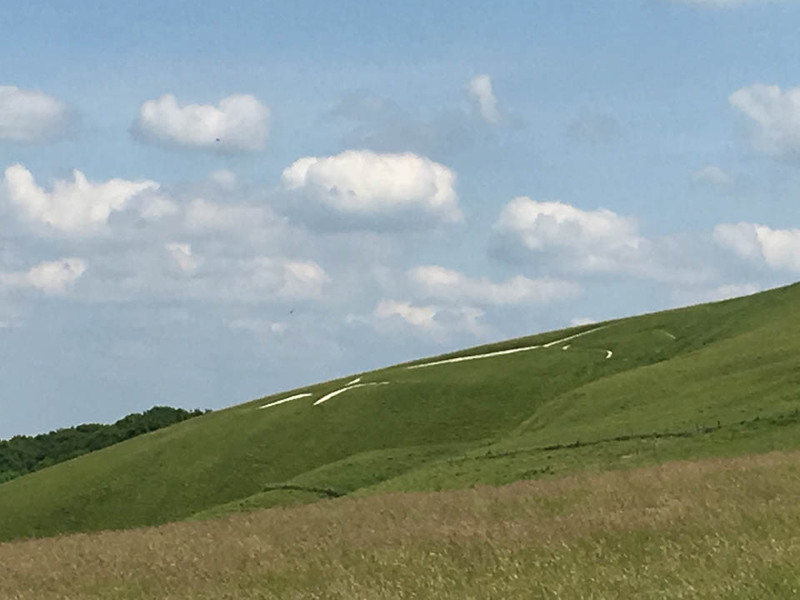 The dragon has a name and I have had it with me at Uffington and in South Wales. 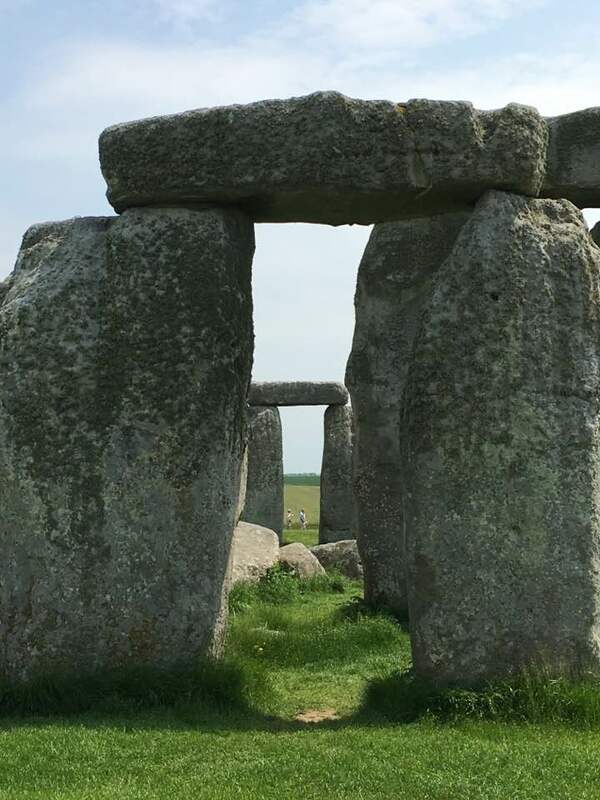 I have summoned it at Uffington twice as part of a banishing ritual. 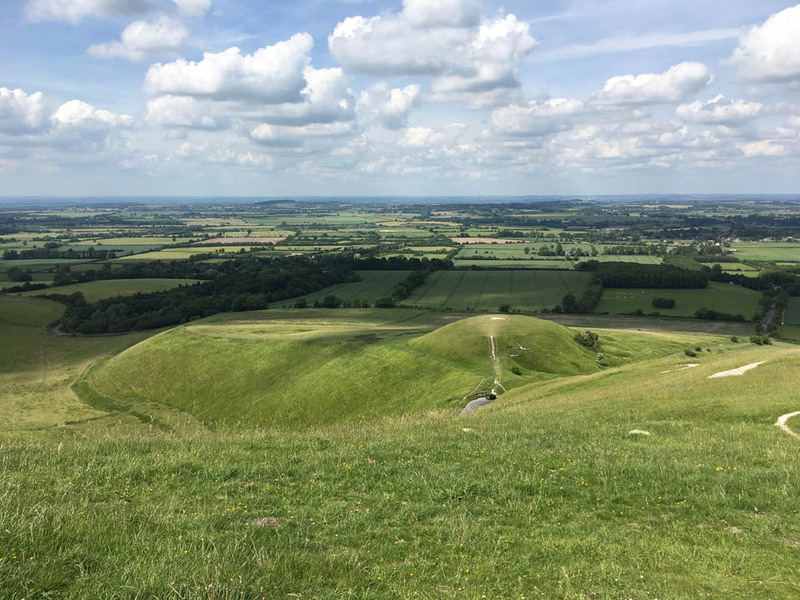 It’s easy there as Uffington hill as you correctly say is not a horse. 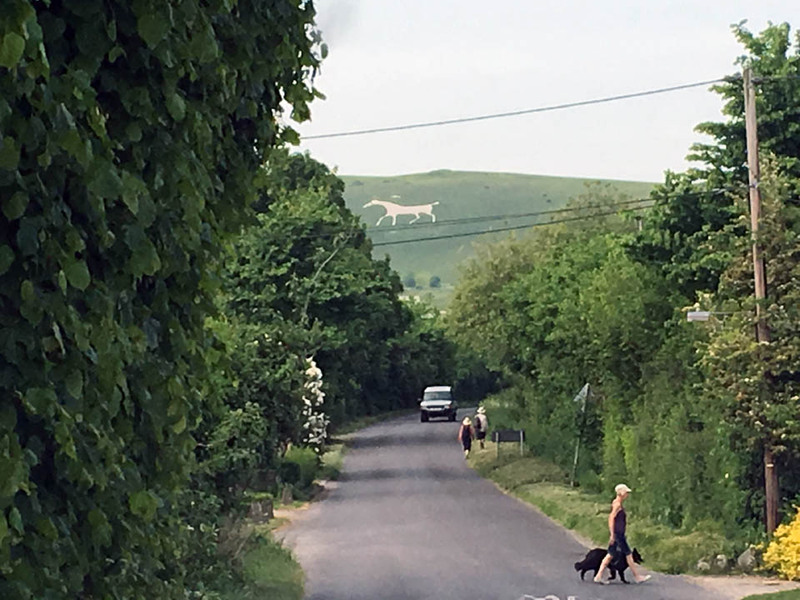 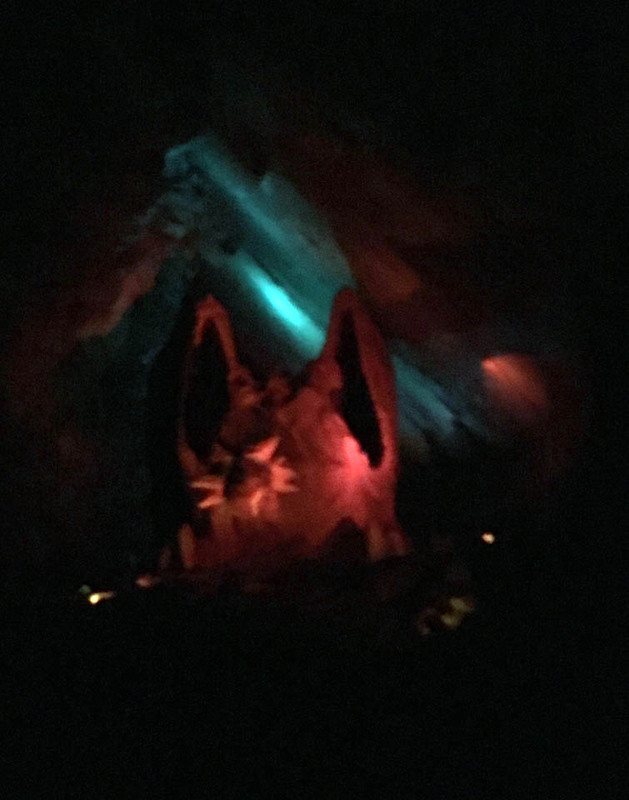 The whole hill is in fact a dragon. 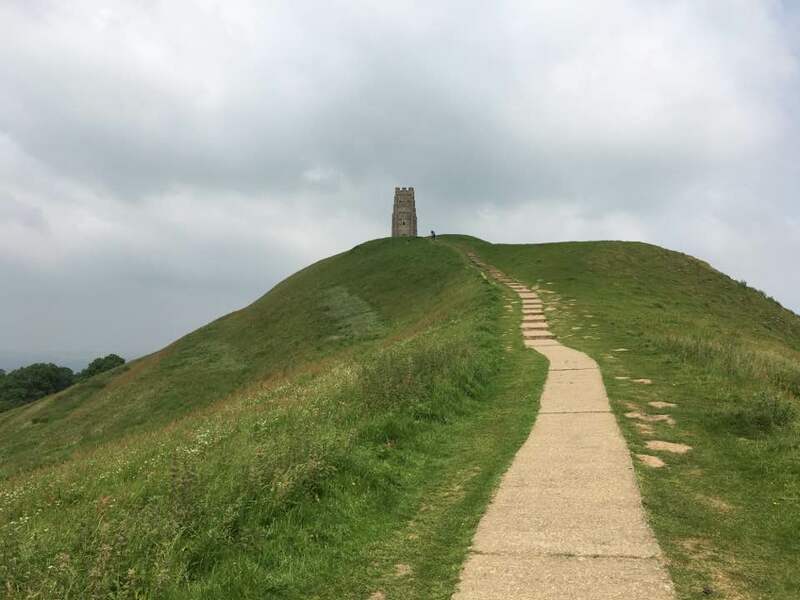 Dragon Hill is it’s eye. 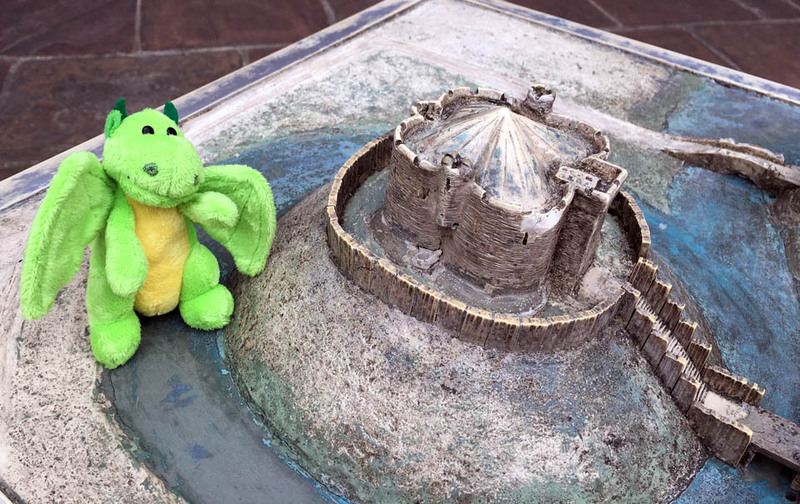 The time I had the dragon with me in South Wales was with 15 or so other people and we were all summoning dragons that day. 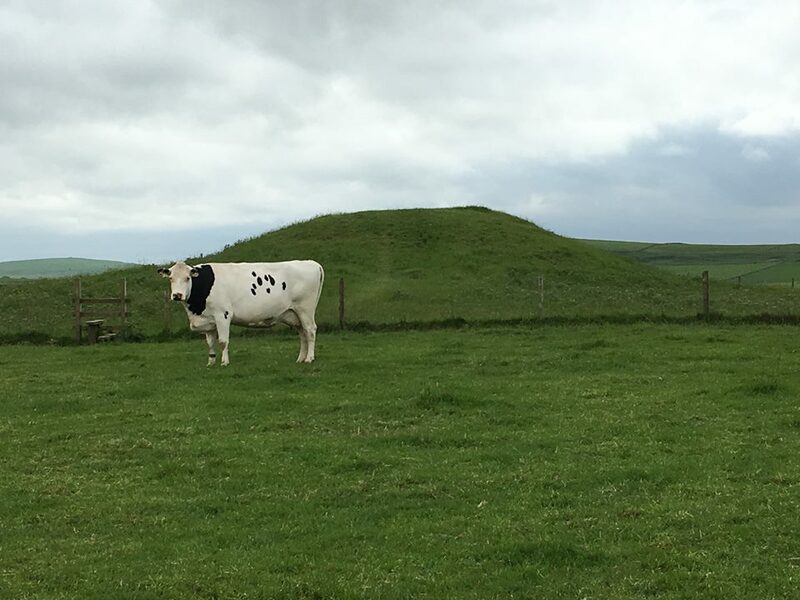 The one at Arbor Low came to me again there. 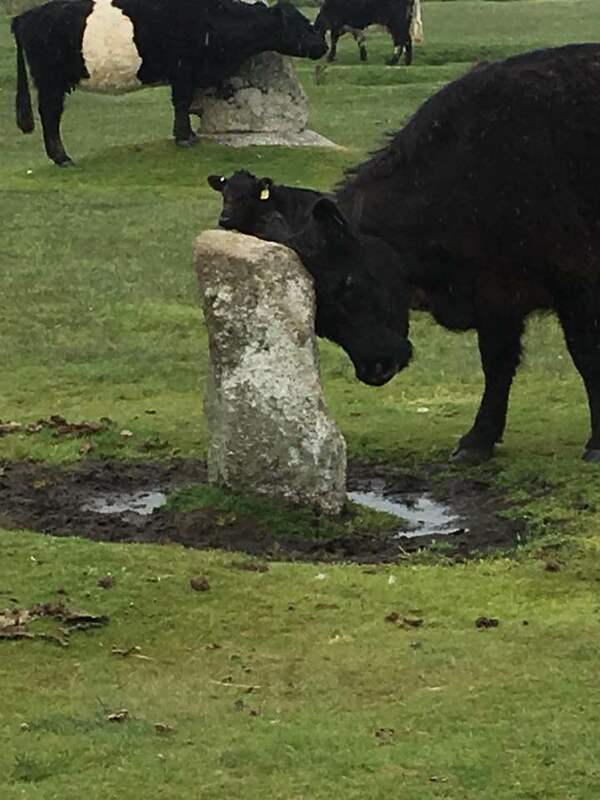 He has a wet nose when there are rainy clouds.